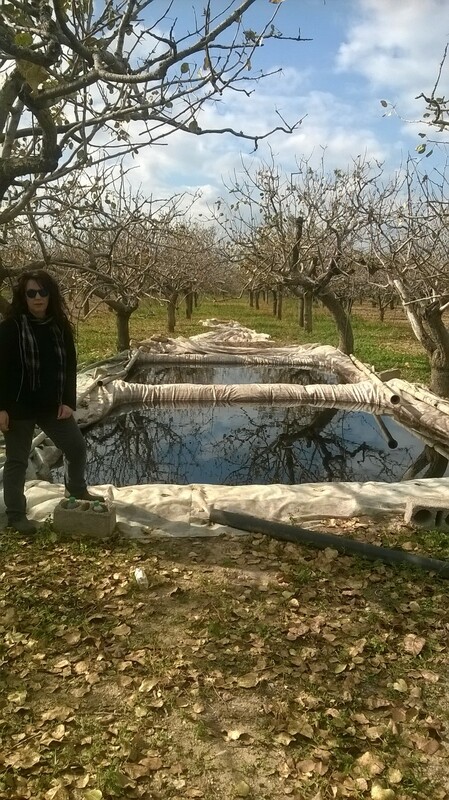 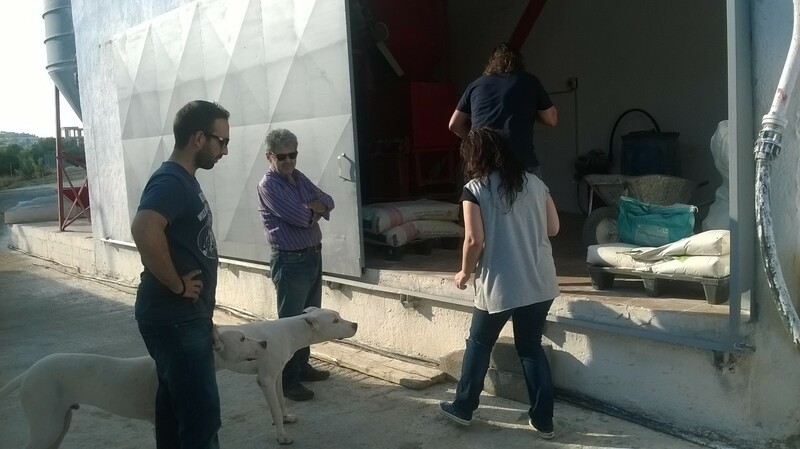 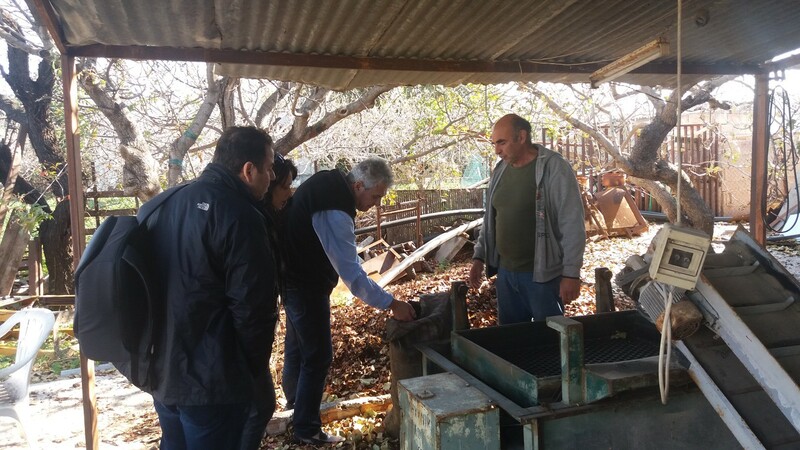 The LIFE-AgroStrat team visited Aegina island, Greece between 15 and 19 November 2016 in order to collect soil, water and waste samples and to compost solid pistachio wastes. 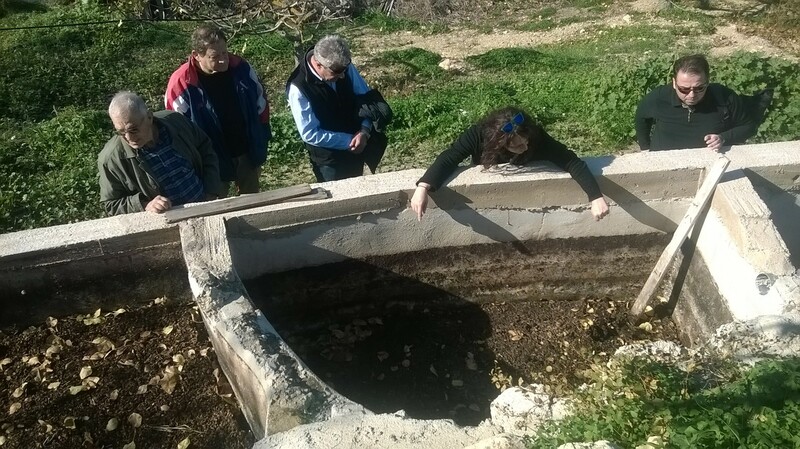 Simple waste management systems were developed by Dr. M. Doula and Prof. K. Komnitsas and implemented at the two pilot fields in Aegina.The first one by constructing three shallow evaporation ponds and the second one by building four sequential collection reservoirs.The systems aim to assist separation of pistachio waste into solid waste and wastewater at field level. 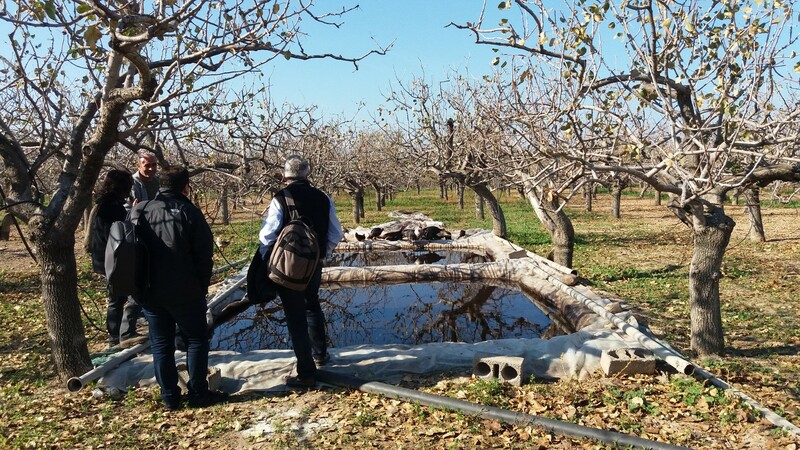 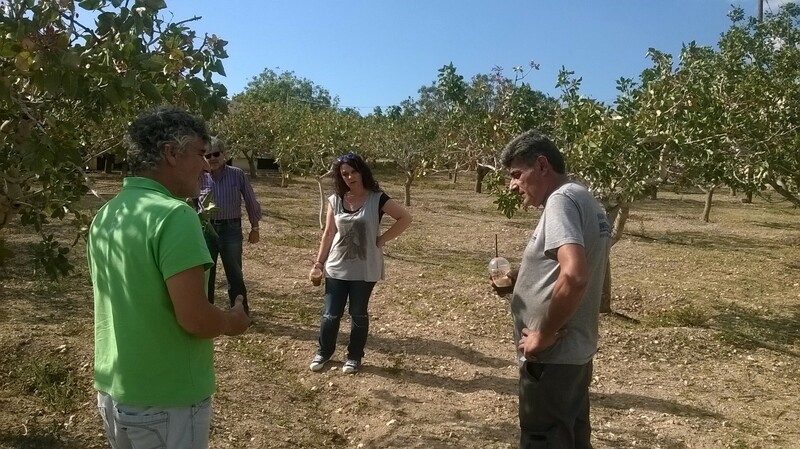 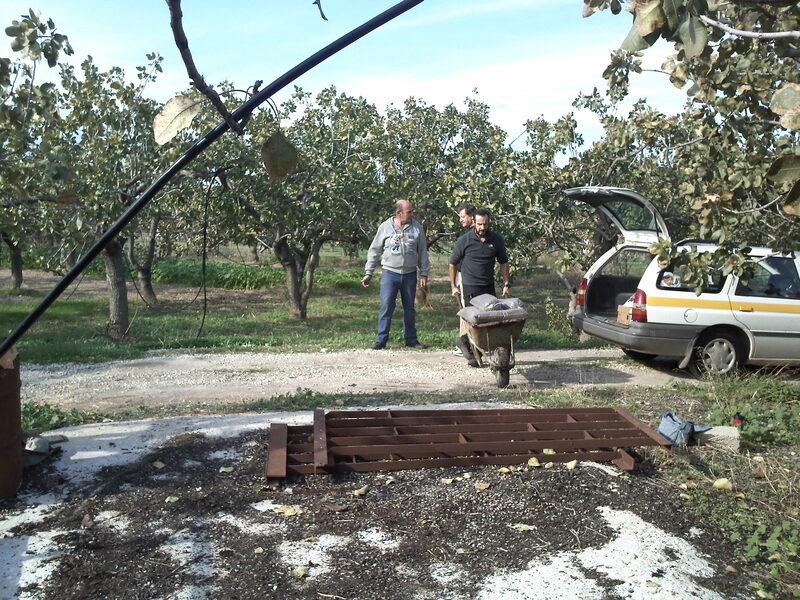 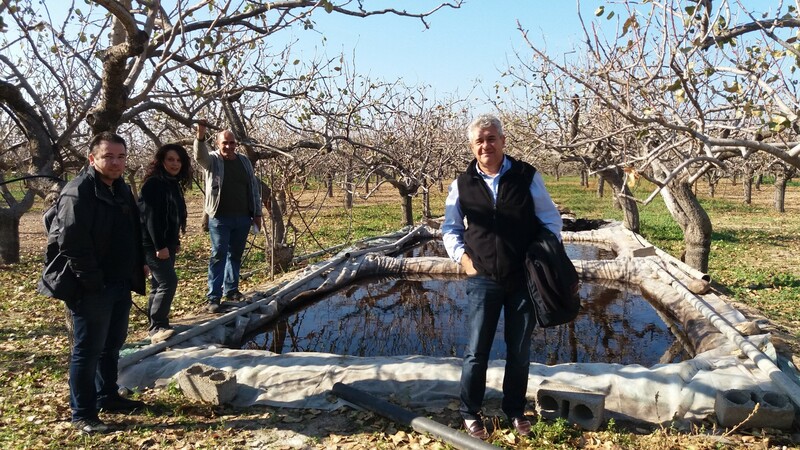 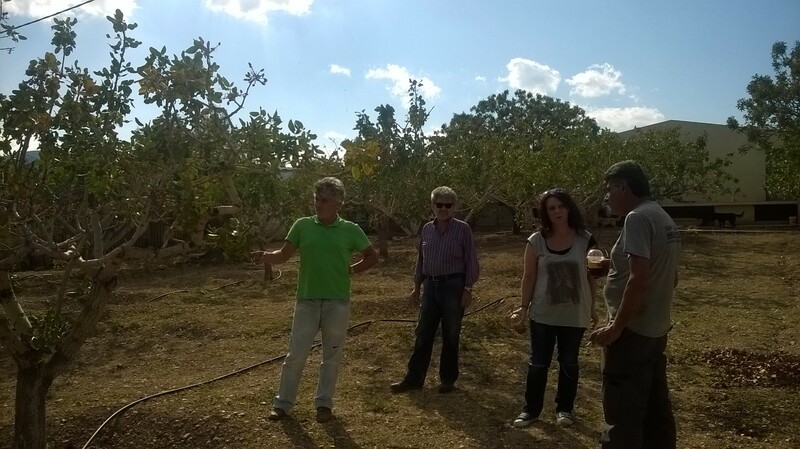 A series of visits took place in September 2016, during which AgroStrat cooperated with pistachio farmers and their associations in Lamia, Makri, Molos (Fthiotida, Central Greece) and Megara (Attiki). 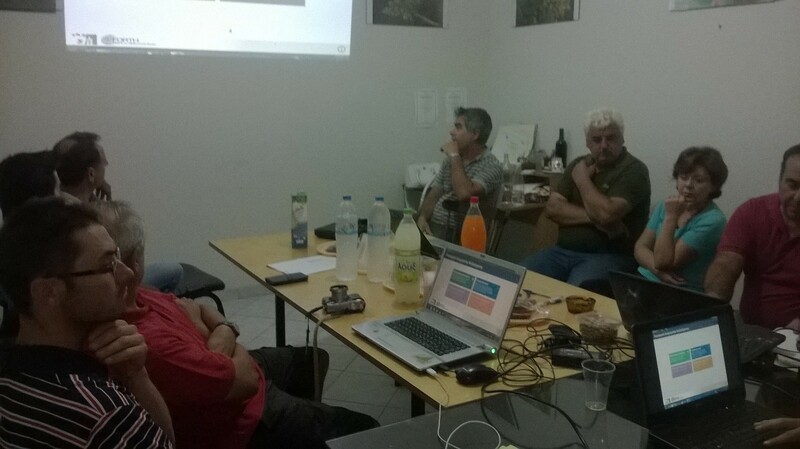 The second sampling visit of AgroStrat at Kilkis, North Greece took place between 13 and 15 July 2016. 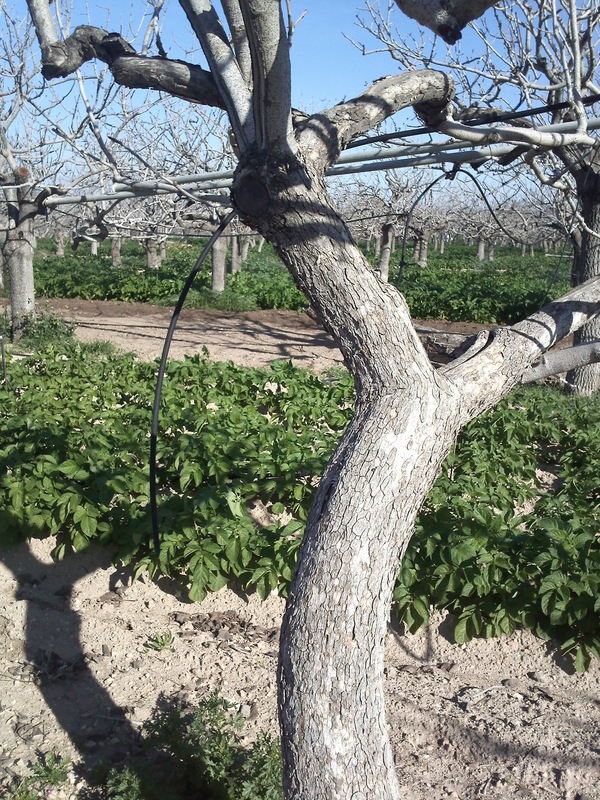 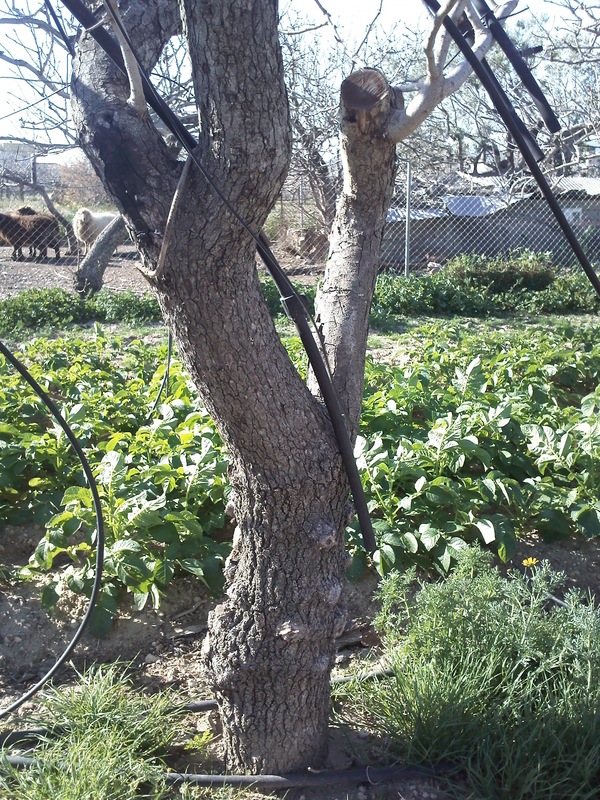 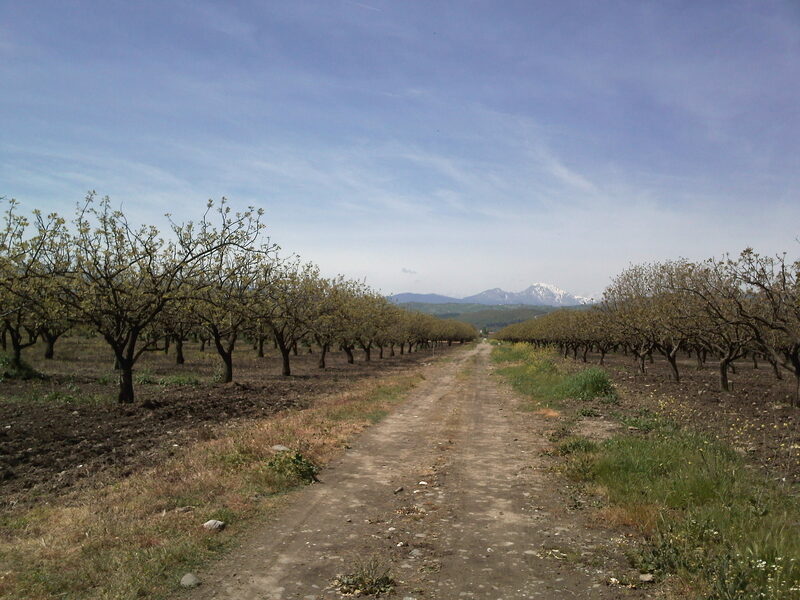 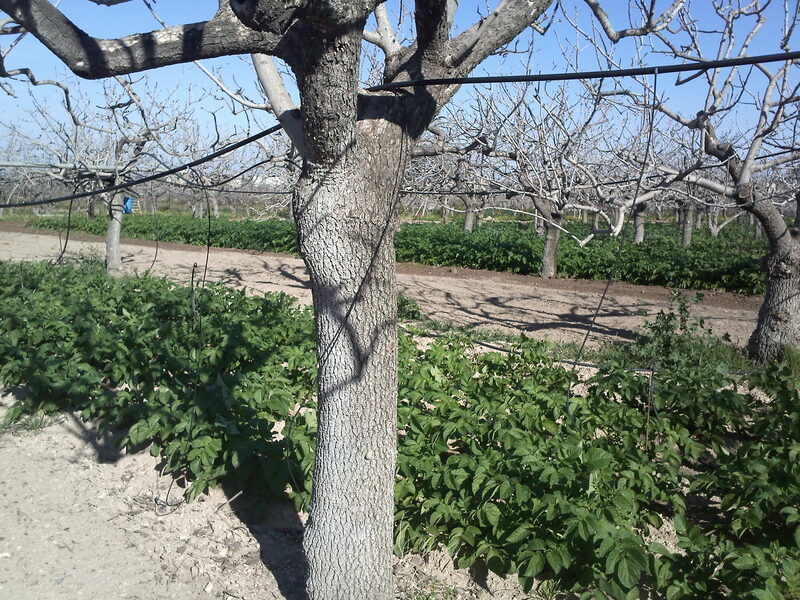 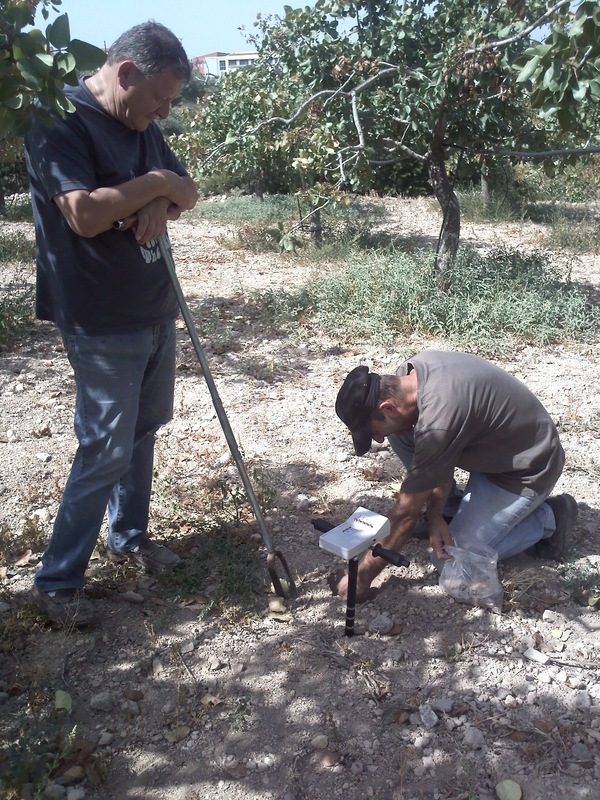 Soil and water samples were collected from local pistachio orchards. 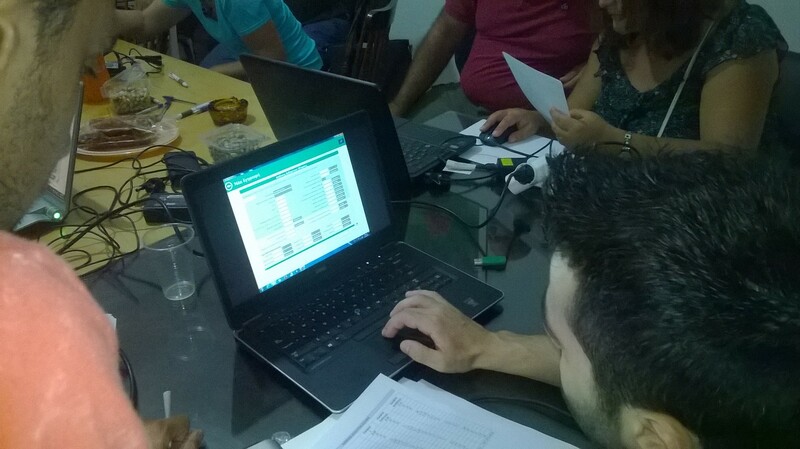 Training of local farmers on the Cultivation Management Software and on the Central Management & Monitoring Tool took also place. 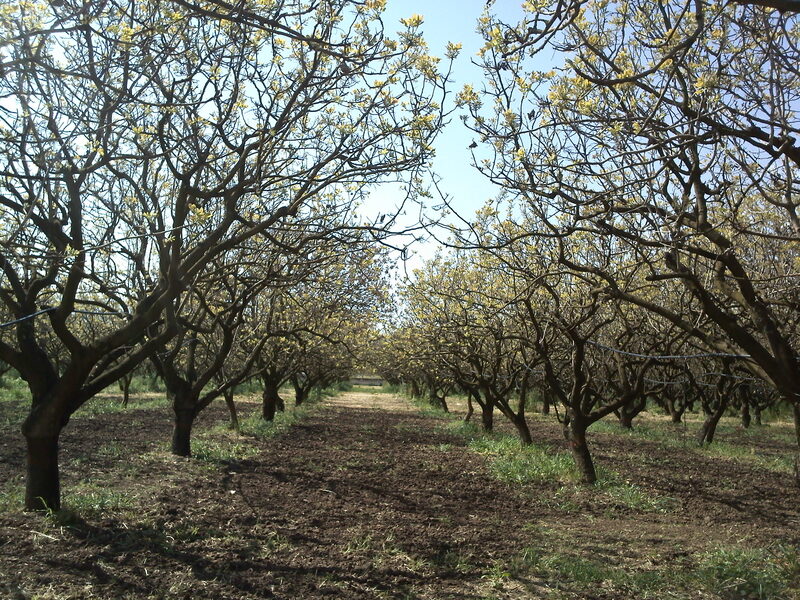 GIS maps were developed to assist the decision on the suitability of land to accept pistachio wastewater. 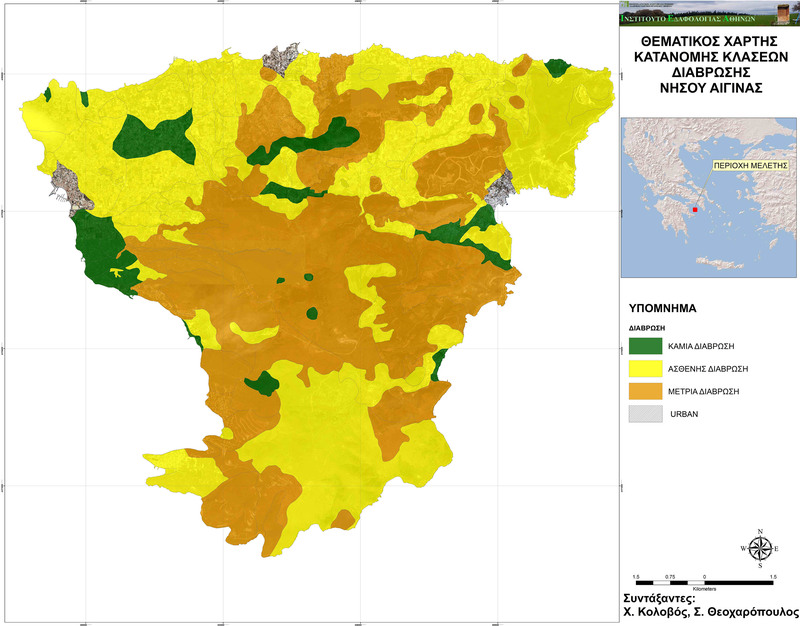 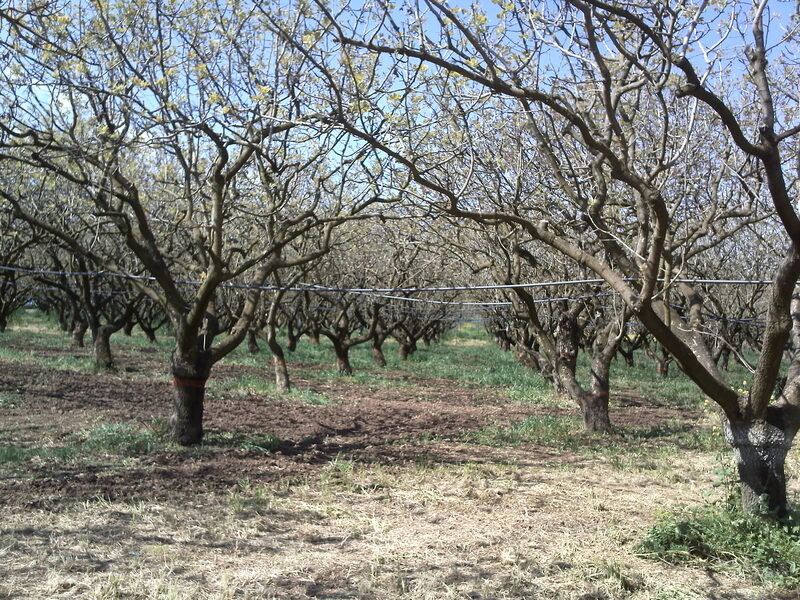 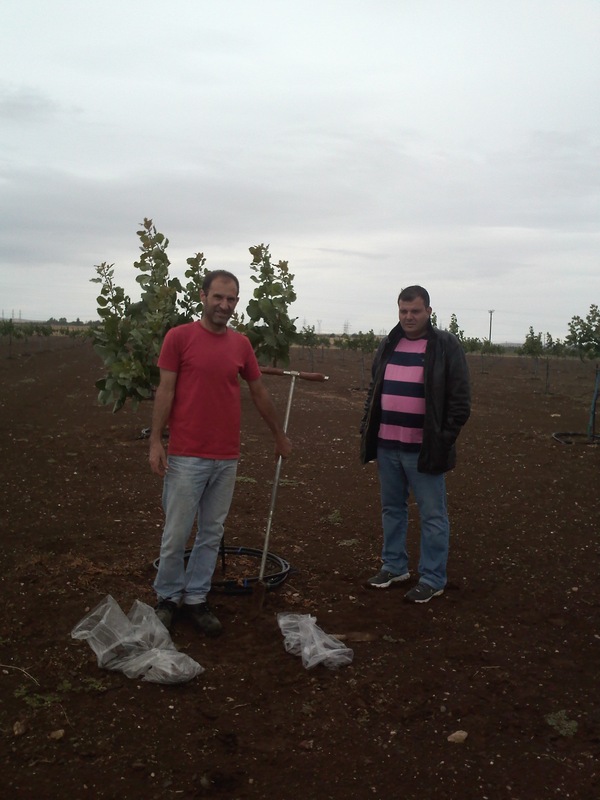 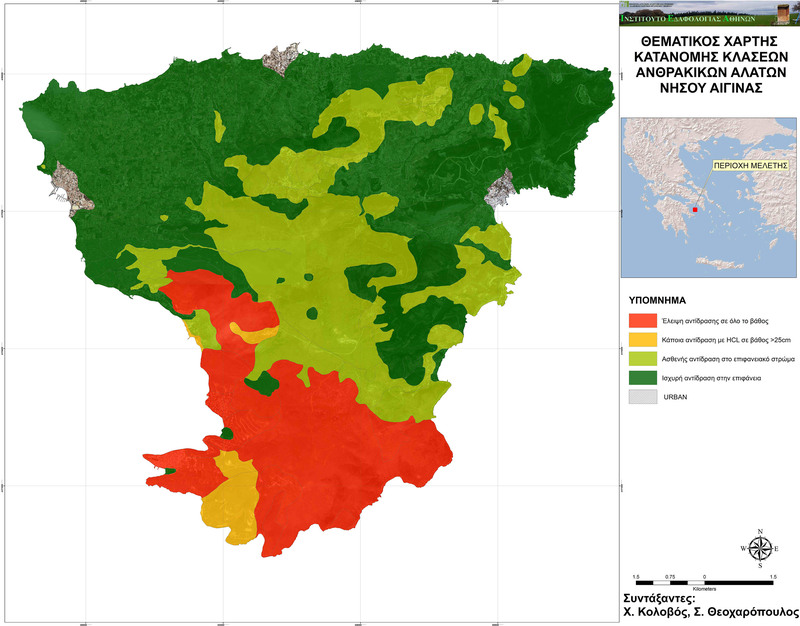 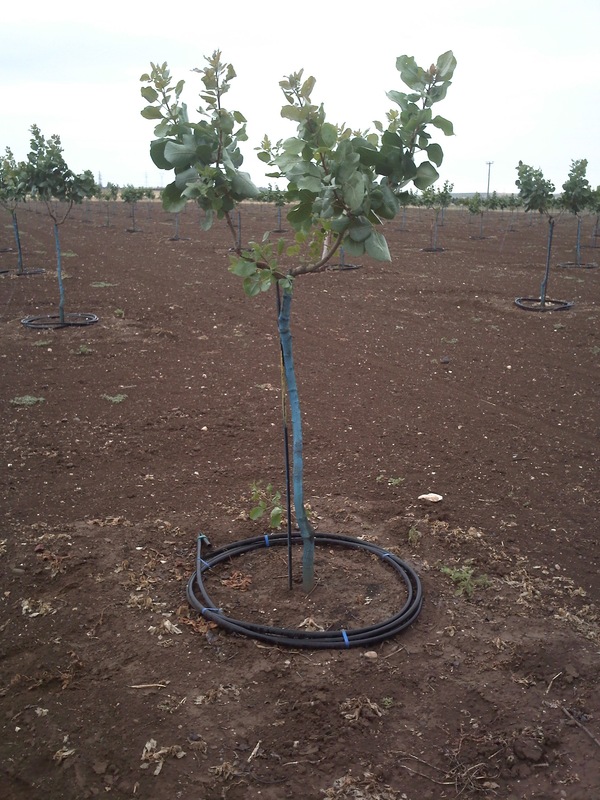 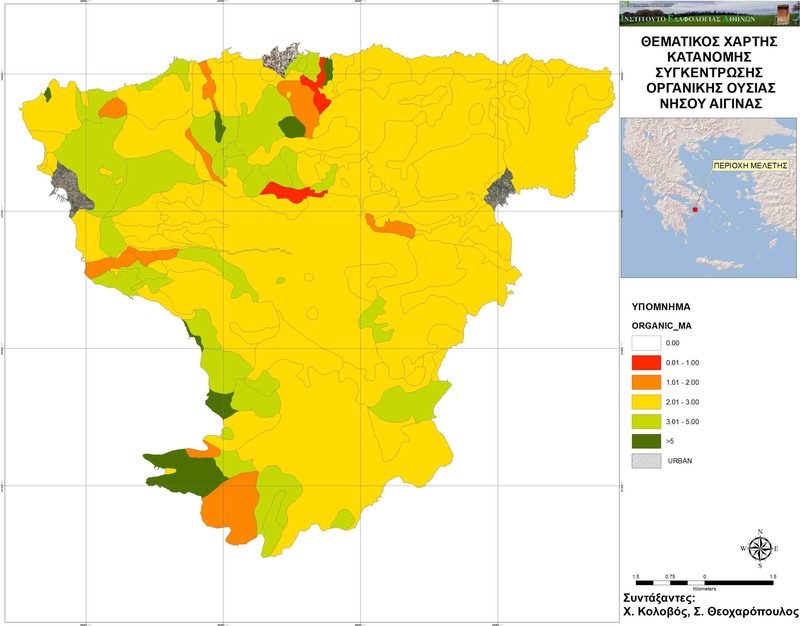 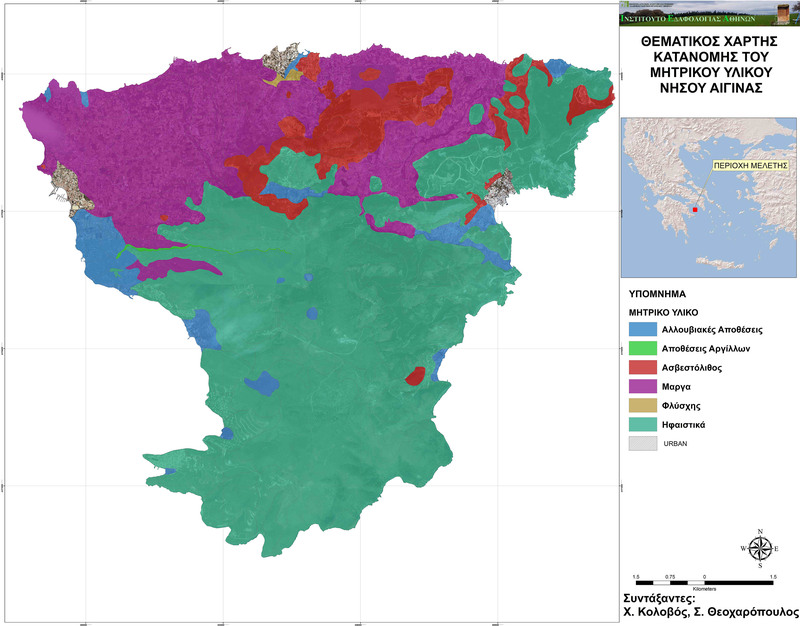 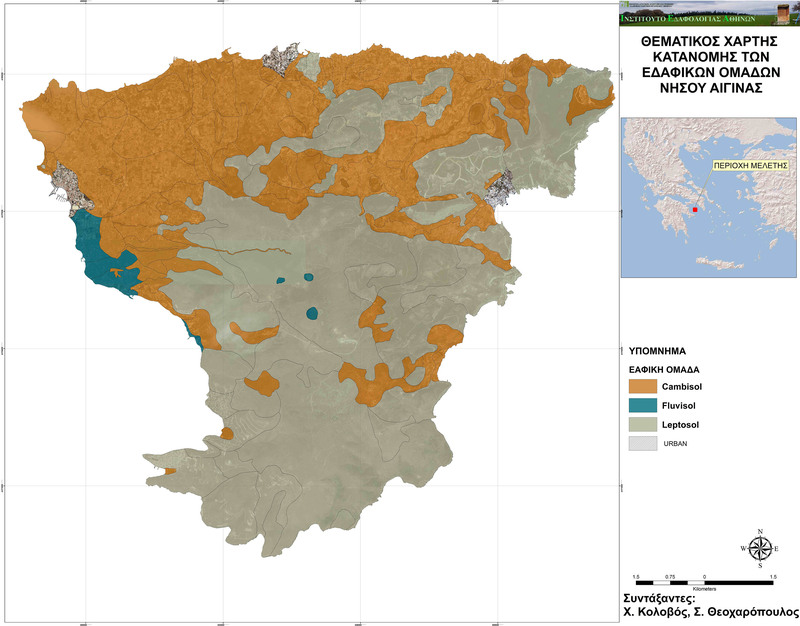 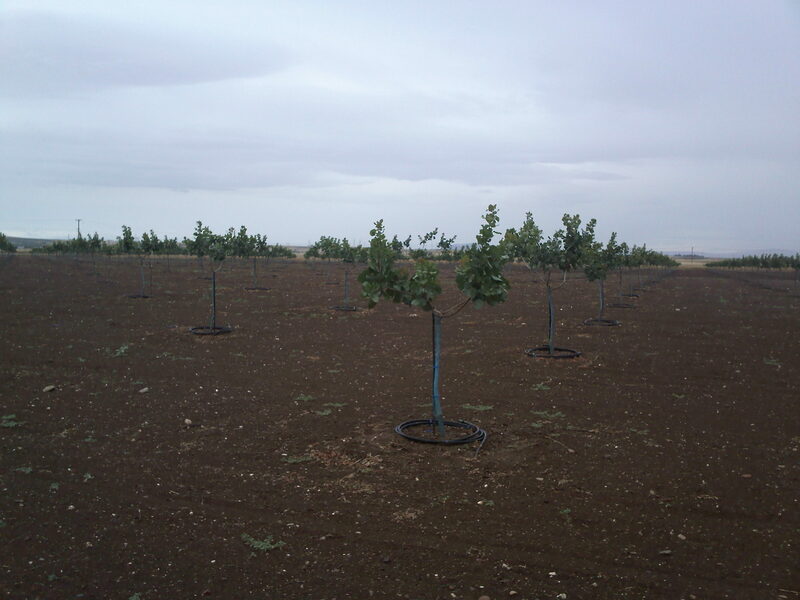 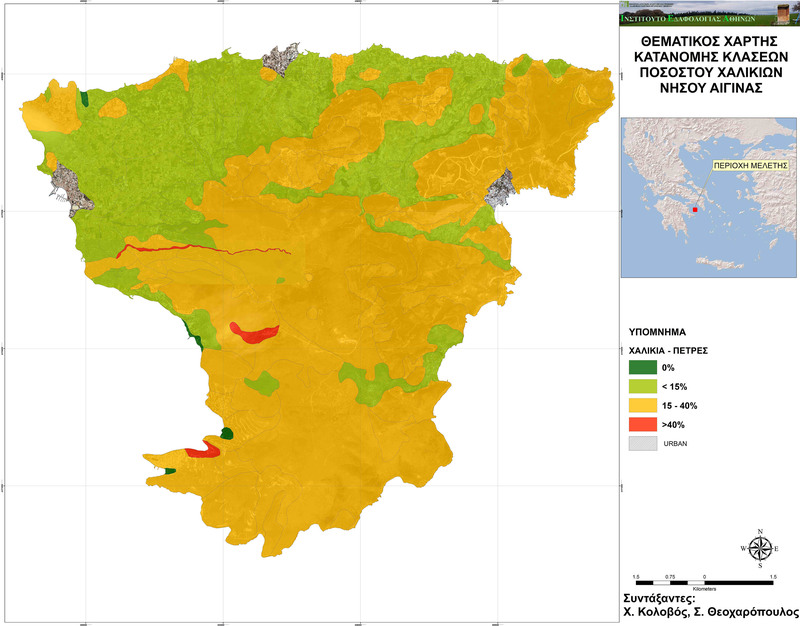 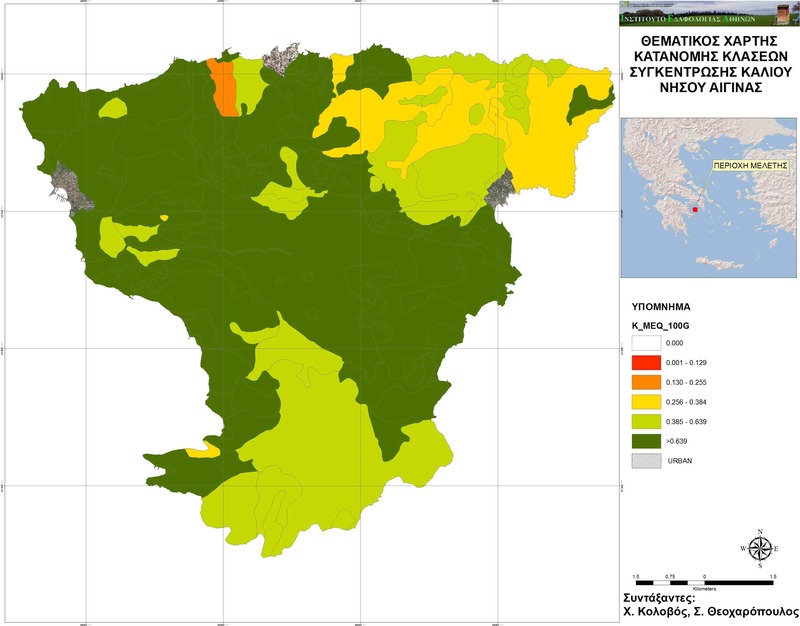 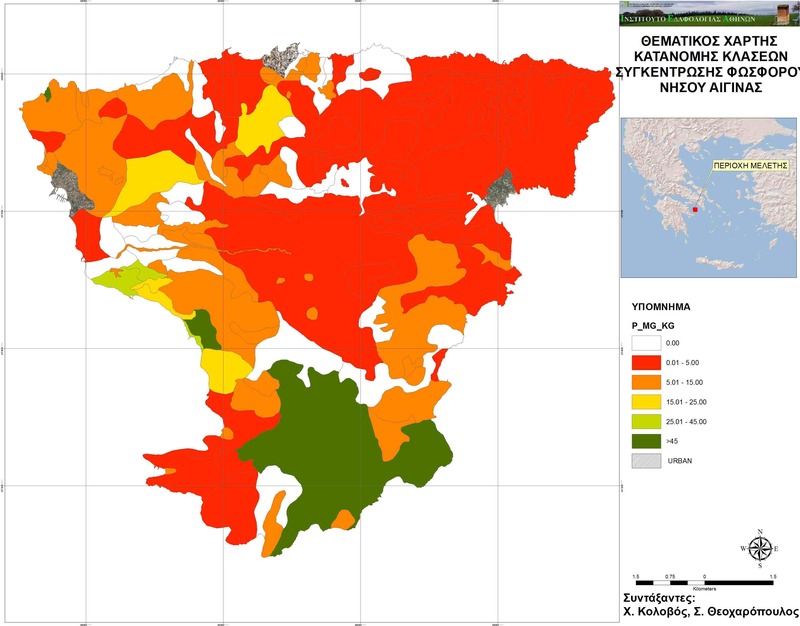 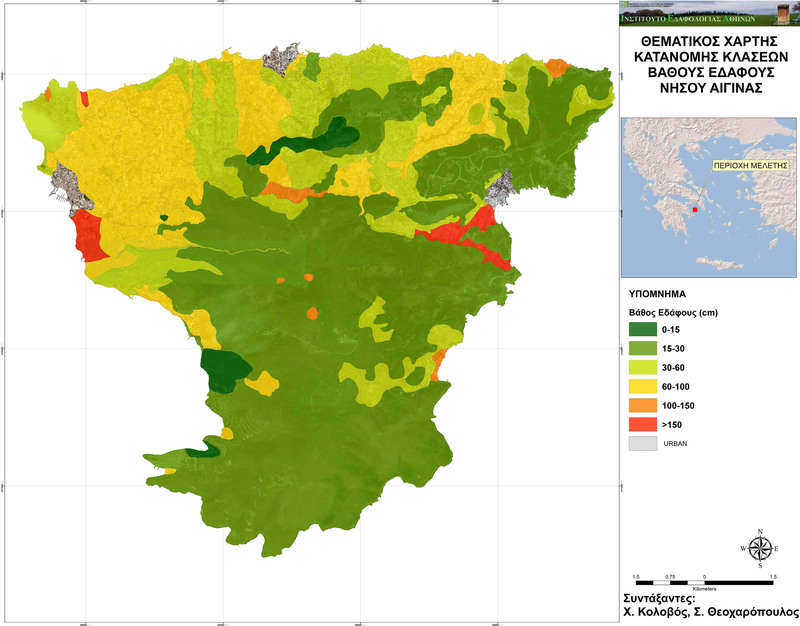 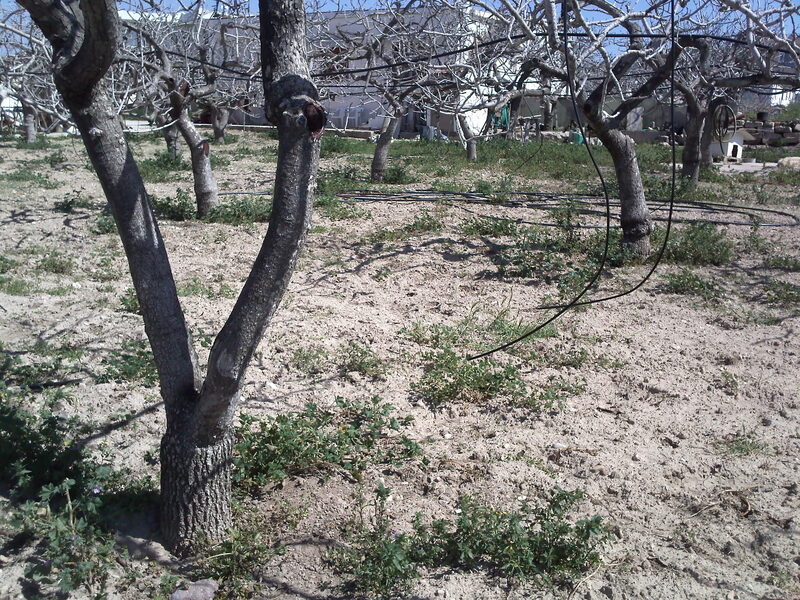 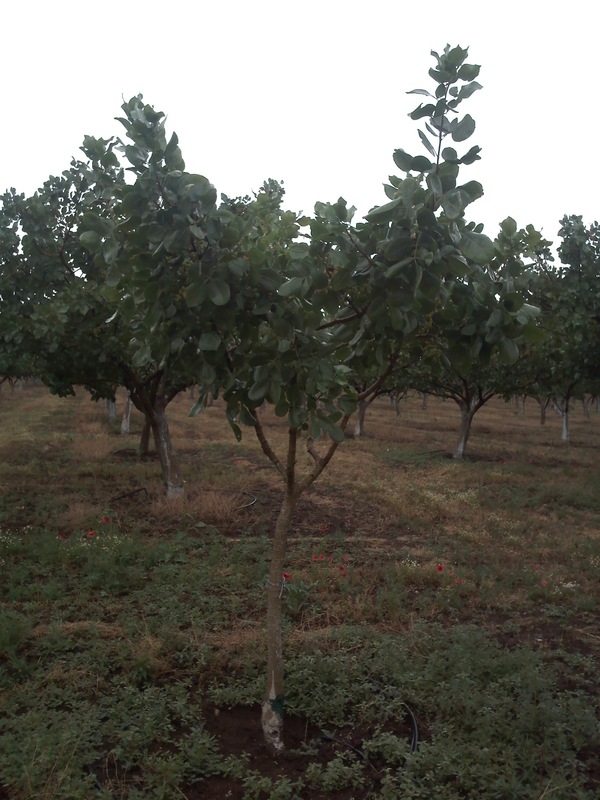 Suitability maps were developed for each one of the soil parameters that were found to be affected mostly by pistachio wastes, as well as for the natural areas characteristics (i.e. 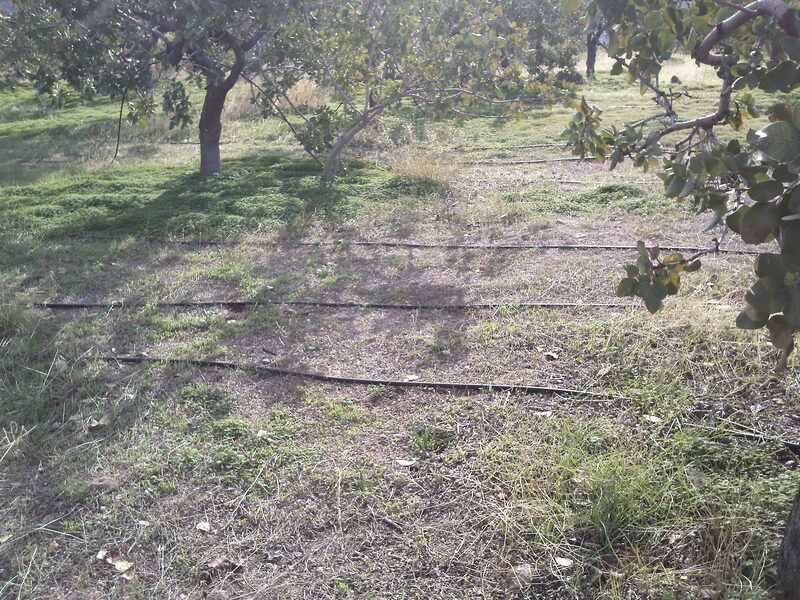 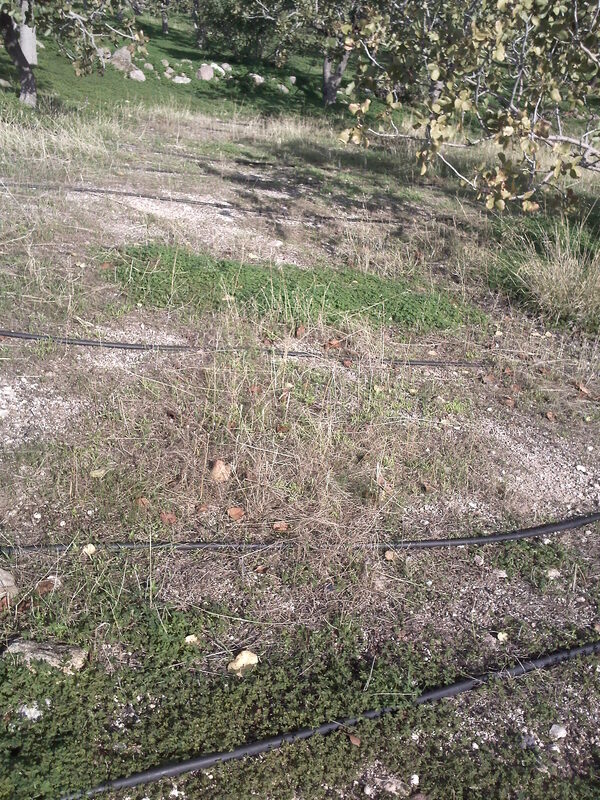 slope, drainage, etc). 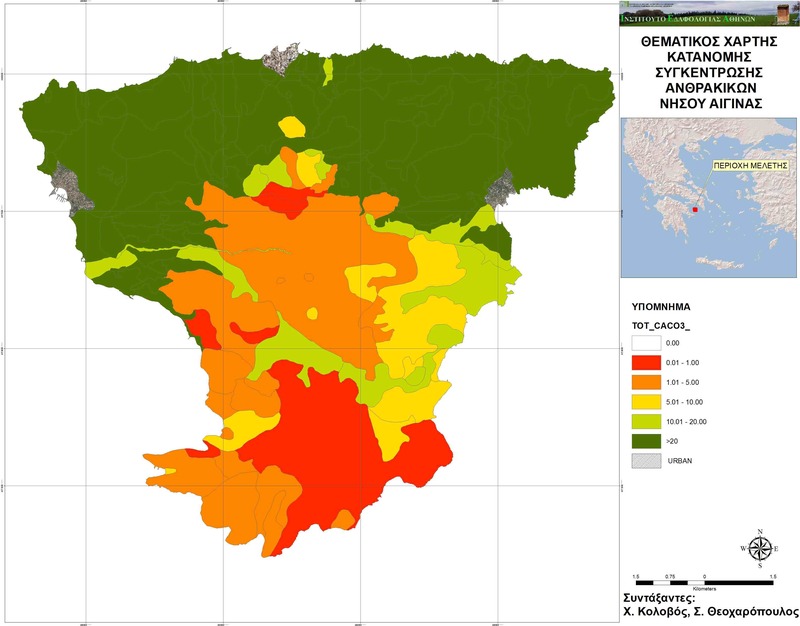 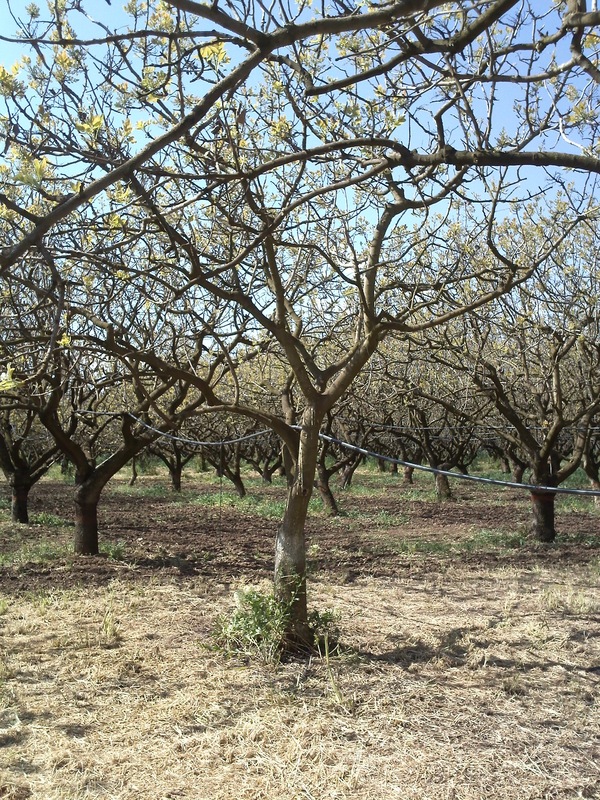 Considering the specific limitations for these characteristics and parameters, the overall Land Suitability Map for pistachio wastewater landspreading was developed. 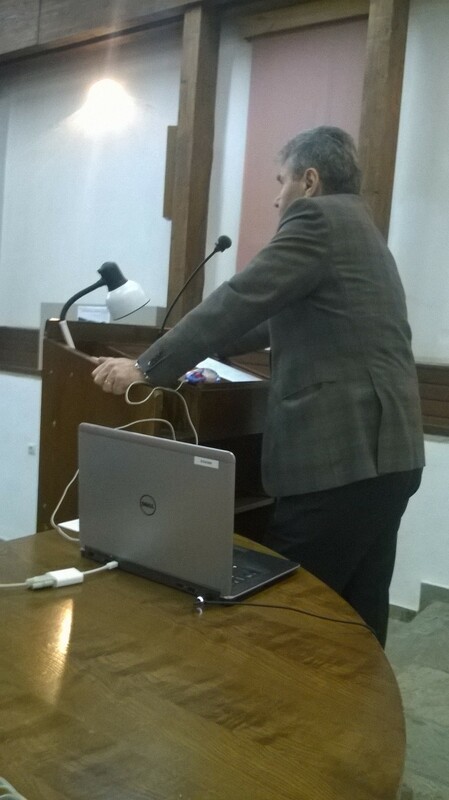 The methodology for land evaluation and categorization into suitability classes was that of FAO (1976)#. 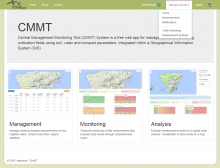 Maps are included in the Cultivation Management Software to assist decision making regarding reuse or disposal of pistachio wastewater. 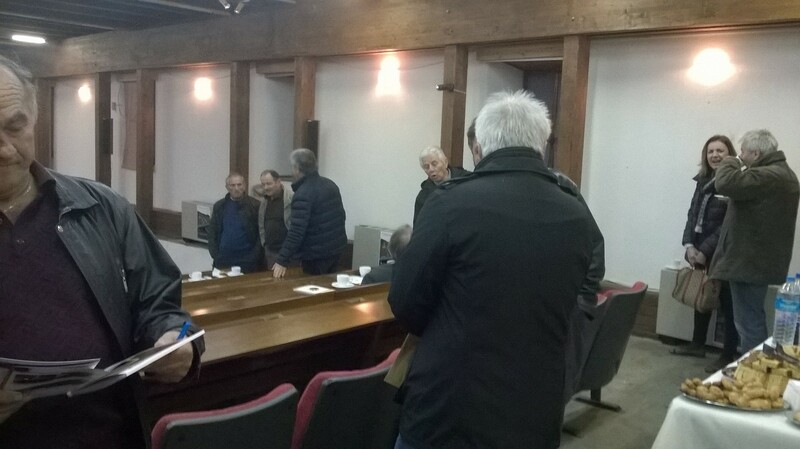 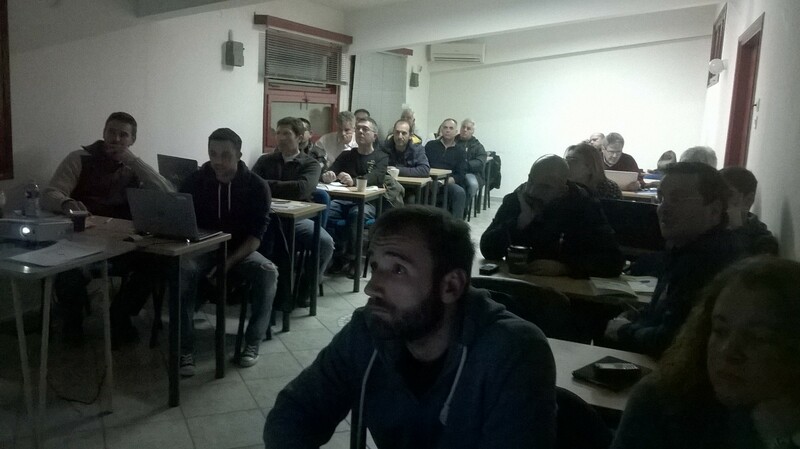 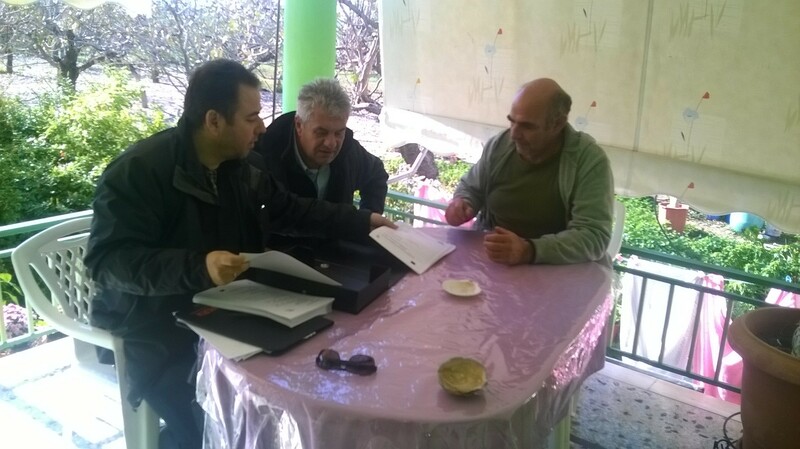 On 16 December 2015 a training workshop organized in Lamia, Central Greece for pistachio producers, agronomists and the two local pistachio producers associations. 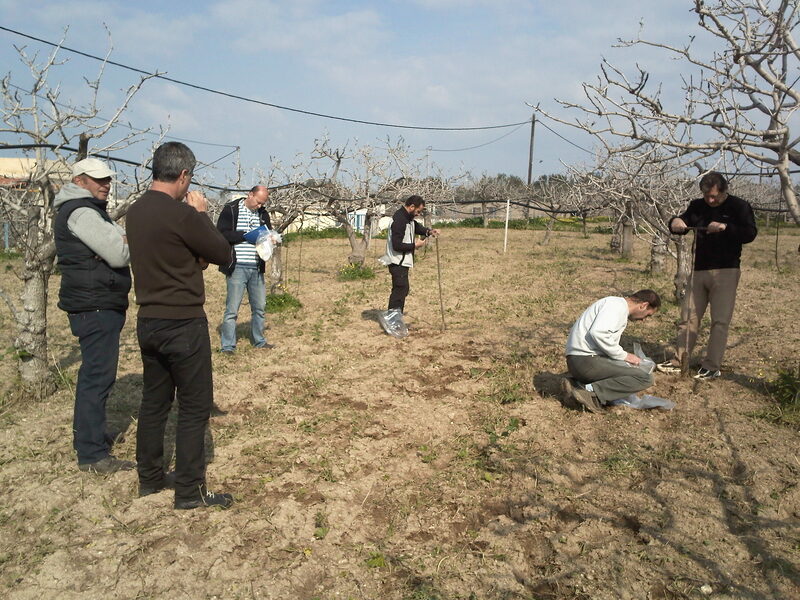 The participants were trained by Mr. Nikos Papadopoulos (IMS-FORTH) and Dr. Maria Doula (project coordinator-Benaki Phytopathological Institute) on the use and functionality of the Cultivation Management Software. 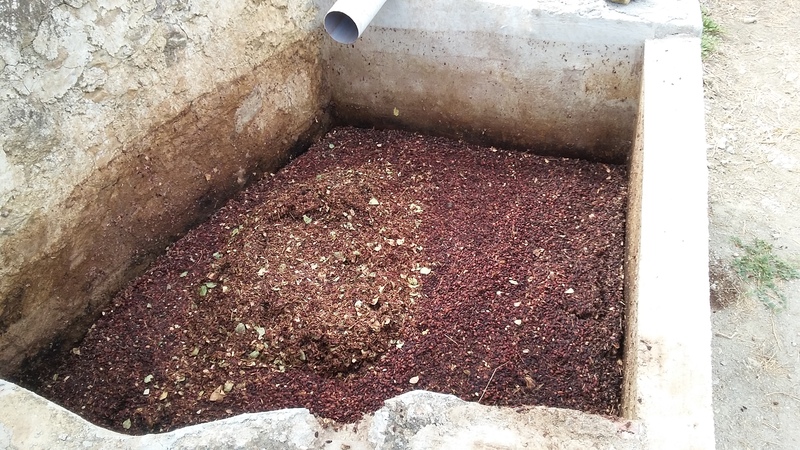 In specific, the participants were trained on uploading soil, water and compost data on the software and receiving quality consultancy; on receiving fertilization consultancy and on using the Central Management Monitoring Tool. 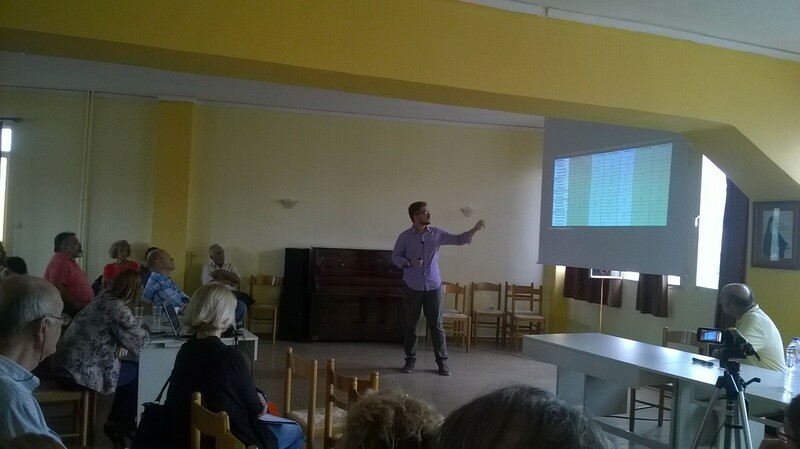 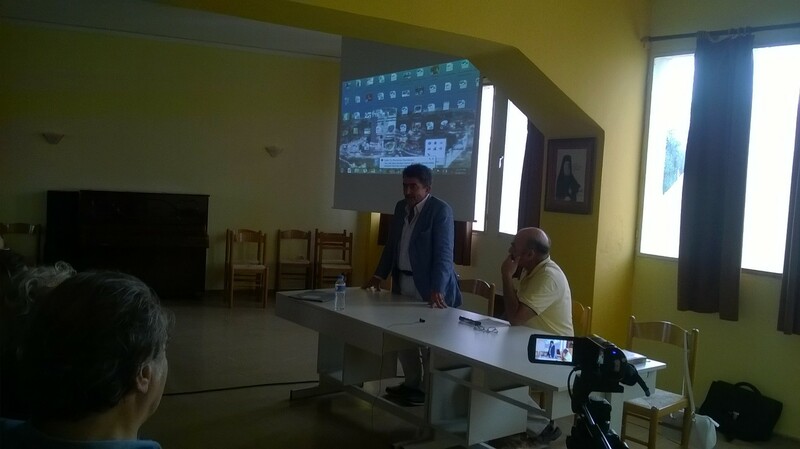 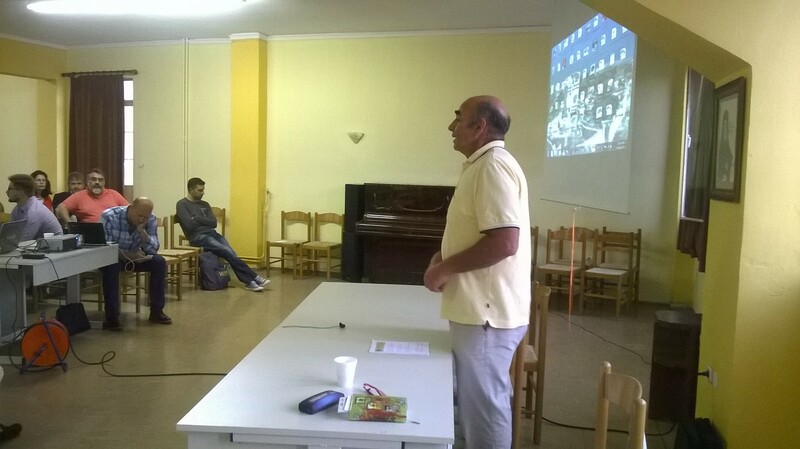 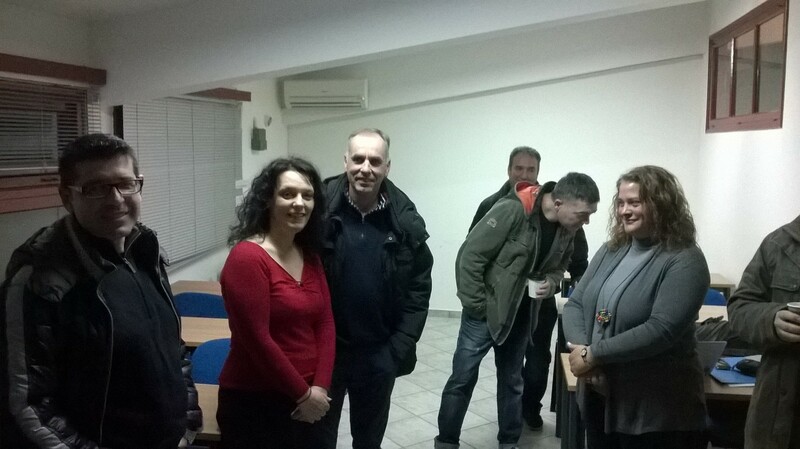 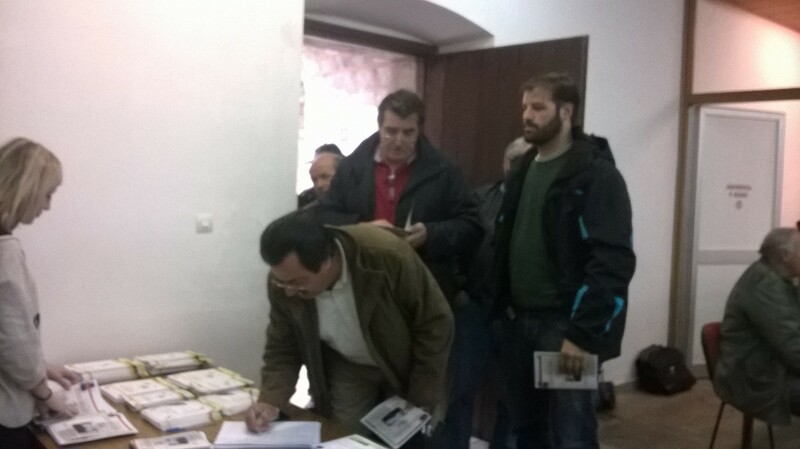 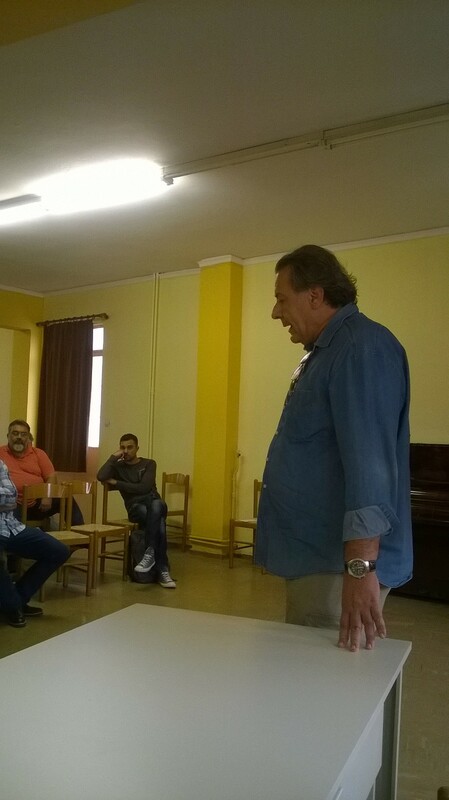 On 17 Δεκεμβρίου 2015 a workshop was organized in Lamia at the Conference Room of the town's Castle. 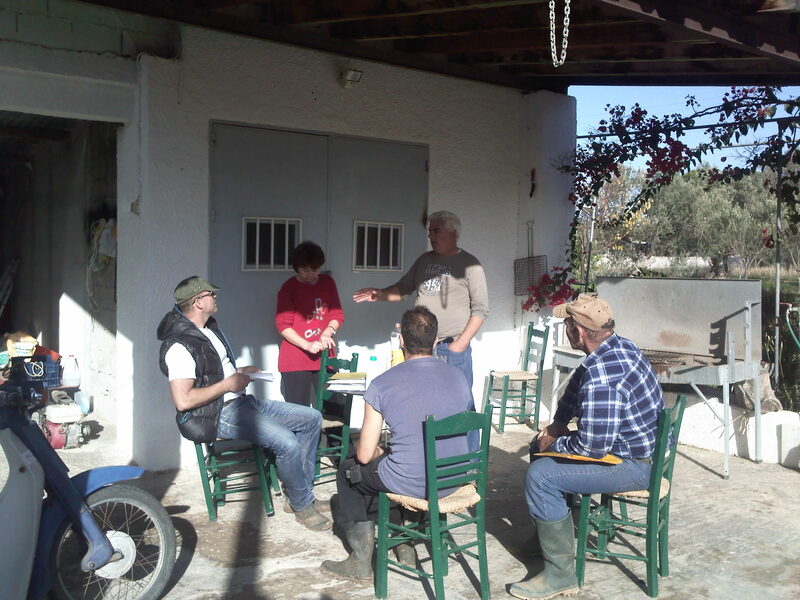 The room is located at a beautiful archaelogical site in the center of Lamia city. 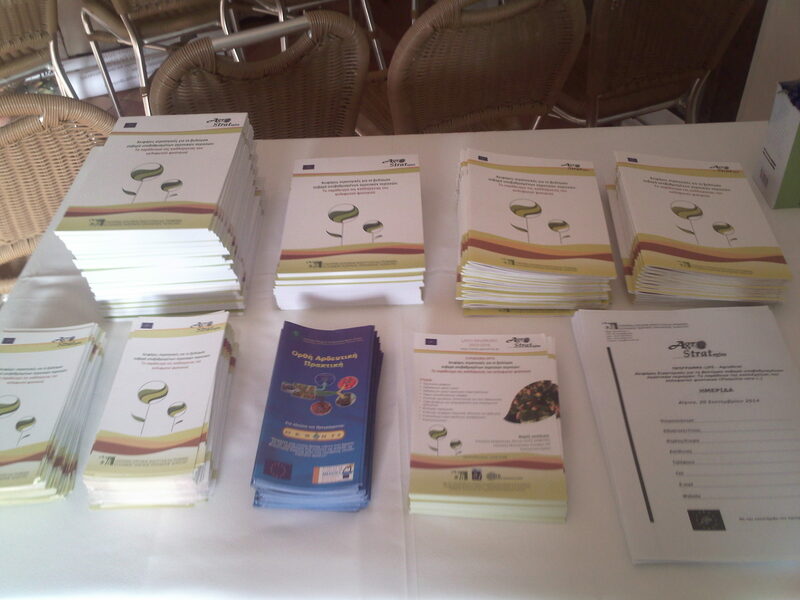 During the workshop, results of the projects were presented, as well as general issues of pistachio cultivation. 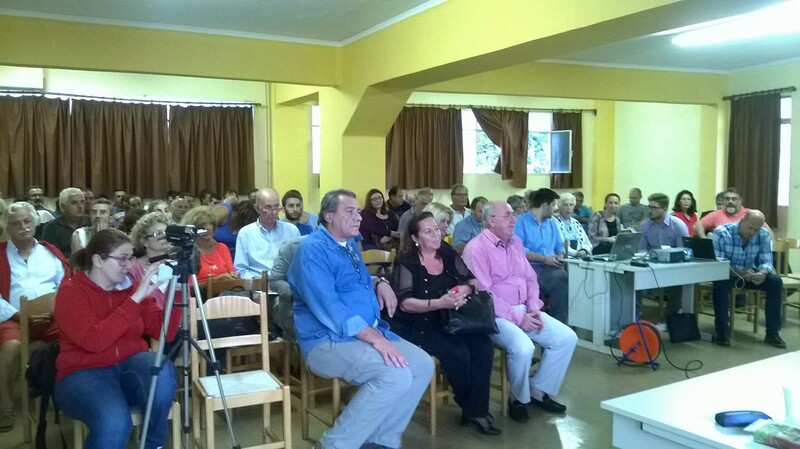 The Thematic Regional vice Governor, Mr. G. Kelaiditis and the vice Major, Mr. P. Rizakos were participated in the workshop, spoke and discussed with the beneficiaries and the participants. 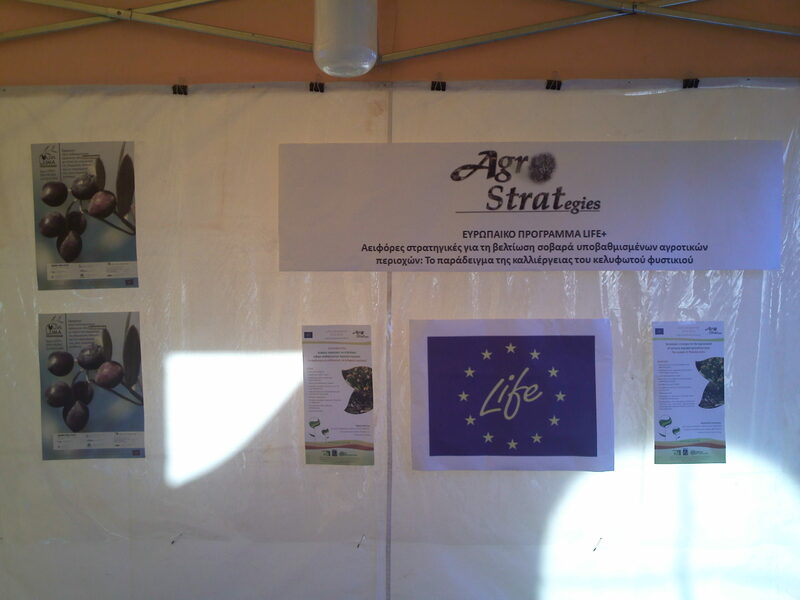 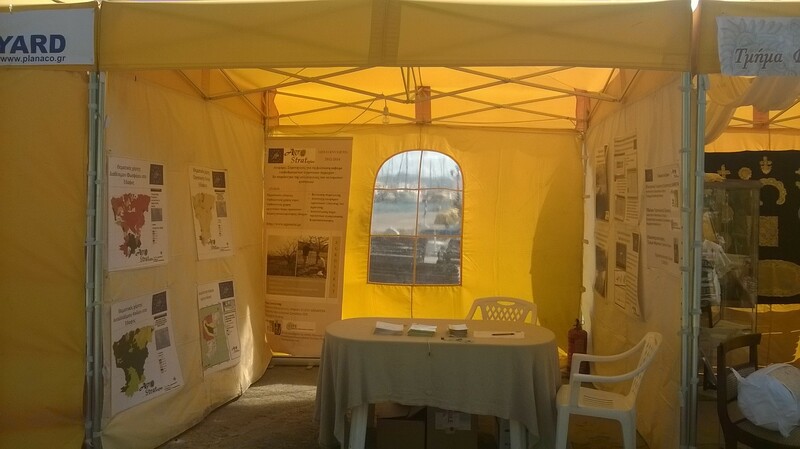 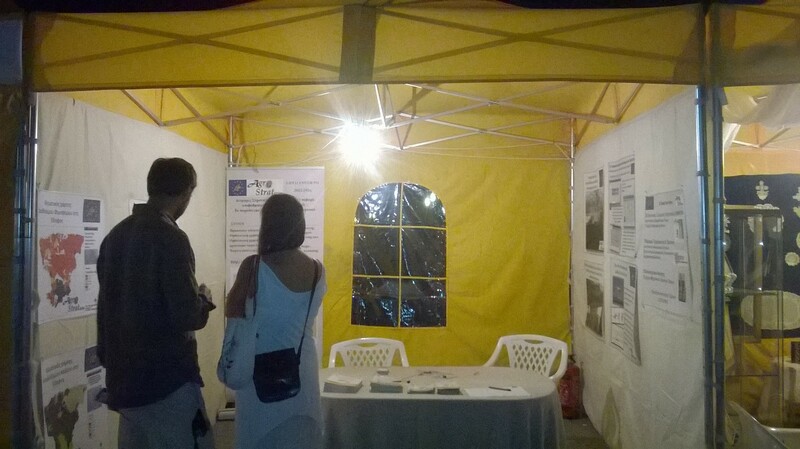 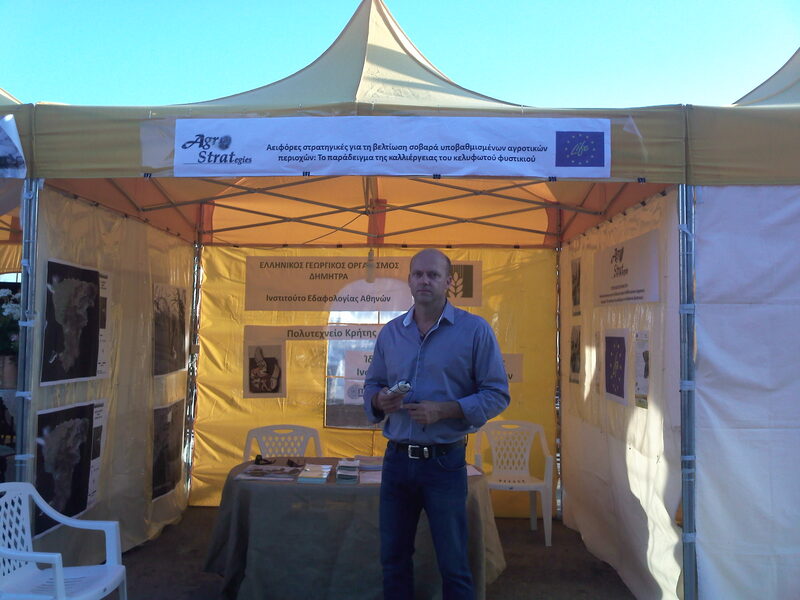 LIFE AgroStrat participated in the 7th Fistiki Fest organized in Aegina island, Greece, between 24 and 27 September 2015. 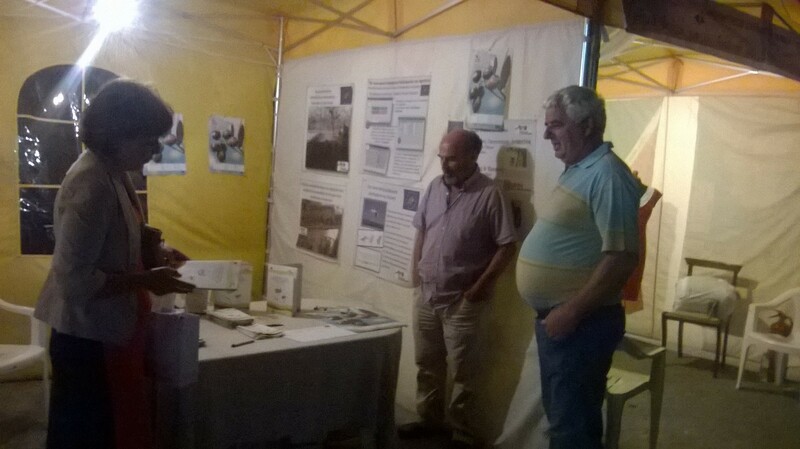 Many participants of the Fest and local farmers visited the kiosk of the project and were informed regarding the project and its results and achievements. 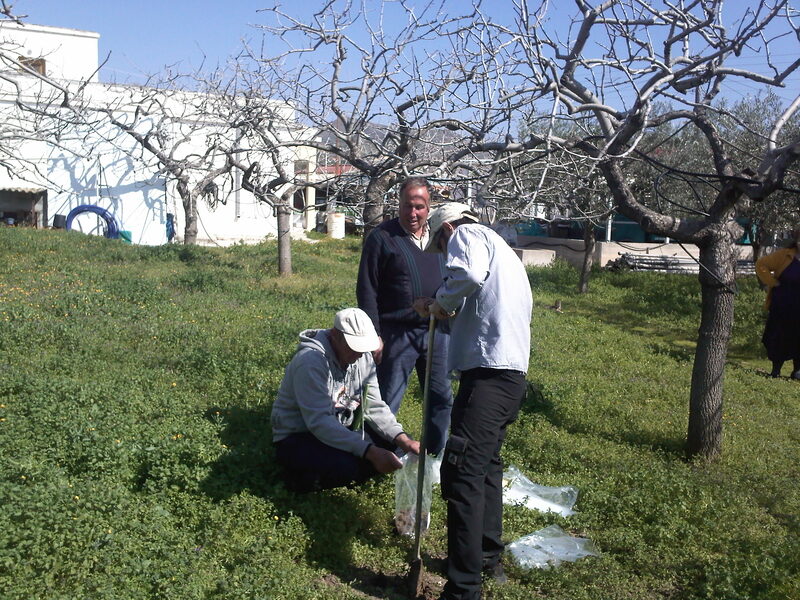 Local farmers were trained by Mr. Nikos Papadopoulos (Institute of Mediterrranean Studies, FORTH) on the functionality and use of the Cultivation Management Software. 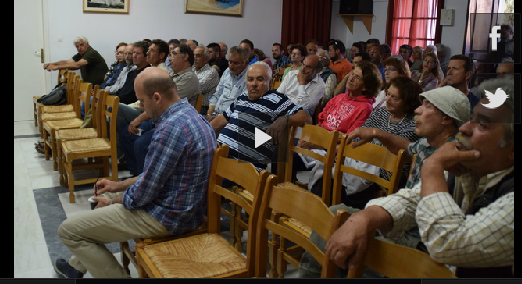 Participation in the workshop entitled "Agricultural Seminars" with presentations and discussion with farmers and citizens. 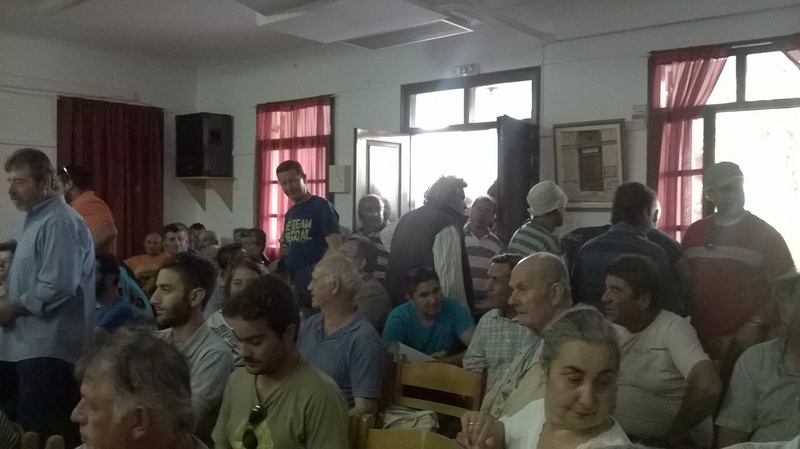 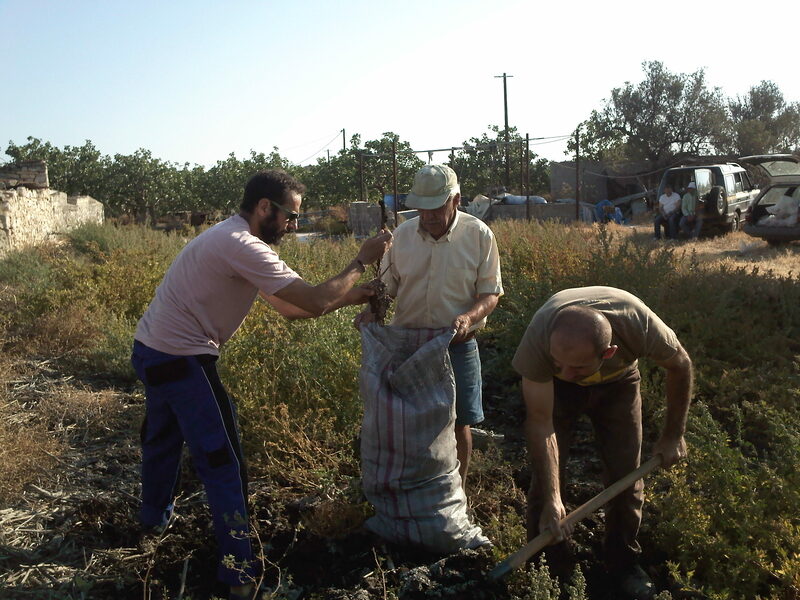 In the framework of the 7th Fistiki Fest, the Agricultural Assocaition of Aegina island organized a training seminar for local farmers on 25 September 2015. 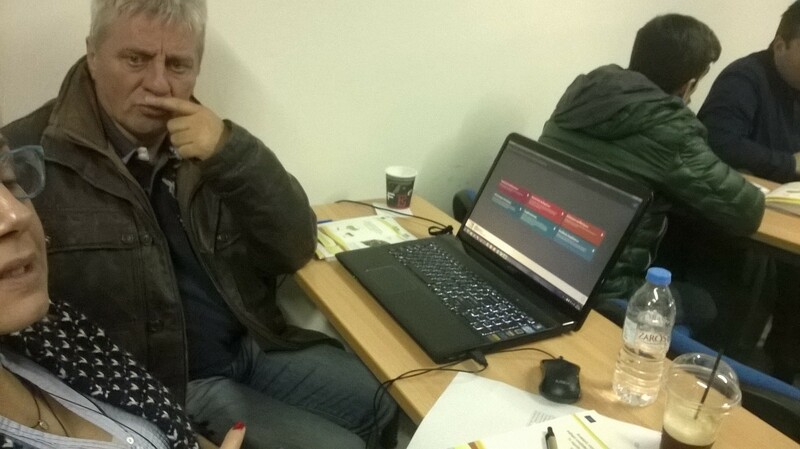 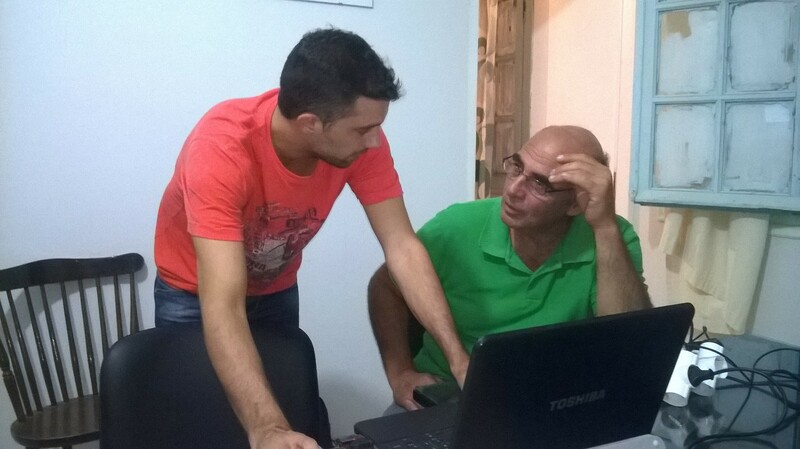 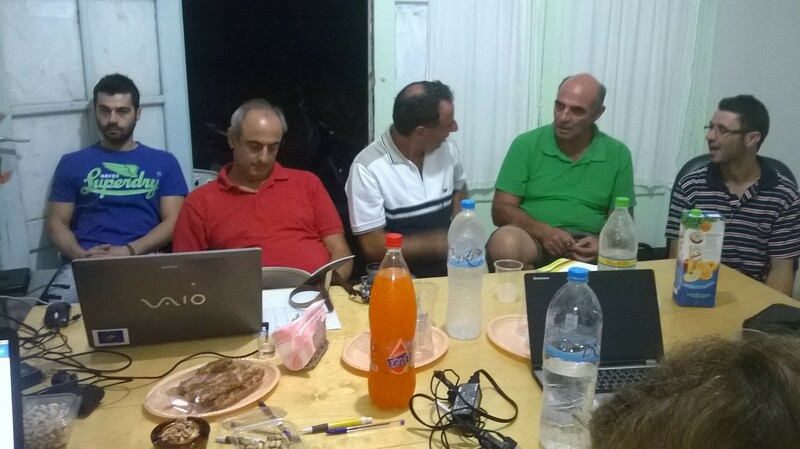 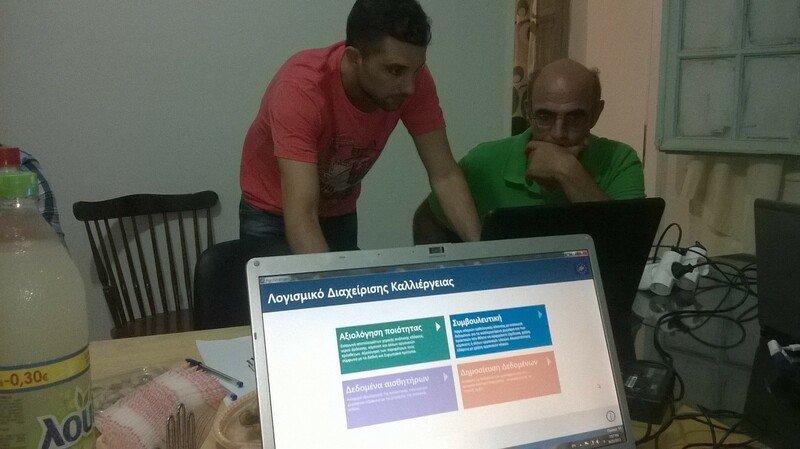 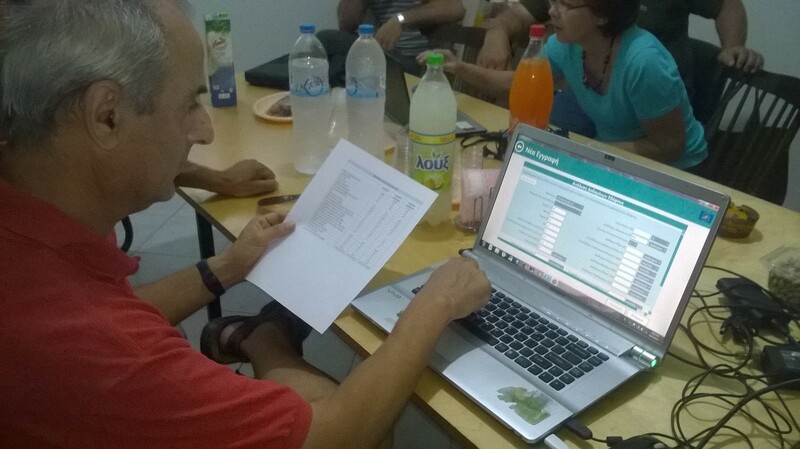 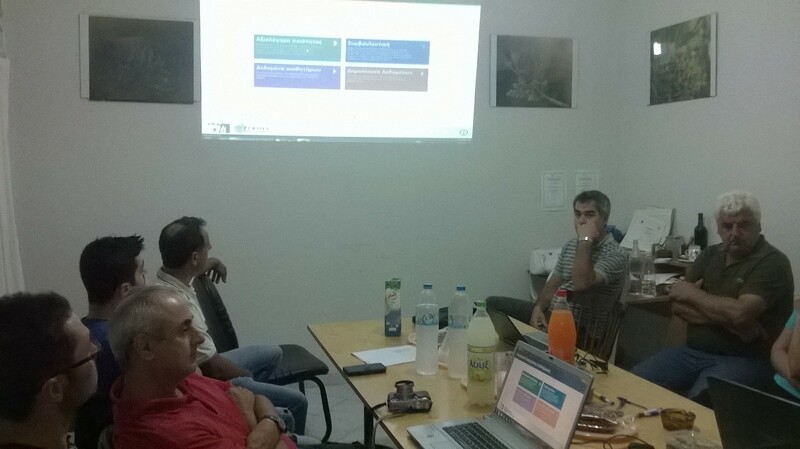 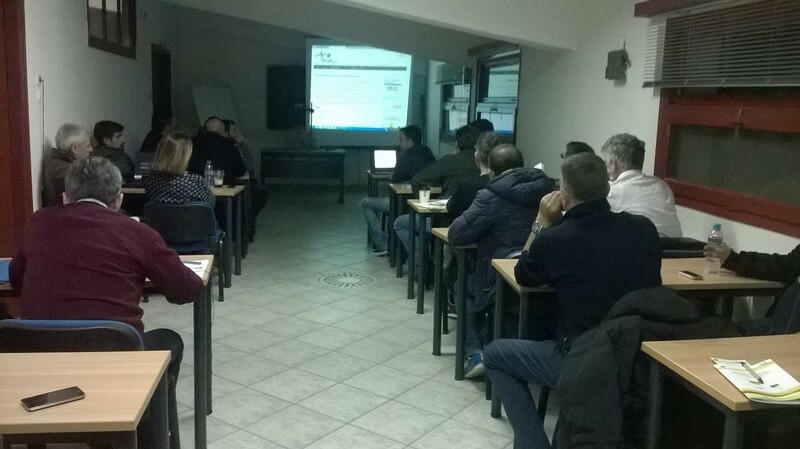 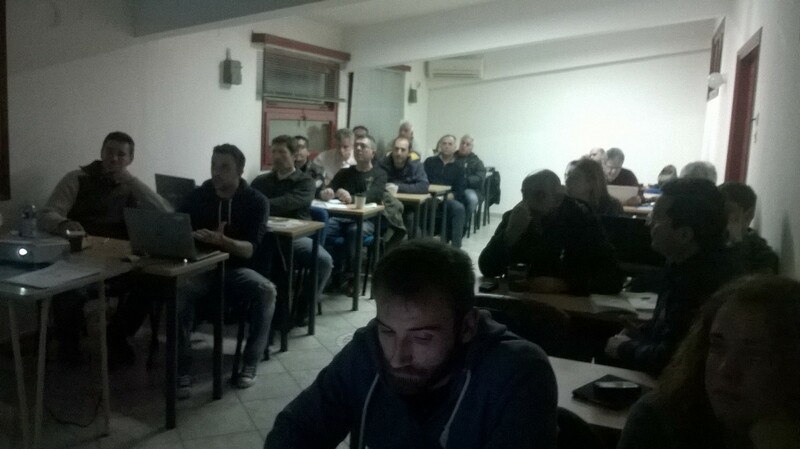 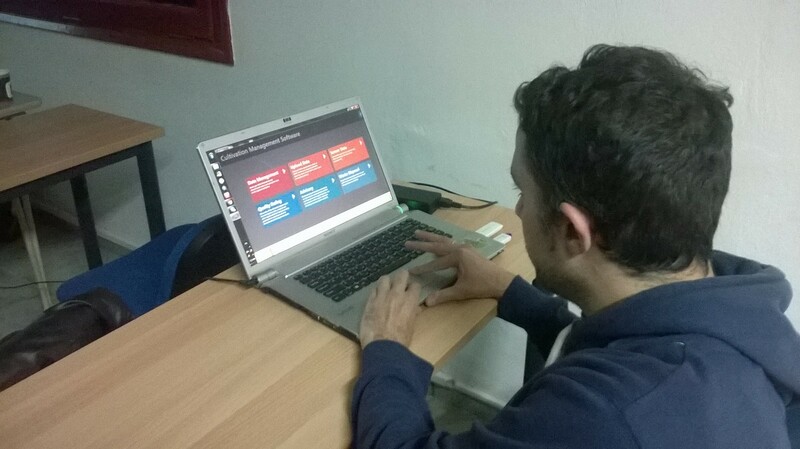 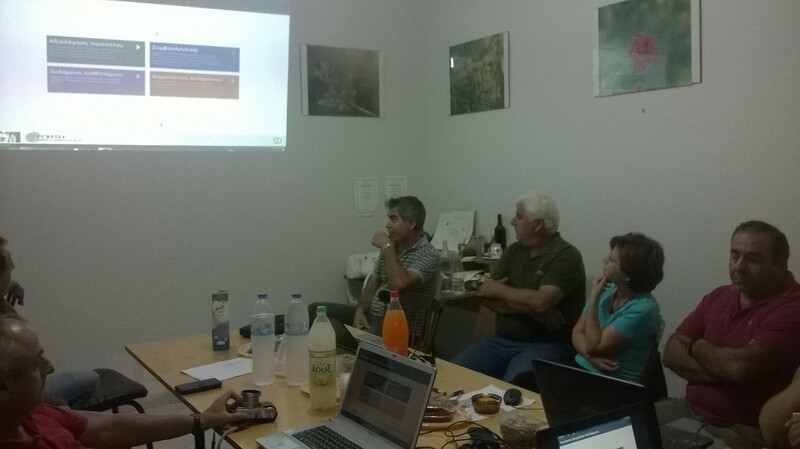 The workshop took place at the premises of the Association and the farmers were trained by Mr. Nikos Papadopoulos (IMS-FORTH) on the functionality and use of the Cultivation Management Software. 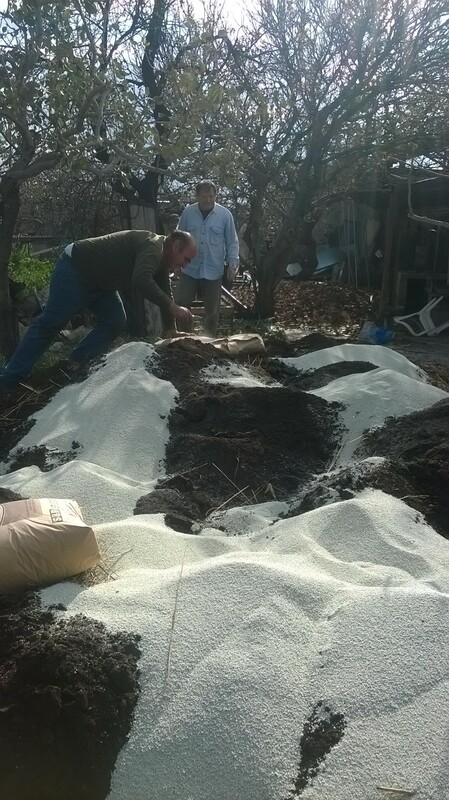 Farmers were trained to input soil, water and composts chemical analyisis and get the respective evaluation as well as fertilization consultancy. 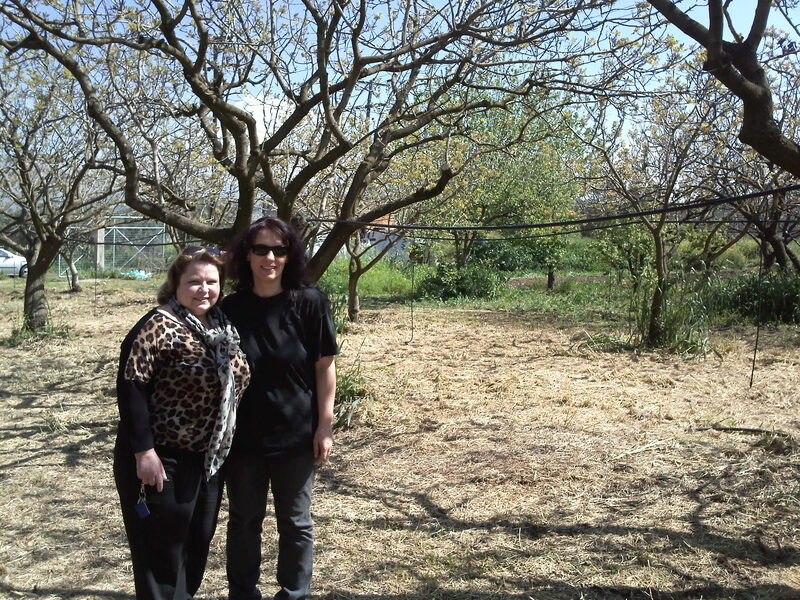 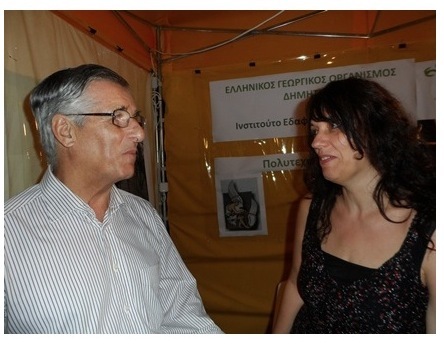 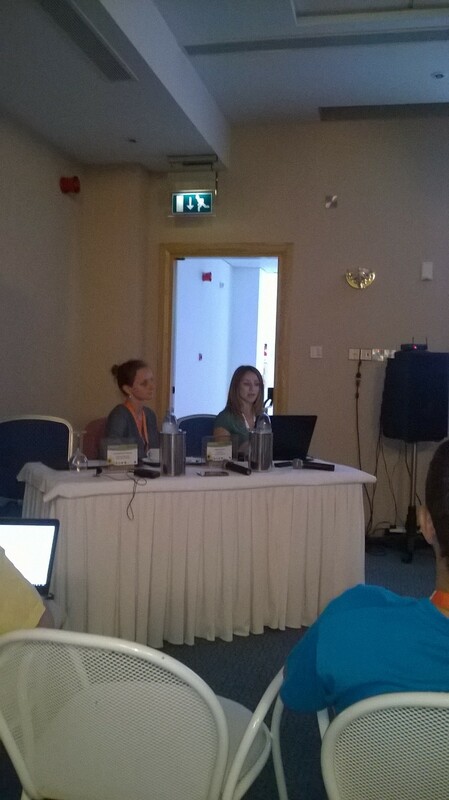 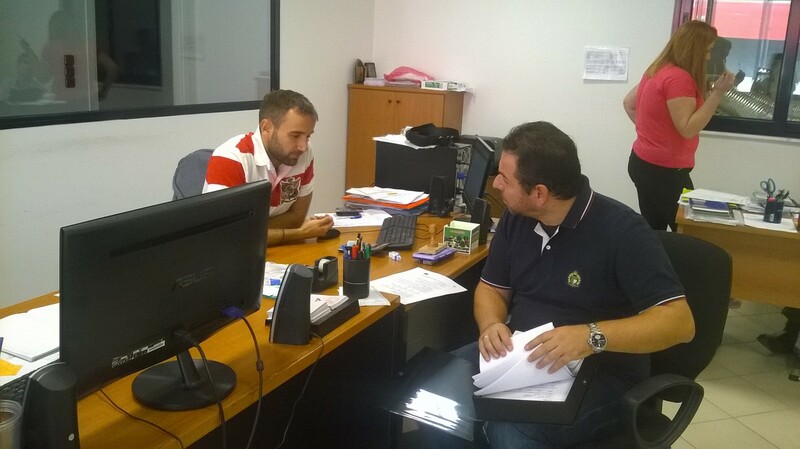 Dr. M. Doula from the Benaki Phytopathological Institute (project coordinator) and Dr. V. Kavvadias from ELGO DEMETER. 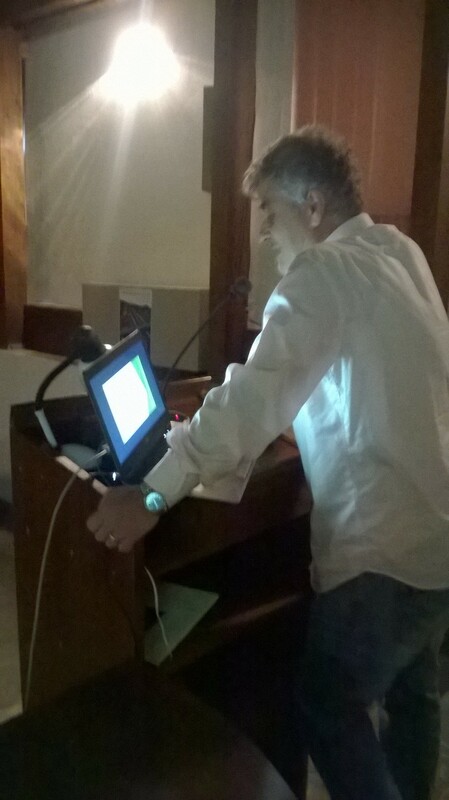 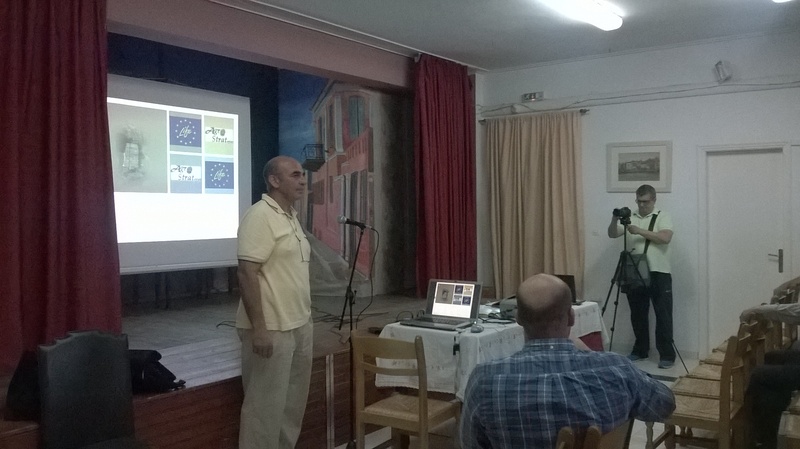 On 20 May 2015 an informative event for Aegina's pistachio producers was organized by the Agricultural Association of Aegina Island. 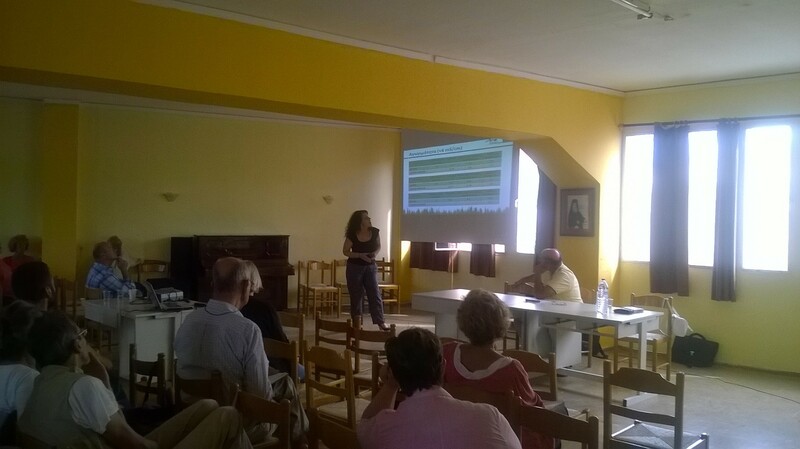 AgroStrat presented evaluated resuts as regards soil and water quality of the area as well as future actions. 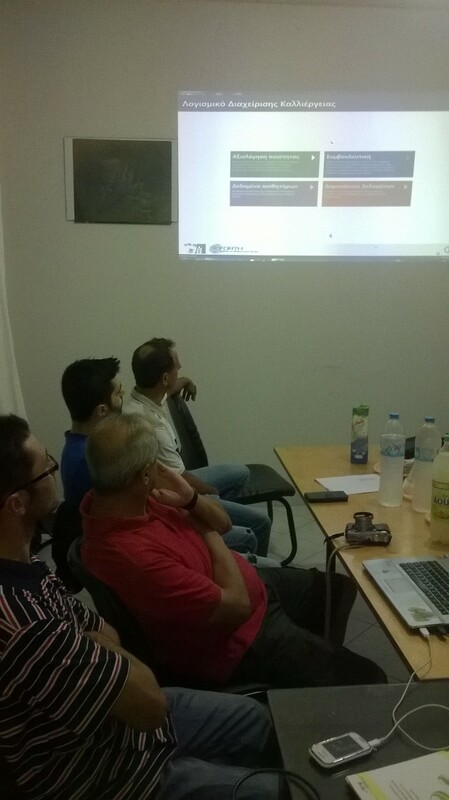 The Cultivation Management Software was presnted as well, while producers were trained on using the tool. 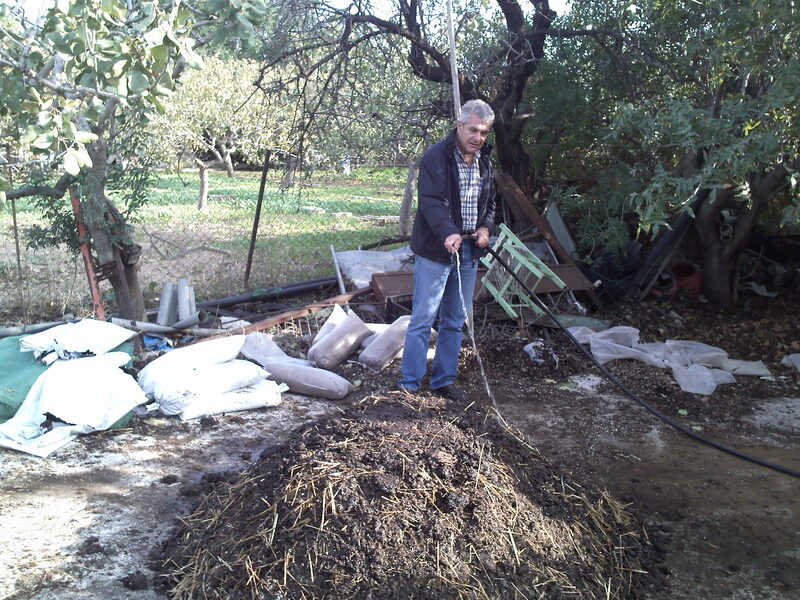 Dr. Victor Kavvadias - Department of Soil Science, Athens, ELGO DEMETER. 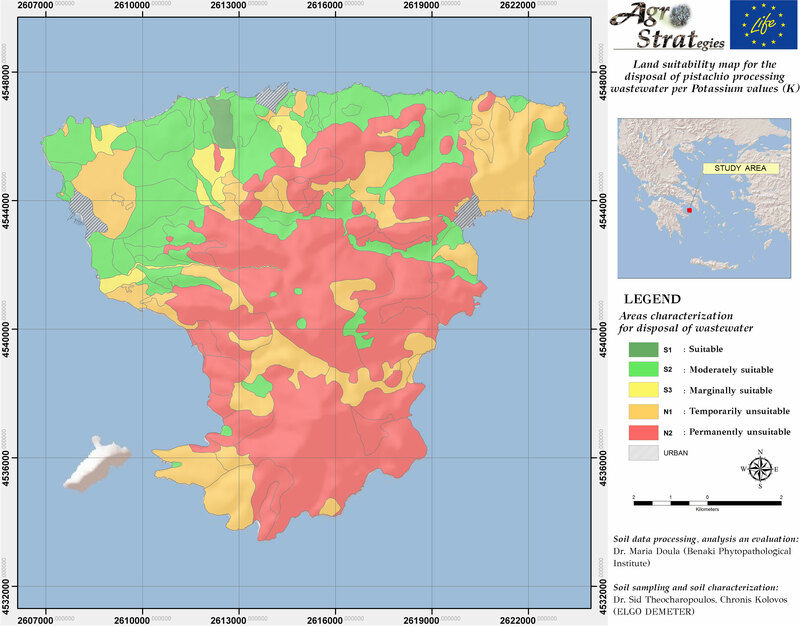 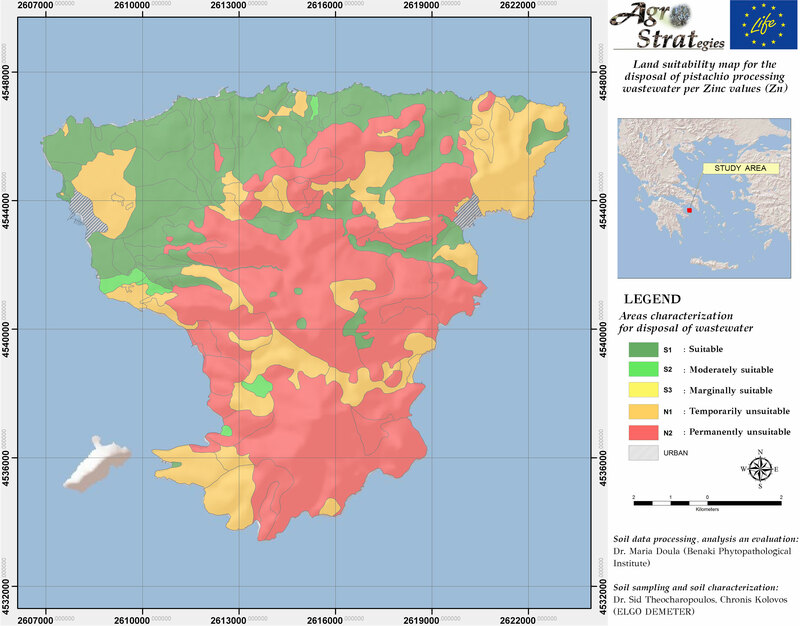 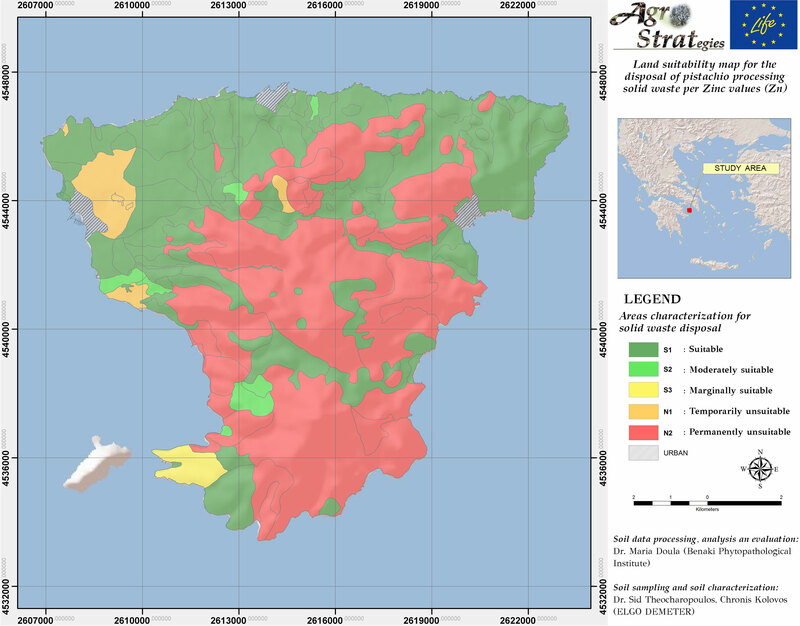 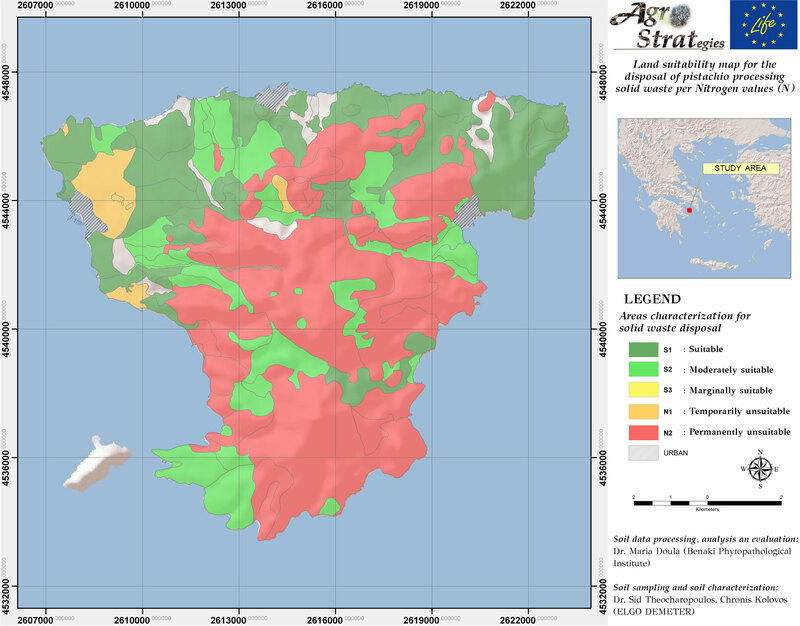 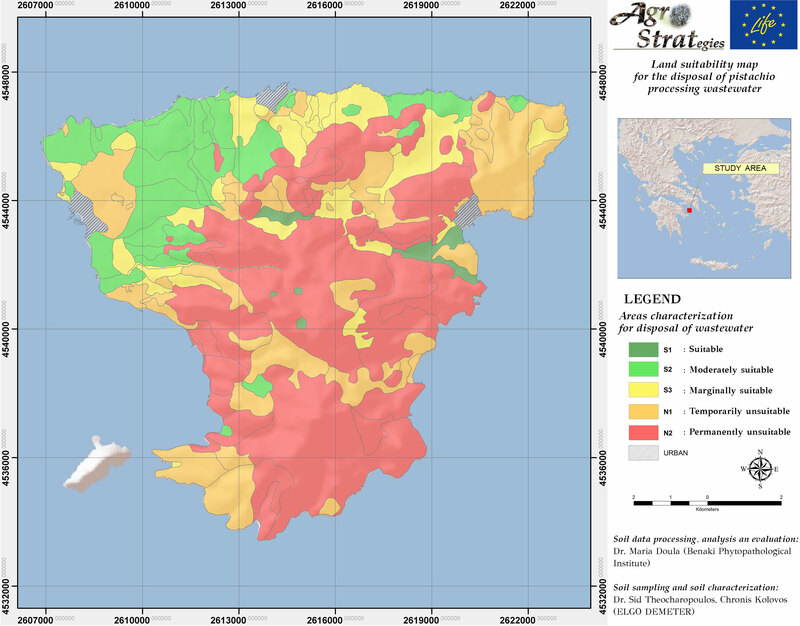 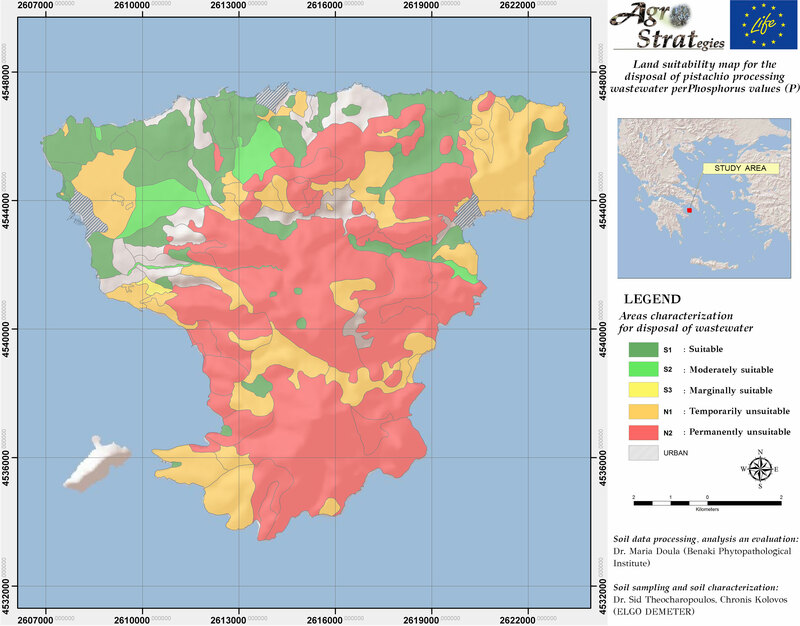 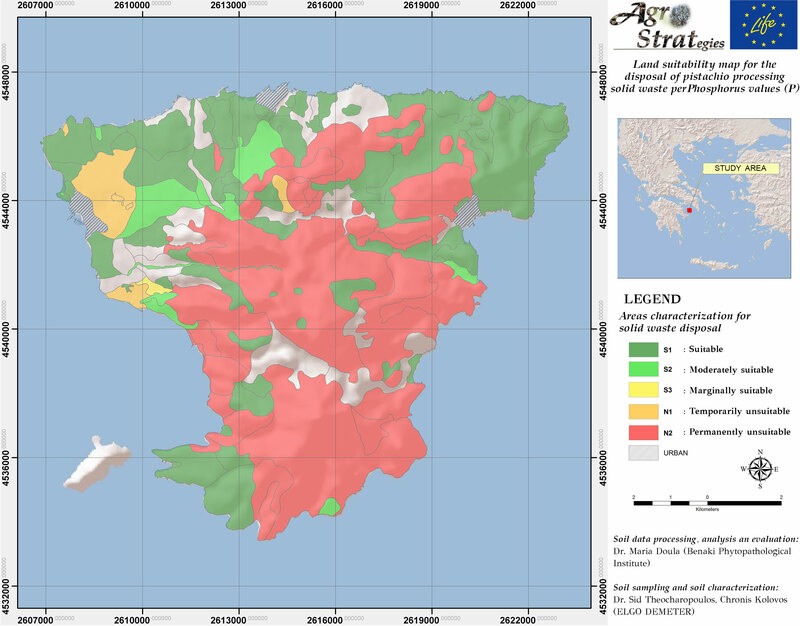 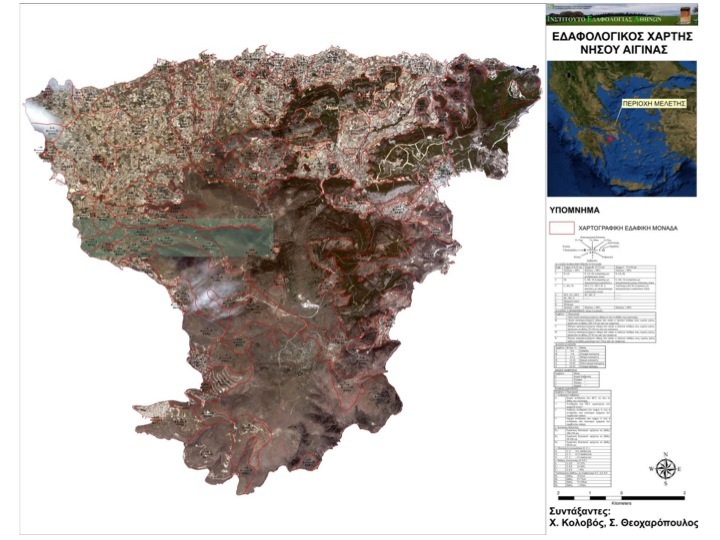 AgroStrat project developed many soil thematic maps of the pilot area, i.e. 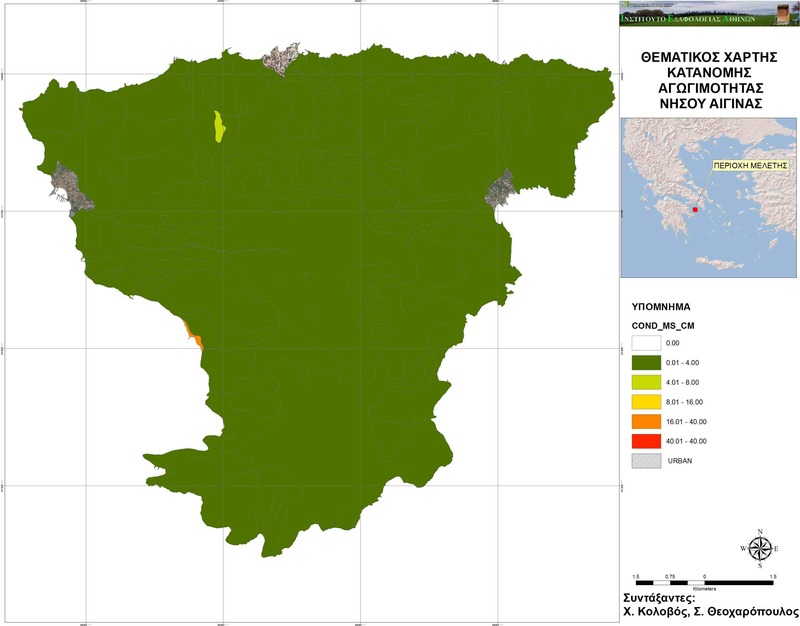 Aegina island to be used for the development of the Cultivation Management Software as well as for the Integrated Management Scenario of Action B1. 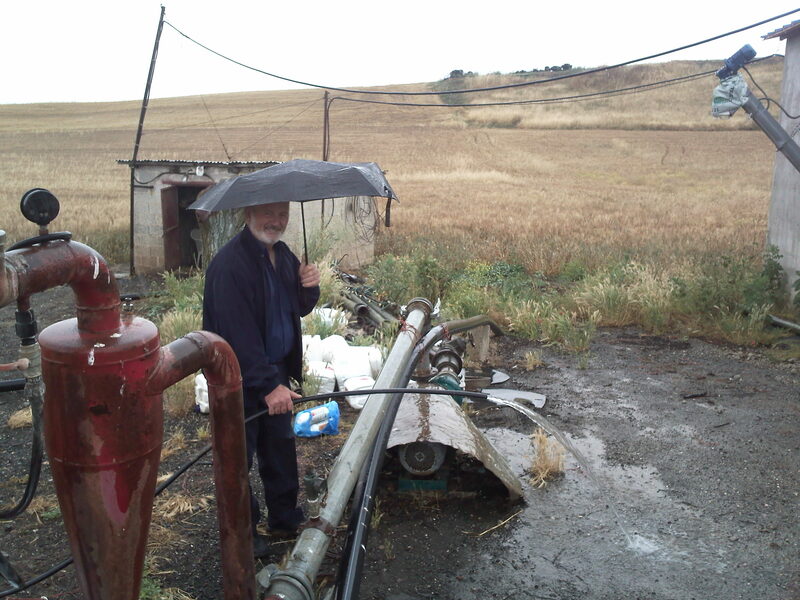 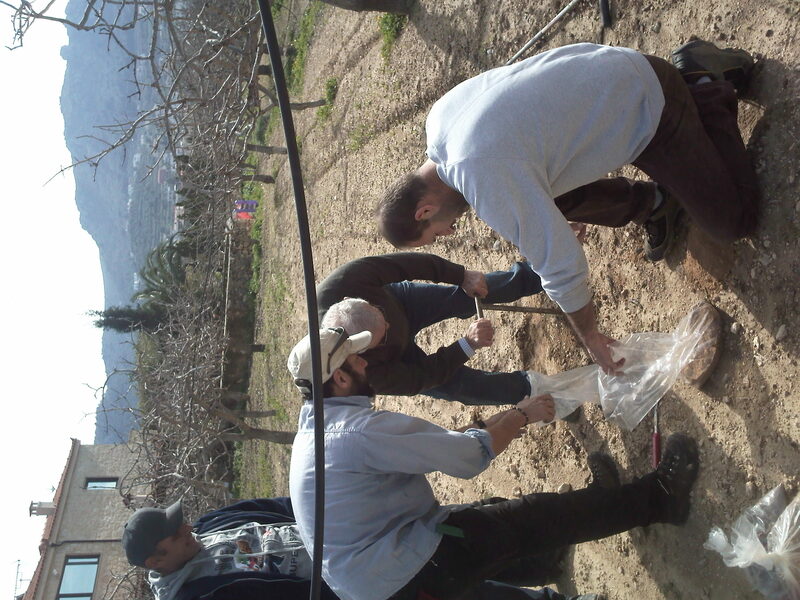 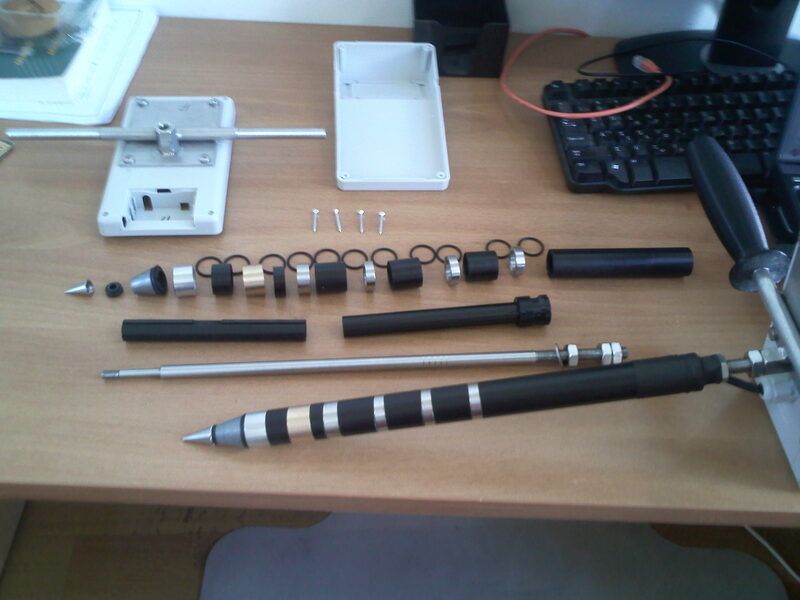 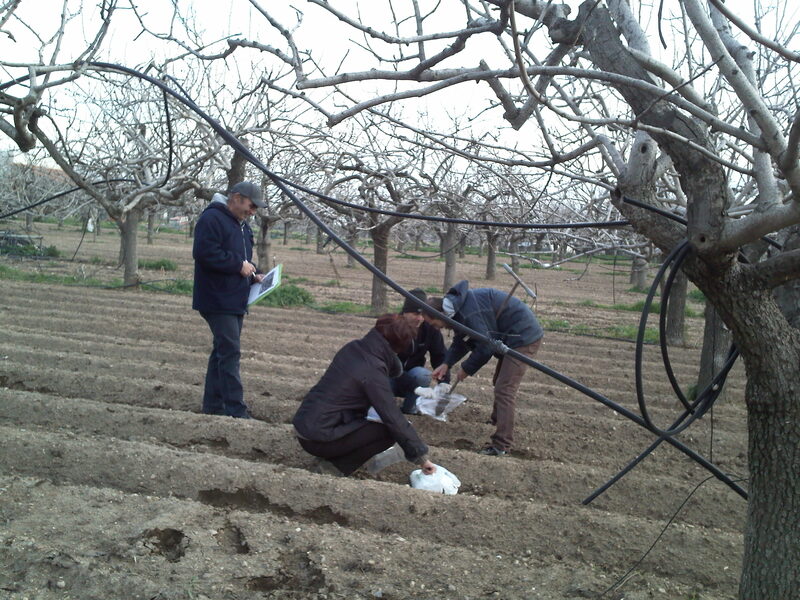 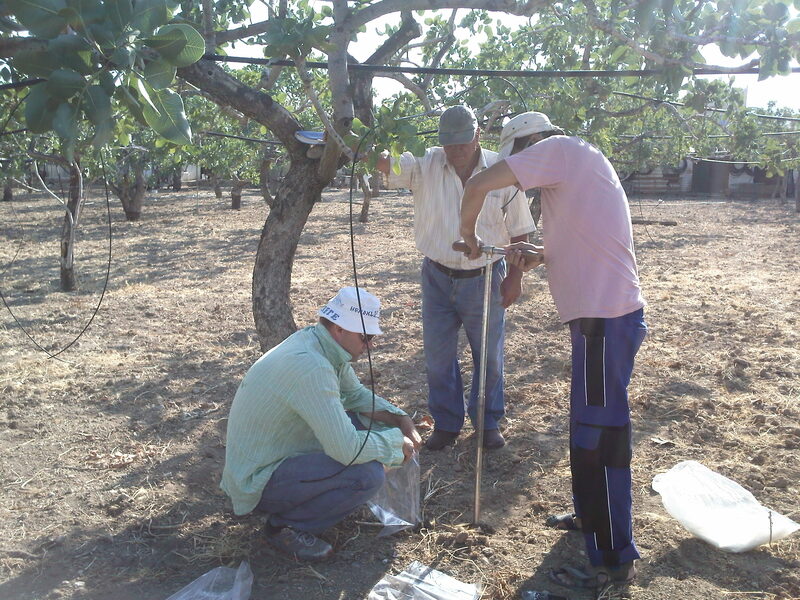 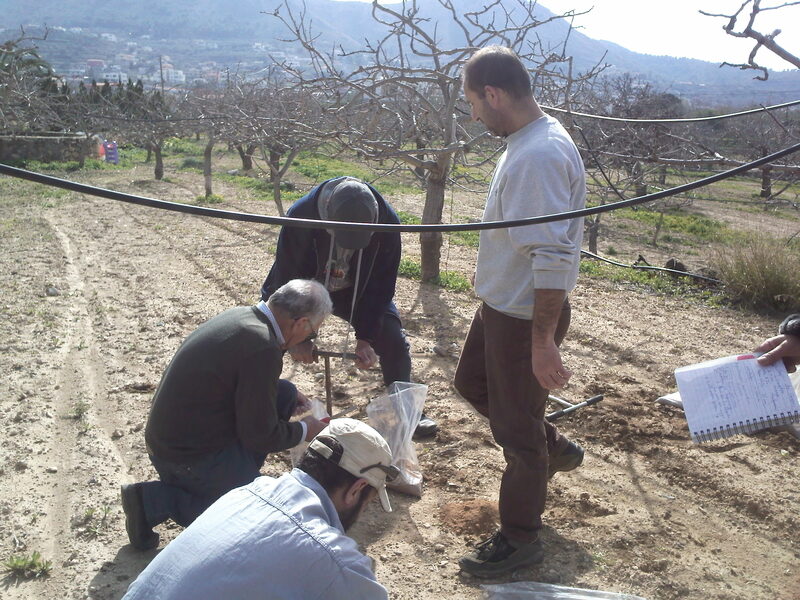 The Institute of Mediterranean Studies developed four field equipment that can be used by farmers to measure soil moisture, pH and elecrtrical conductivity by their own. 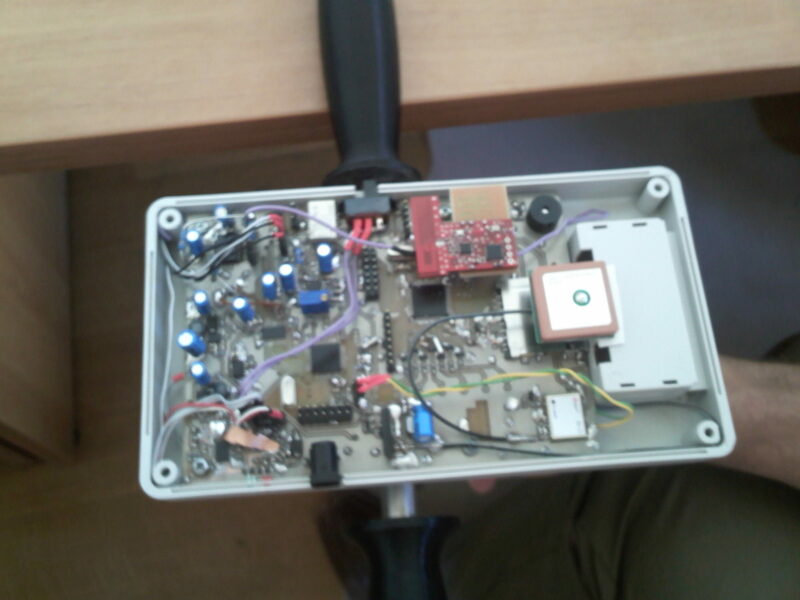 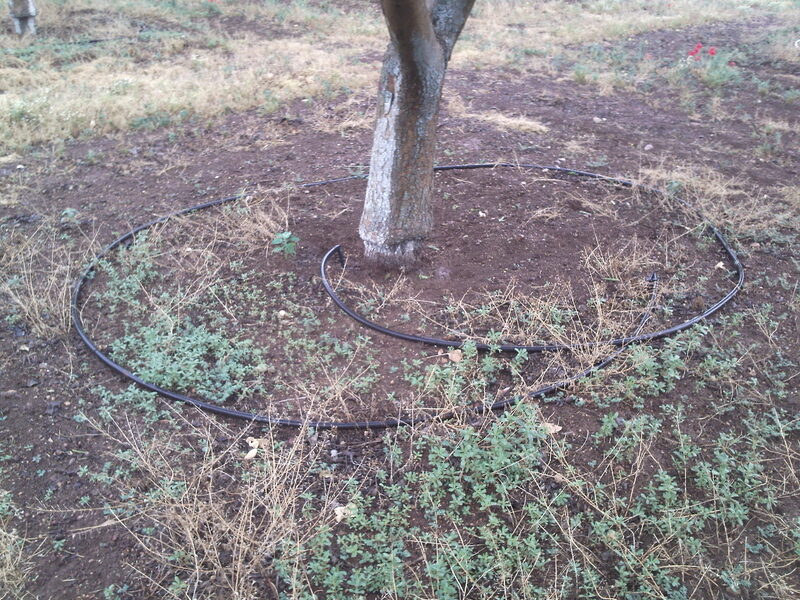 The equiment will be tested and validated during Action B1. 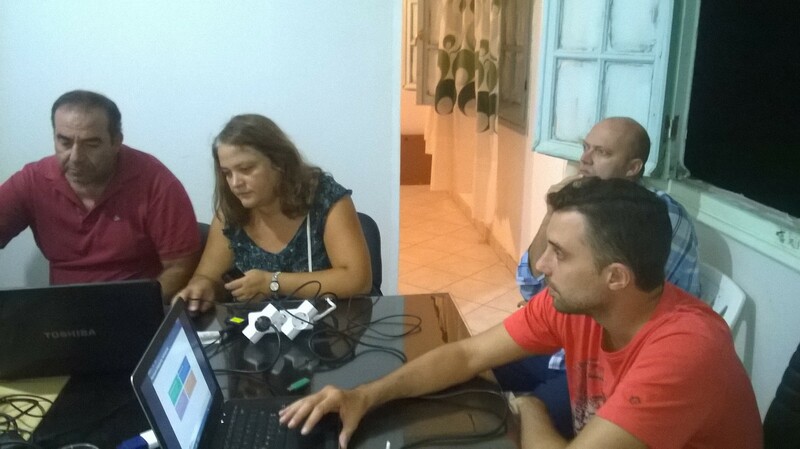 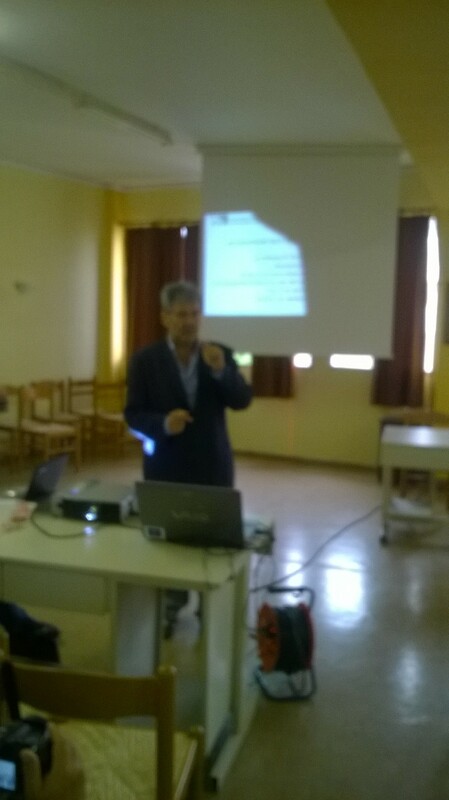 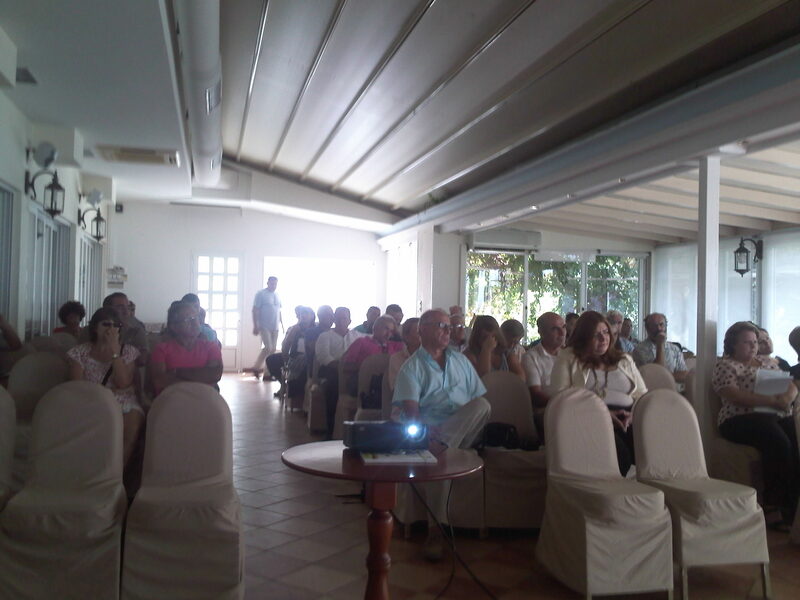 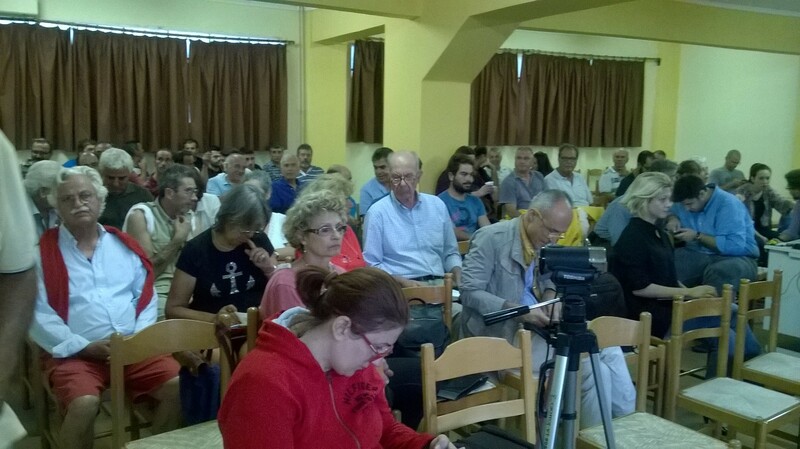 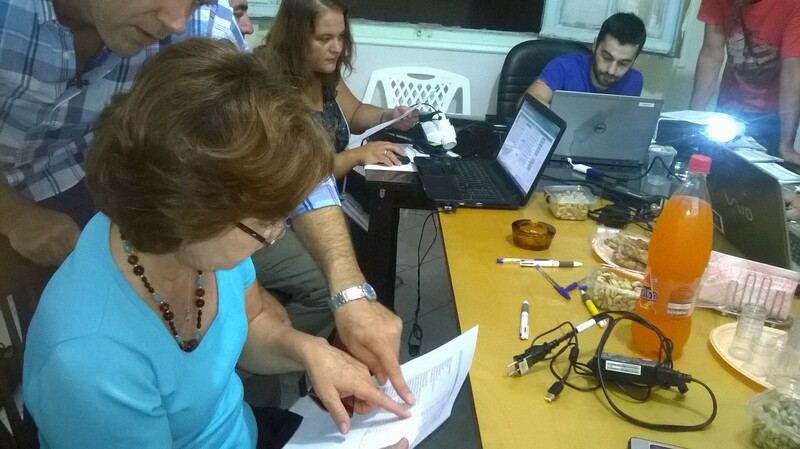 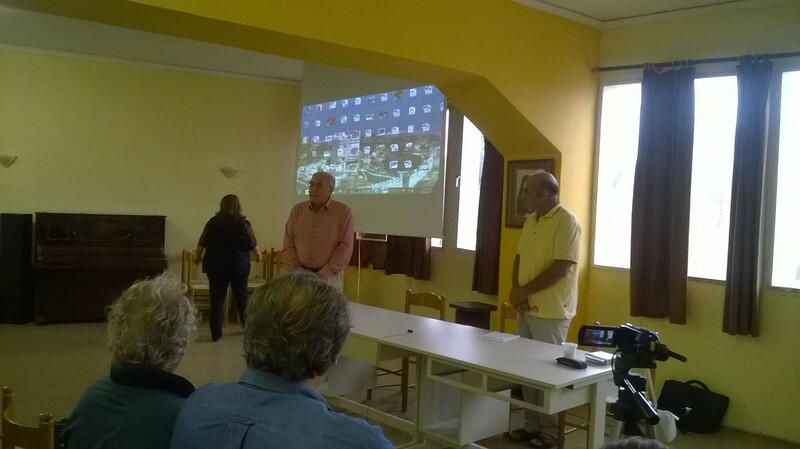 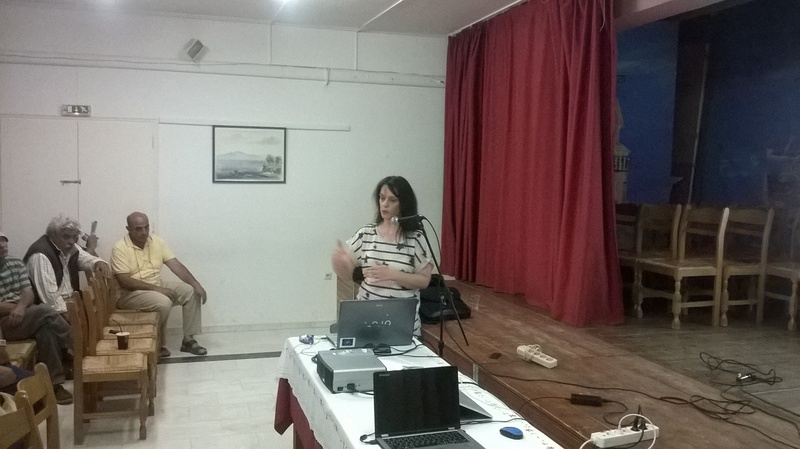 On 20 September 2014 AgroStrat organized a workshop in Aegina. 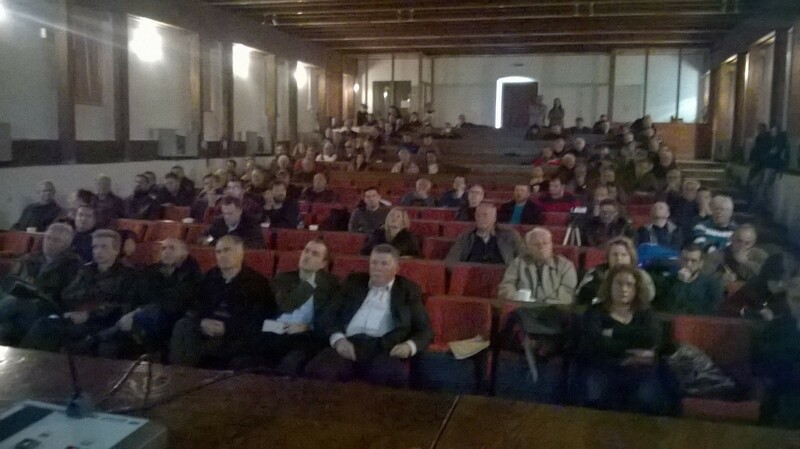 Many local people and farmers participated in the workshop and very interesting presentations made by the speakers. 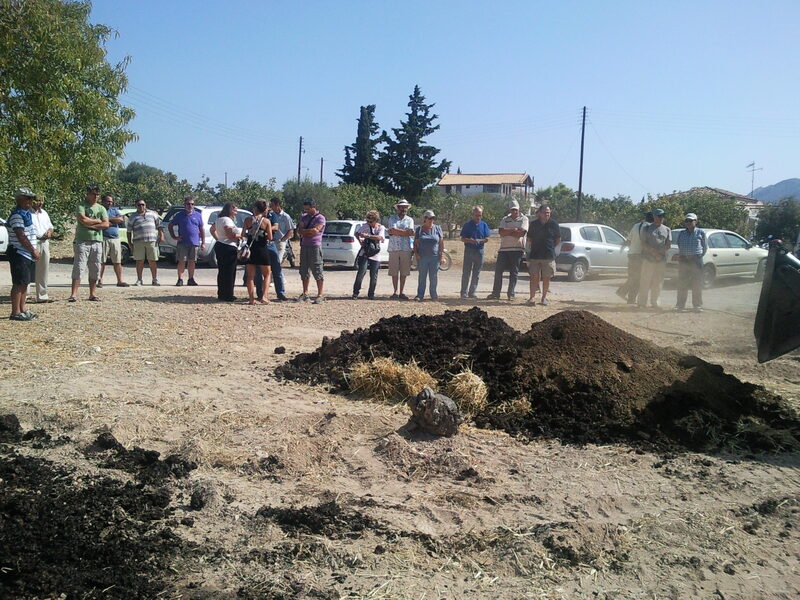 A training workshop was organized on 21 September 2014 and many farmers were trained on composting pistachio wastes. 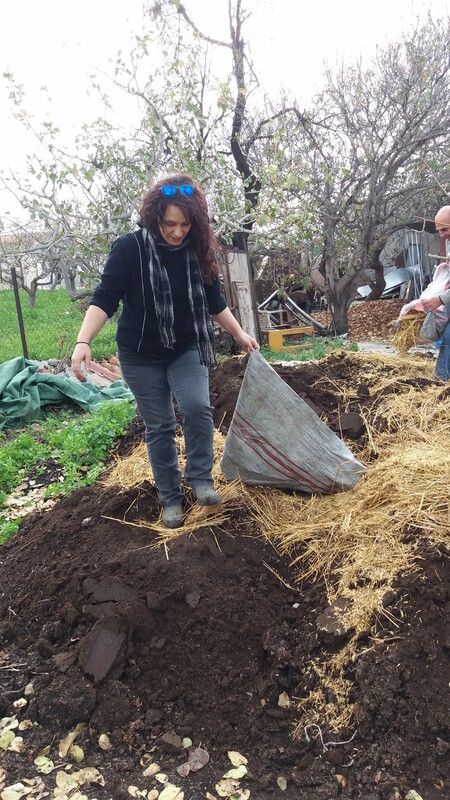 Dr. M. Doula explained the method developed by AgroStrat and prepared in cooperation with local people and farmers a widrow by using pistachio wastes, manure, straw and zeolite. 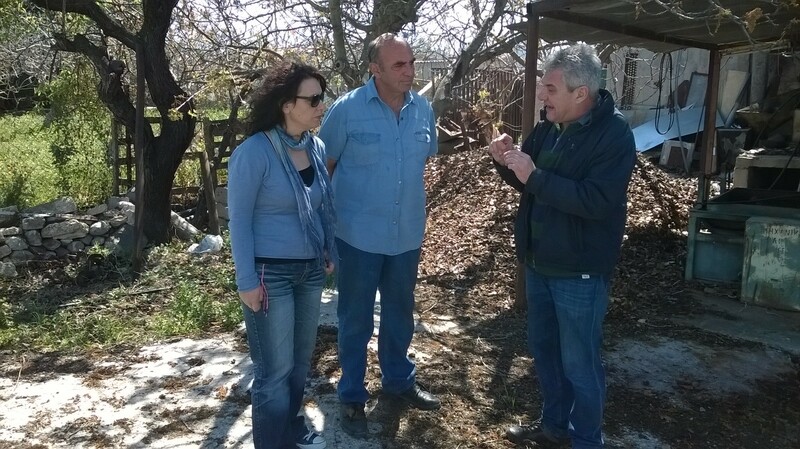 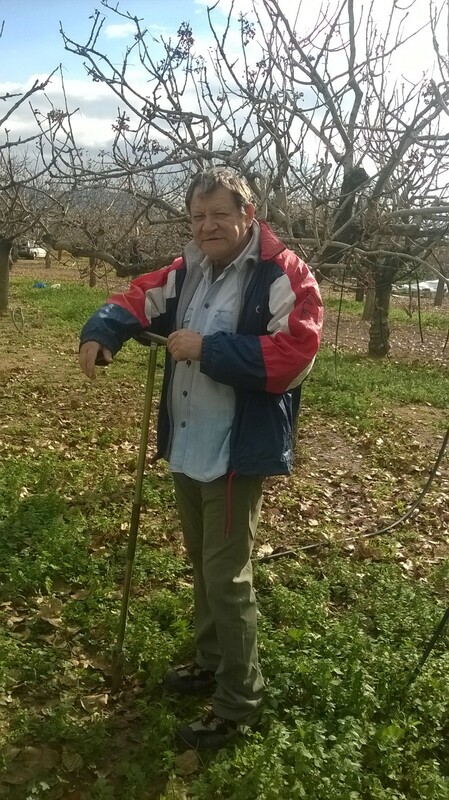 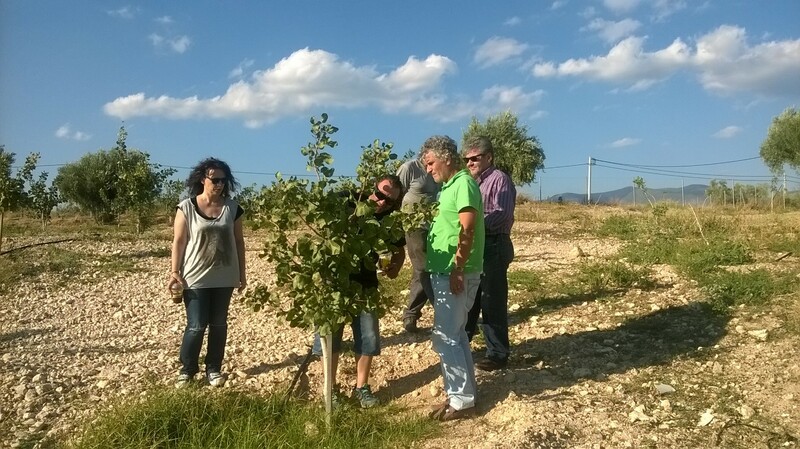 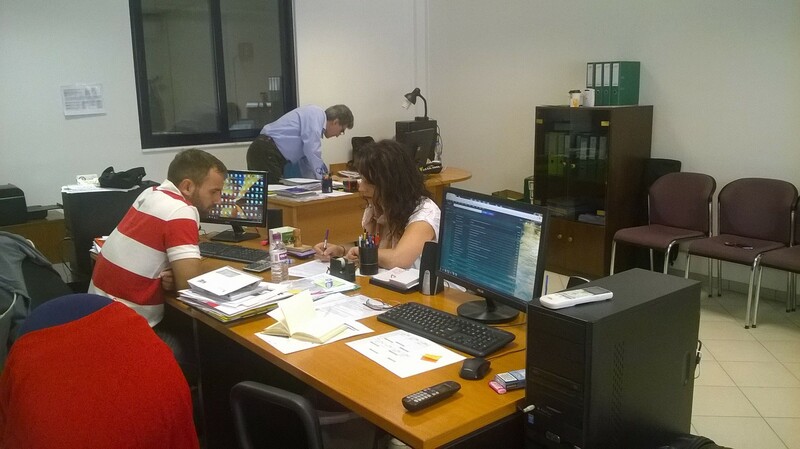 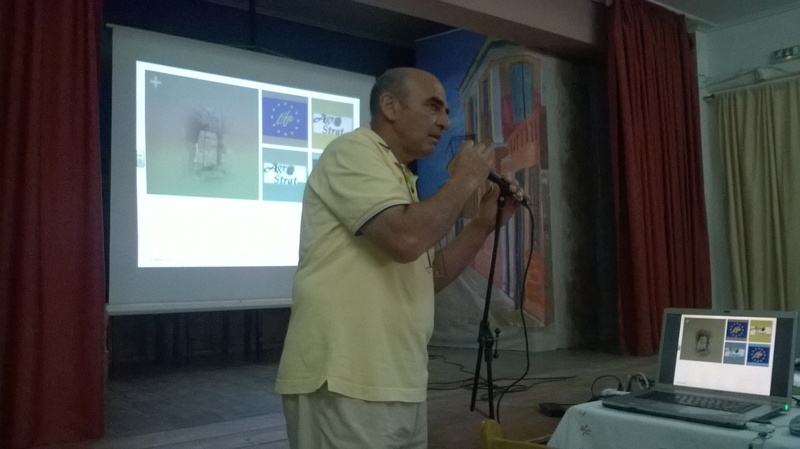 On 29-30 May 2014 the coordinator of AgroStrat, Dr. M. Doula visited pistachio producers in Larissa, Prefecture of Thessalia, Greece, presented the project, its objectives and anticipated results. 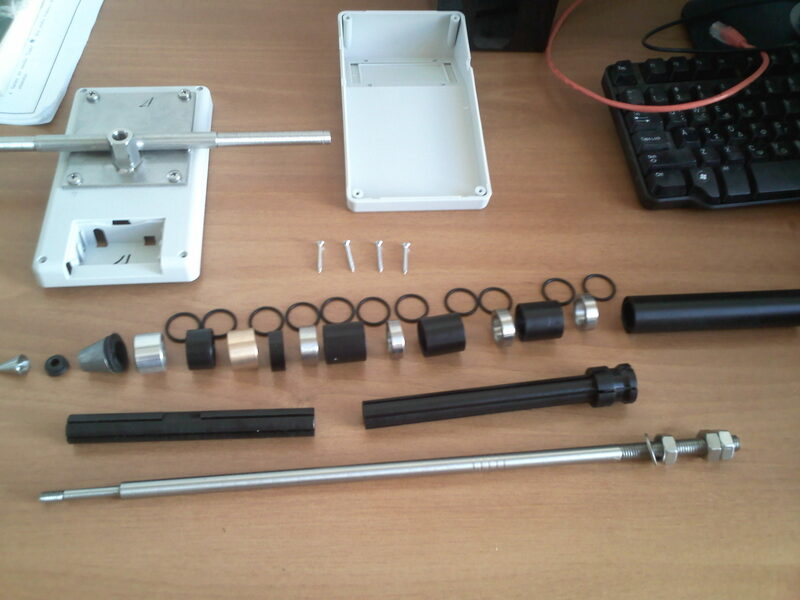 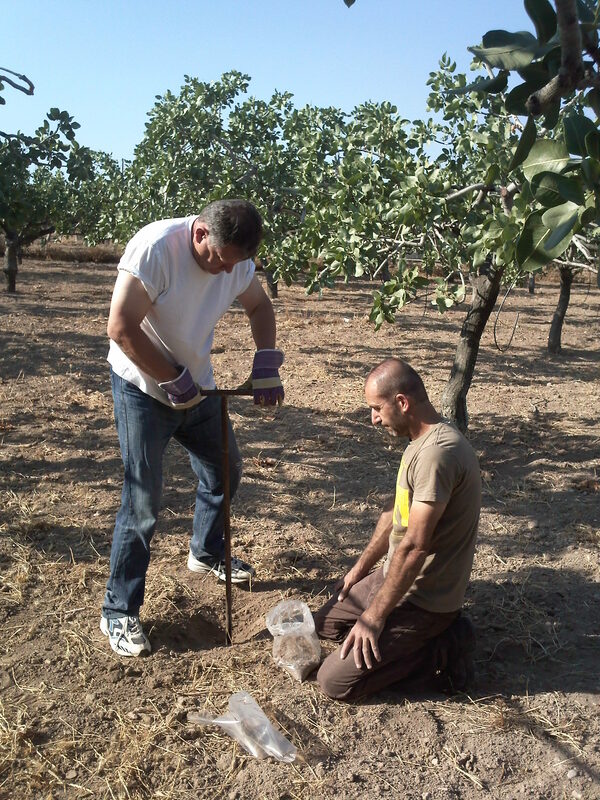 Soil and water sampling took also place. 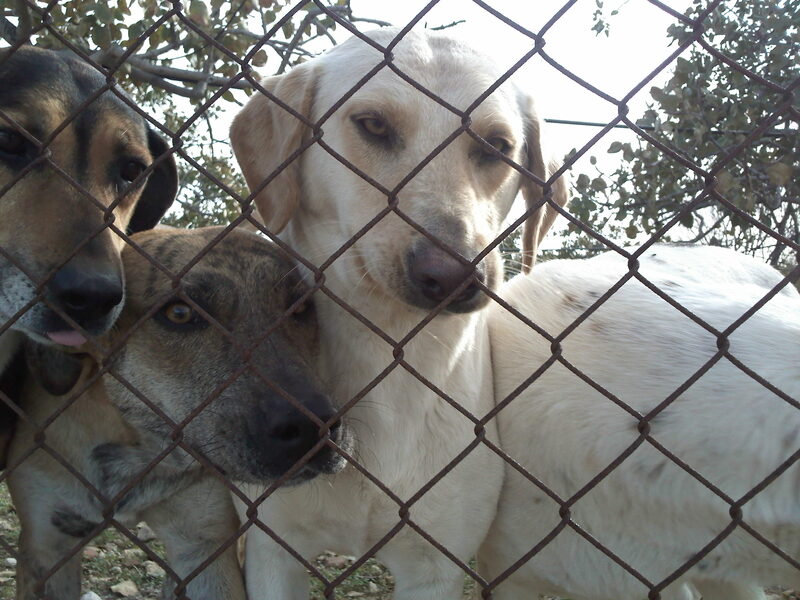 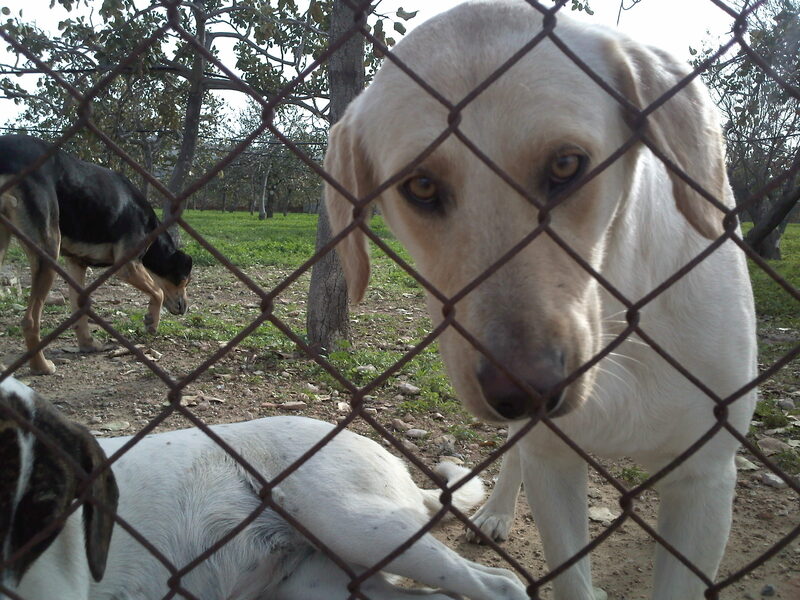 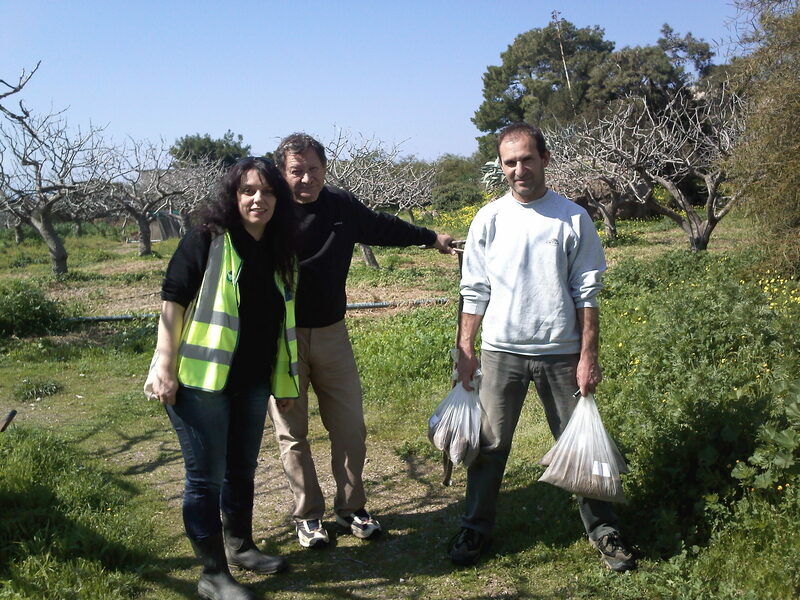 The 4th soil and water campaign took place in Aegina between 18 and 22 March 2014. 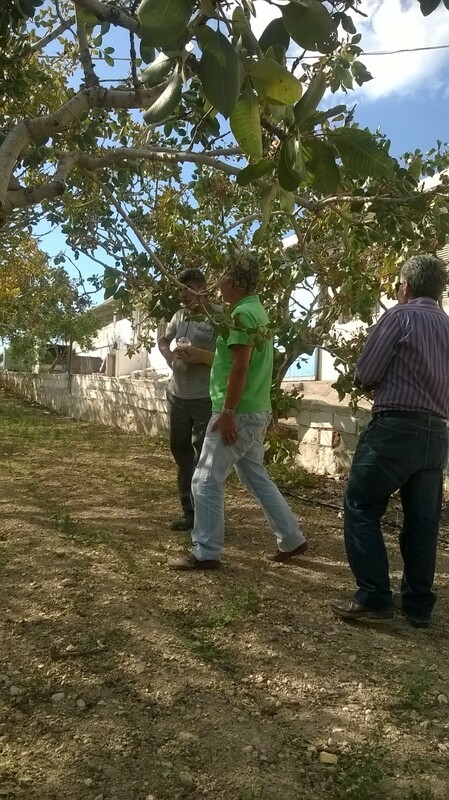 Meeting with pistachio producers of Fthiotida. 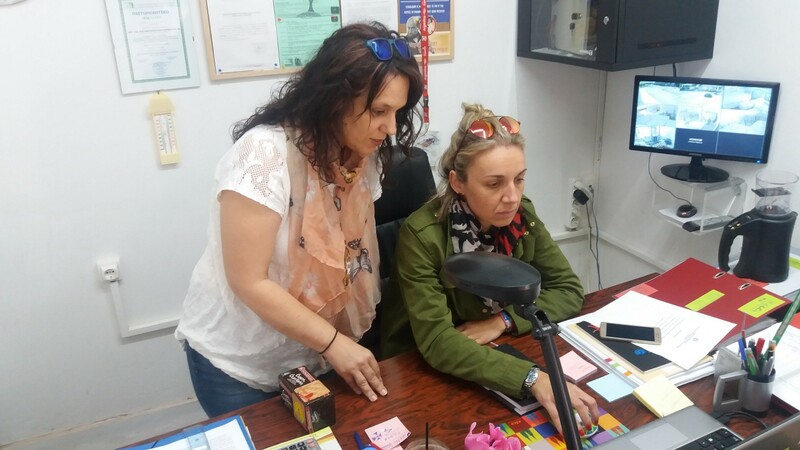 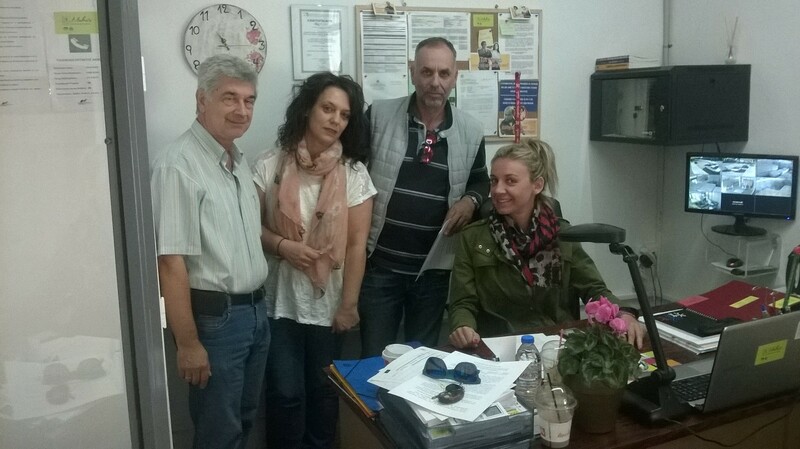 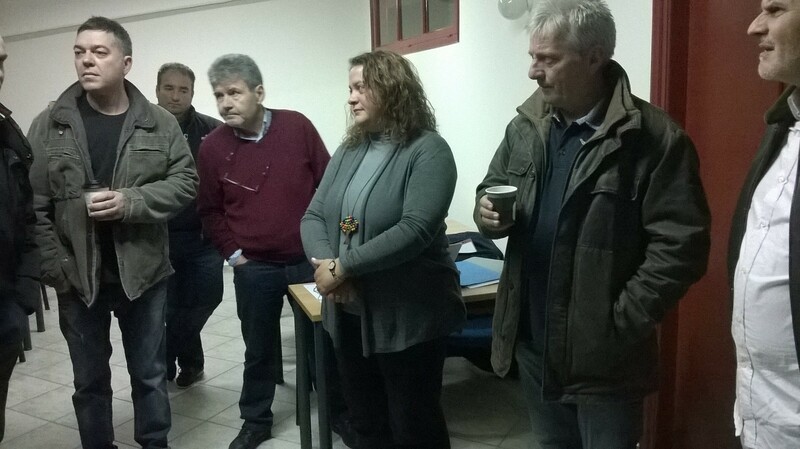 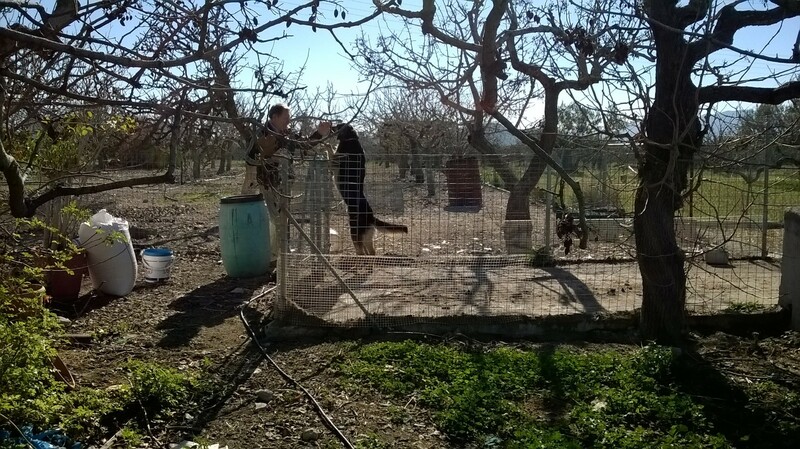 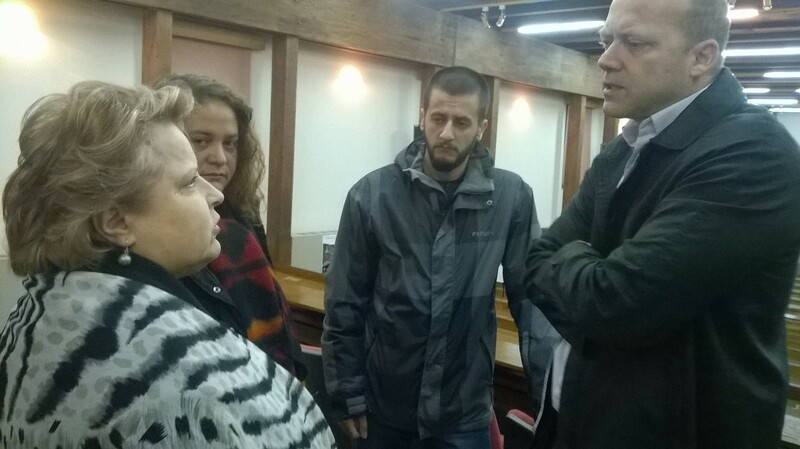 The coordinator, Dr. Maria Doula met representatives of the two Agricultural Cooperatives of Makris and Molos in Fthiotida prefecture. 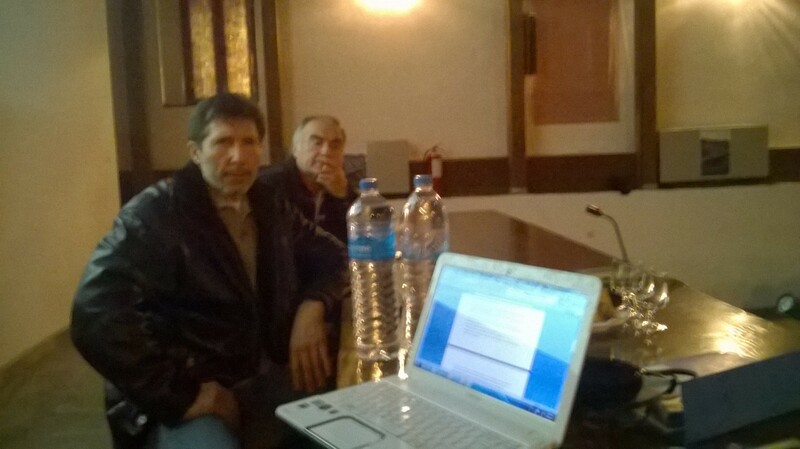 Dyring two fruitful meetings Dr. M. Doula informed the local cooperatives regarding AgroStrat aims and the expected results. 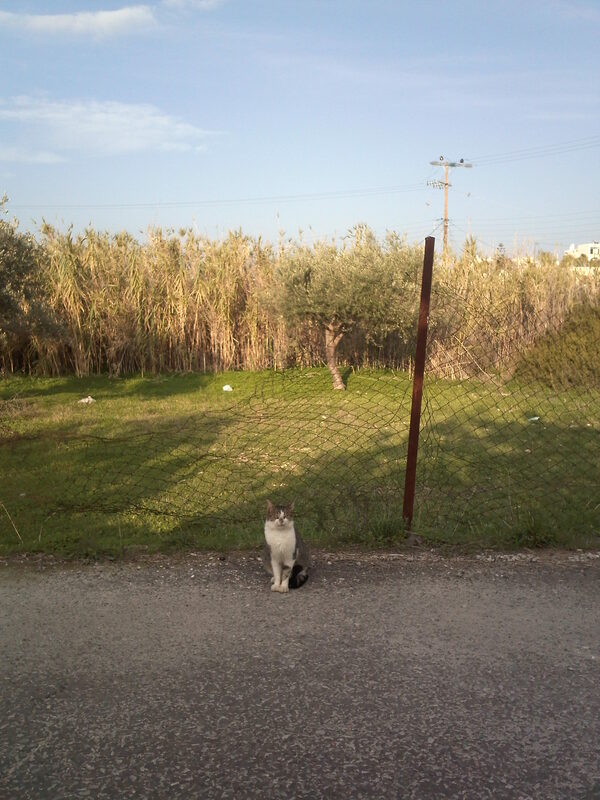 Future cooperation was agreed. 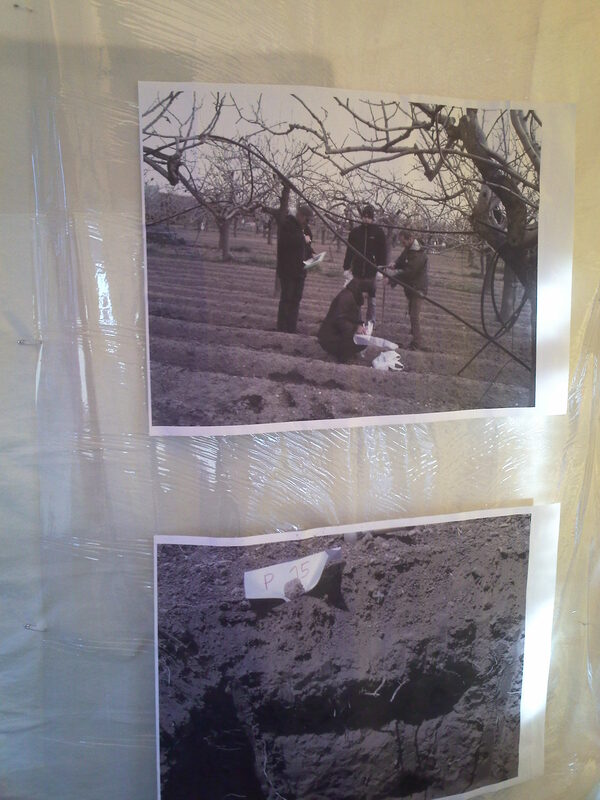 Soil and water samples from local pistachio orchards were also collected. 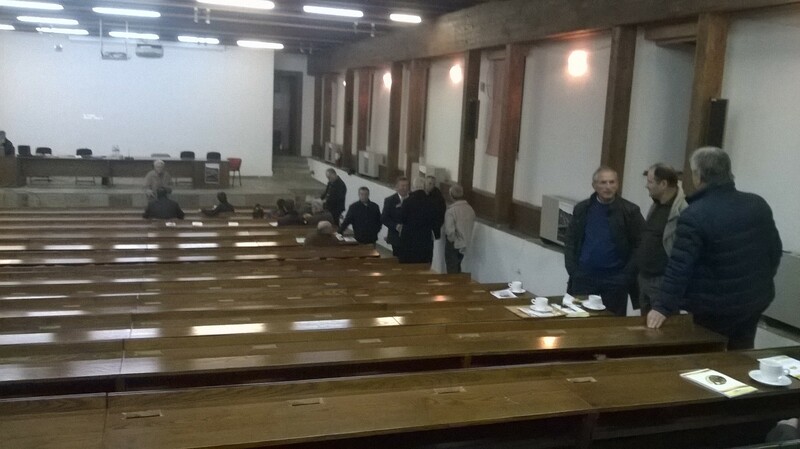 Many little followers of AgroStrat are presented in this gallery. 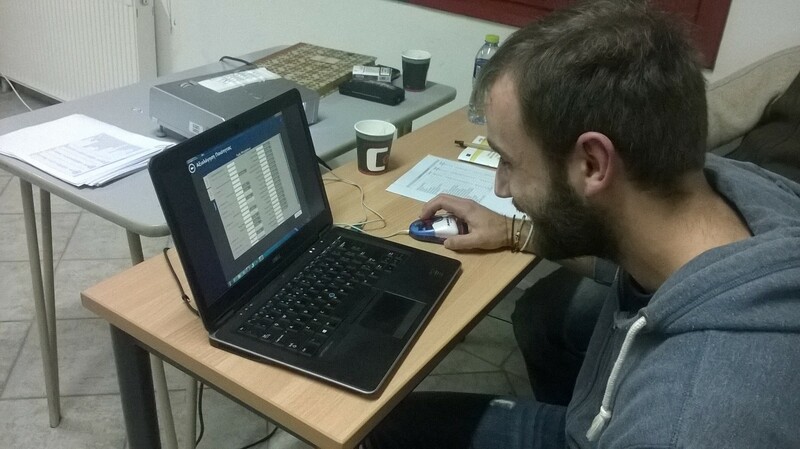 They follow the sampling team, they entered in the hotel rooms and stayed for the night or just participated in the sampling procedure!!! 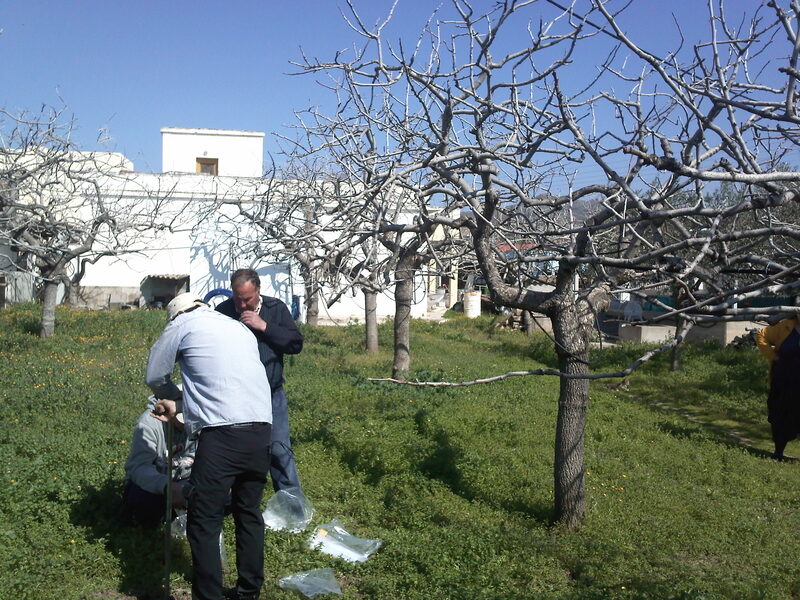 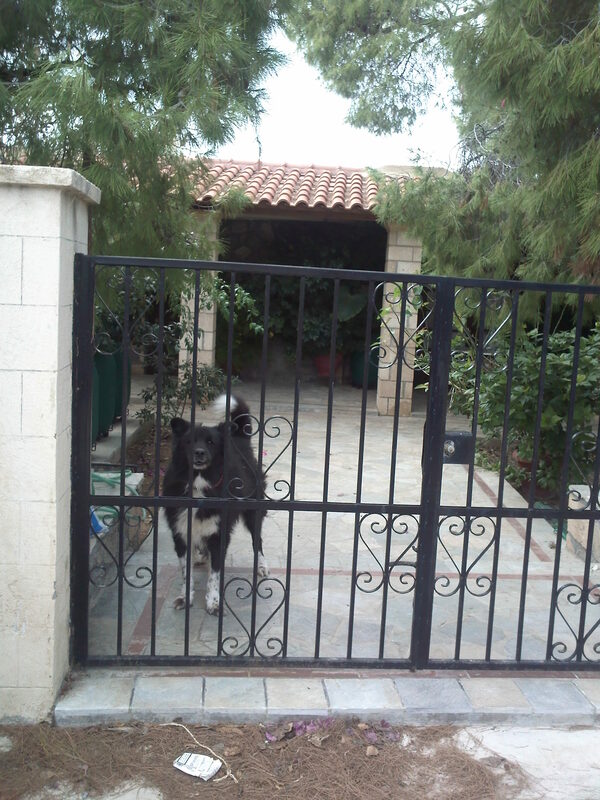 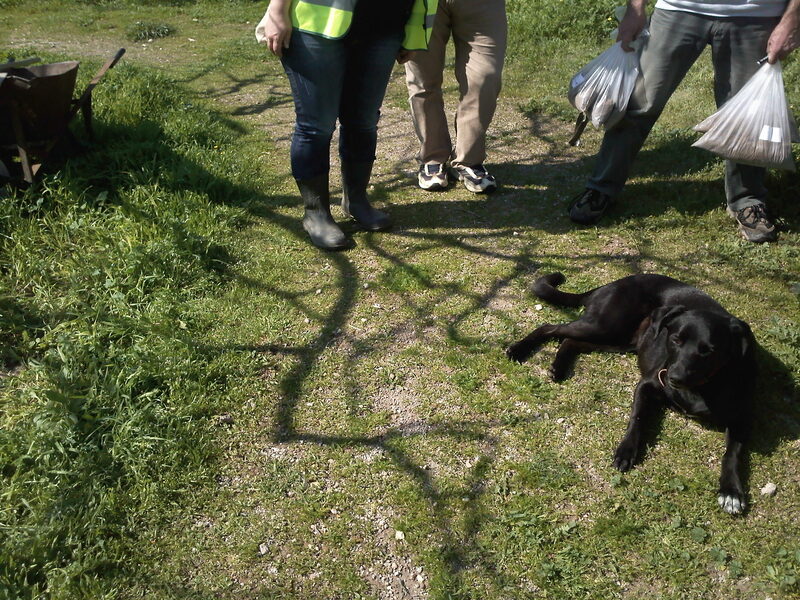 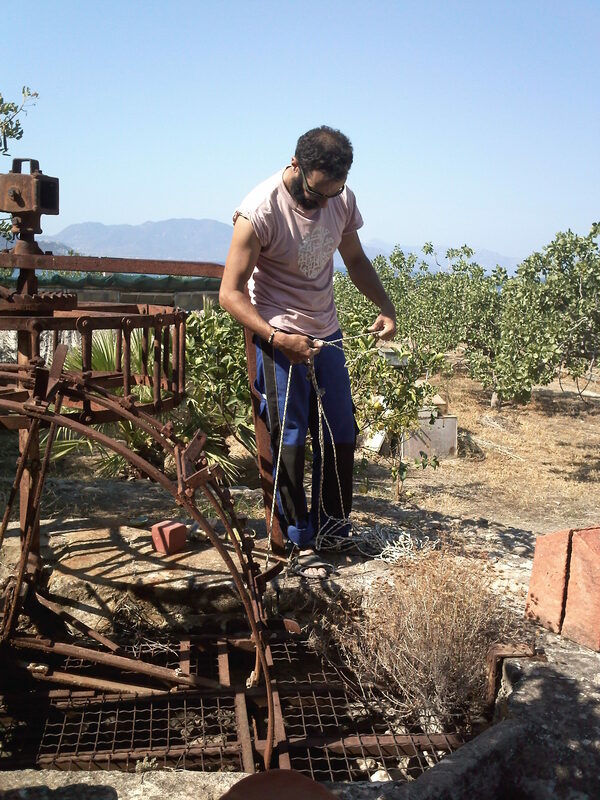 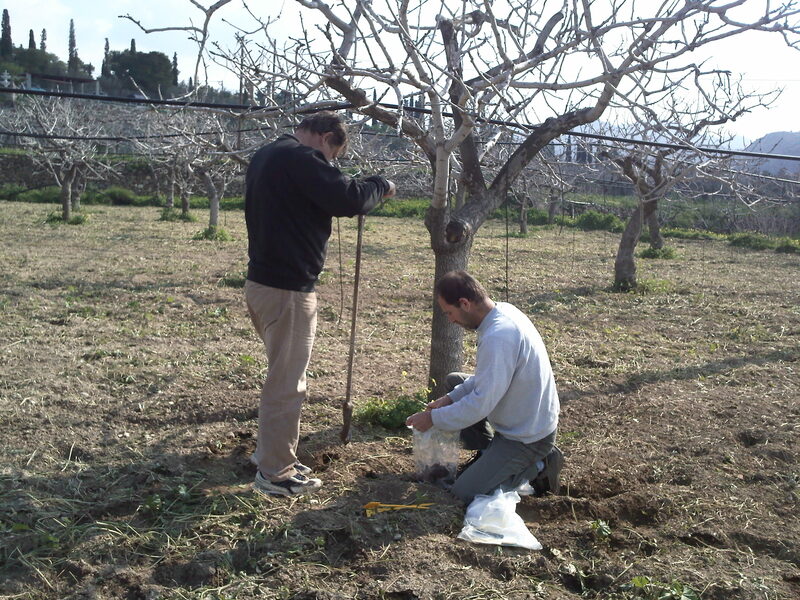 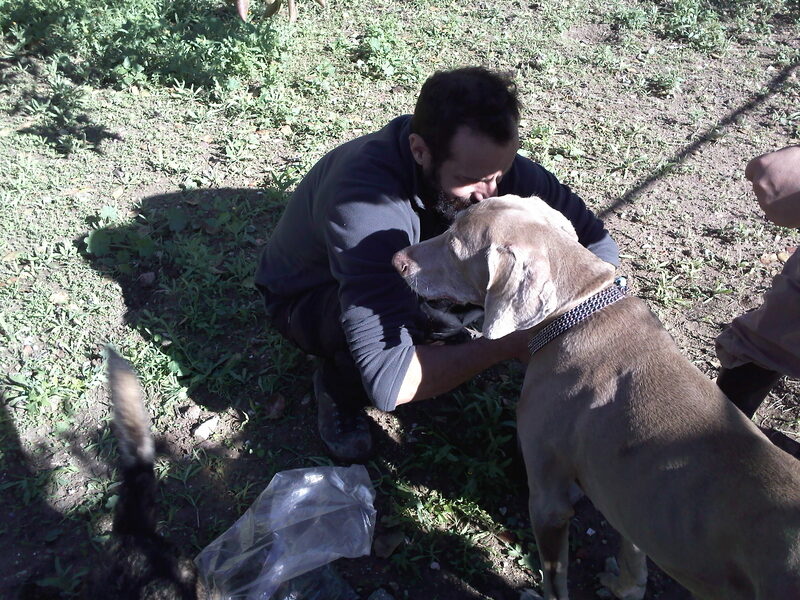 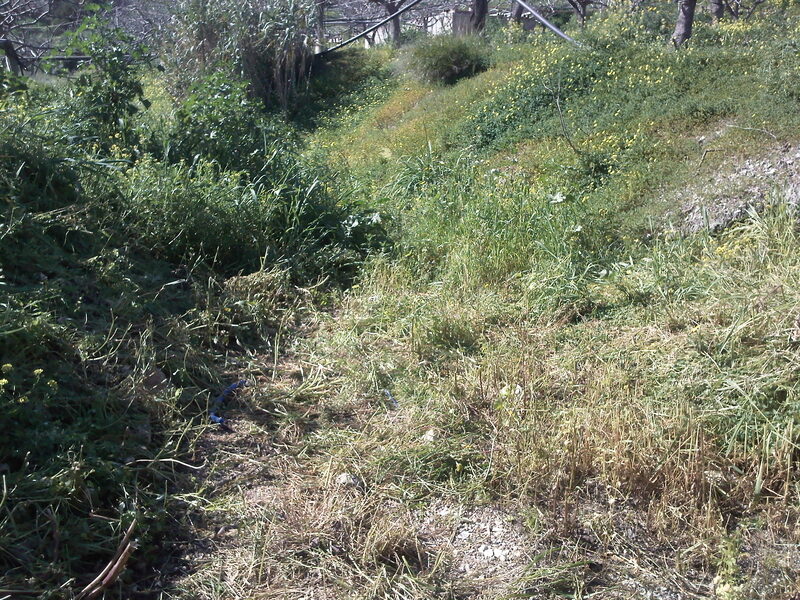 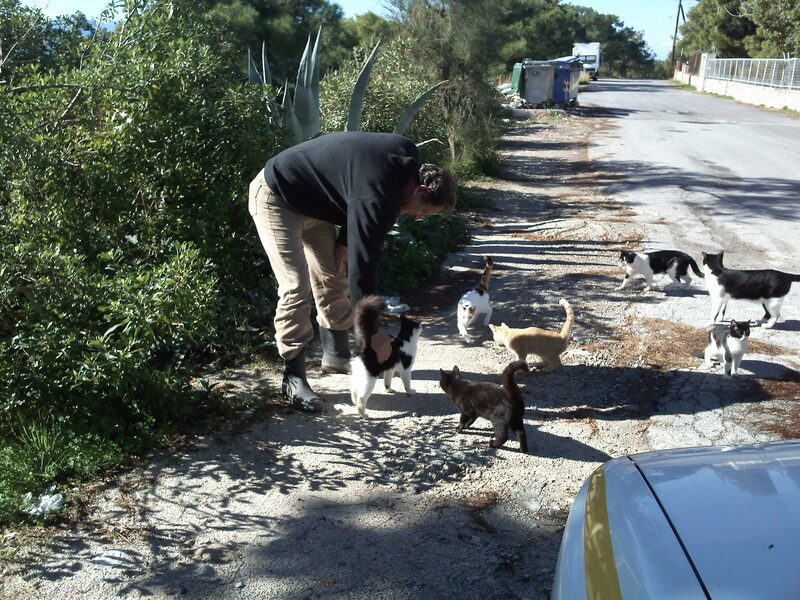 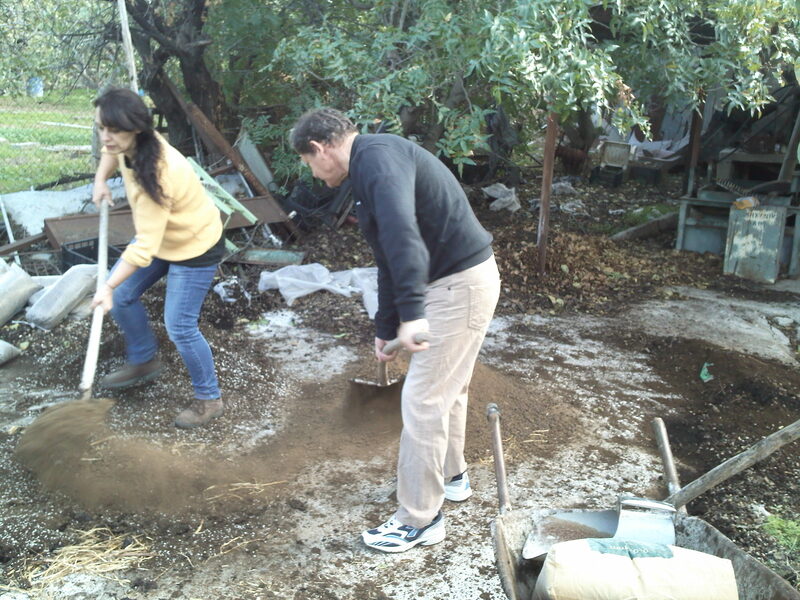 The sampling team of SSIA visited Aegina in November 2013 and collected soil and water samples. 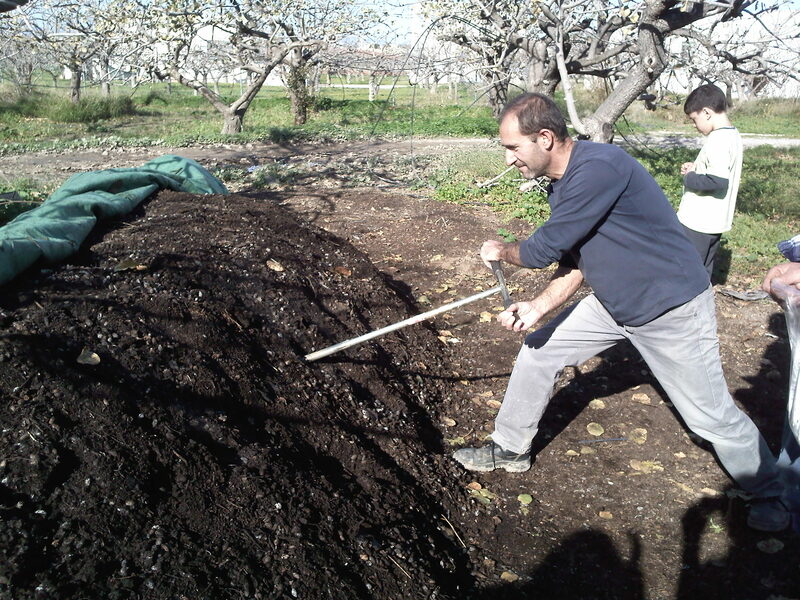 Composting experiments took also place at a pilot field. 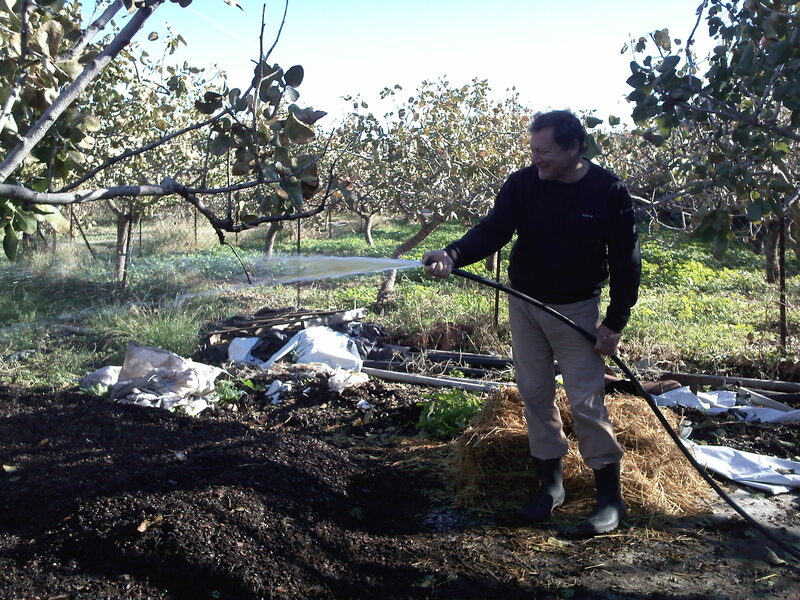 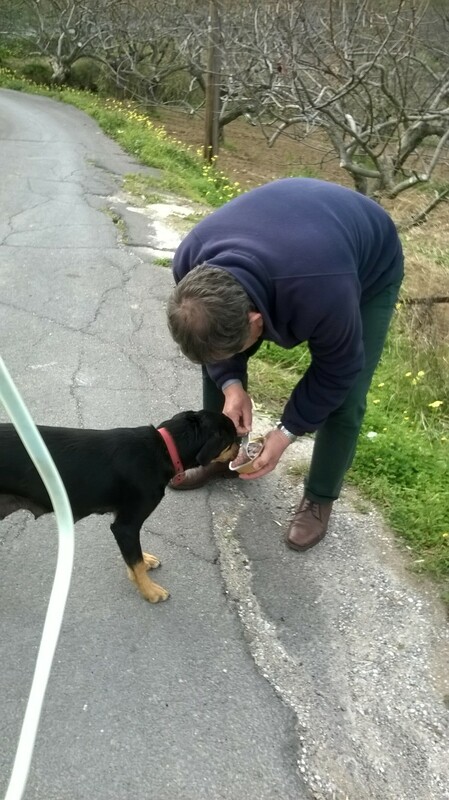 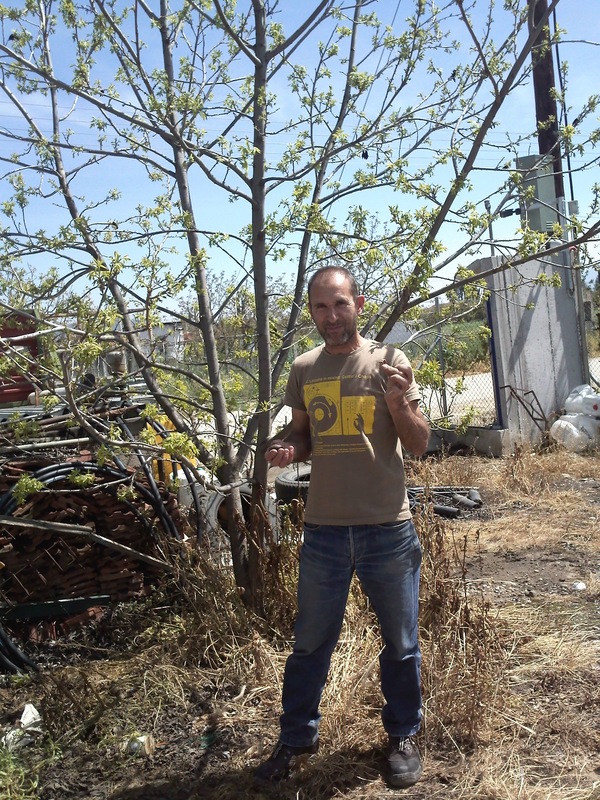 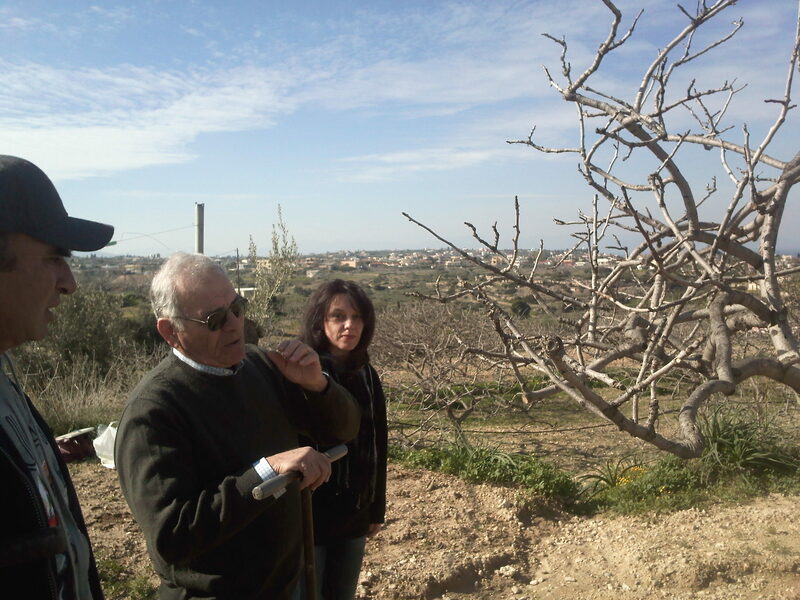 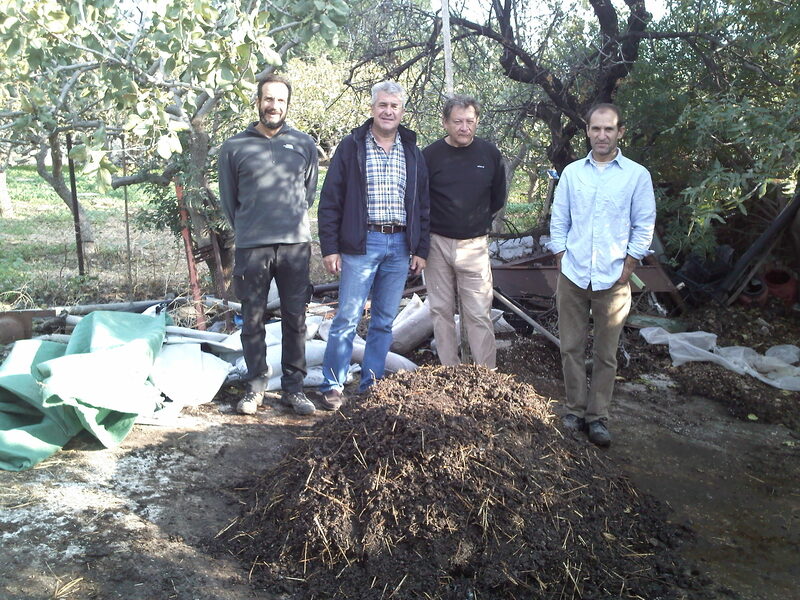 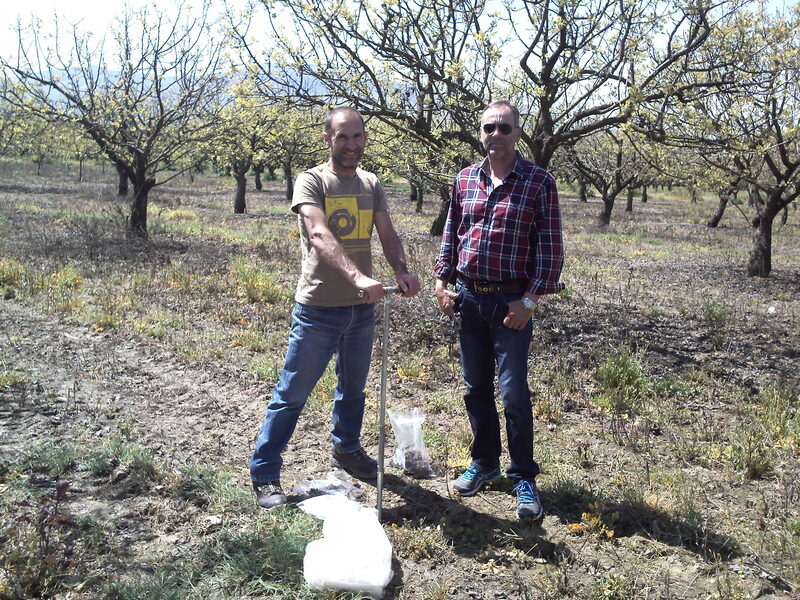 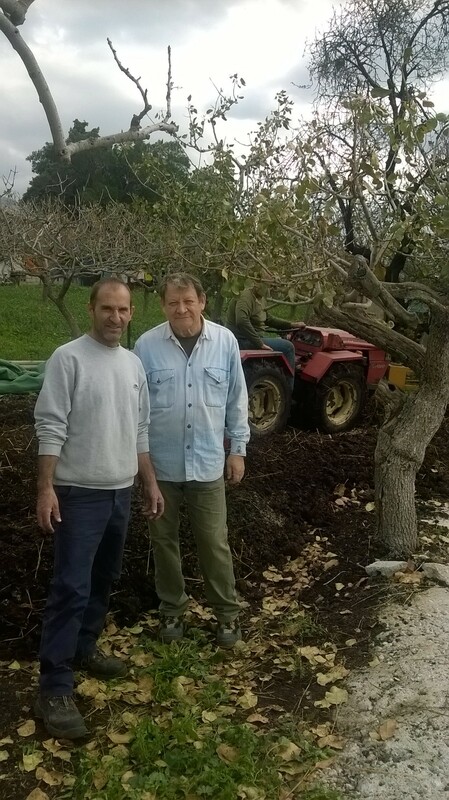 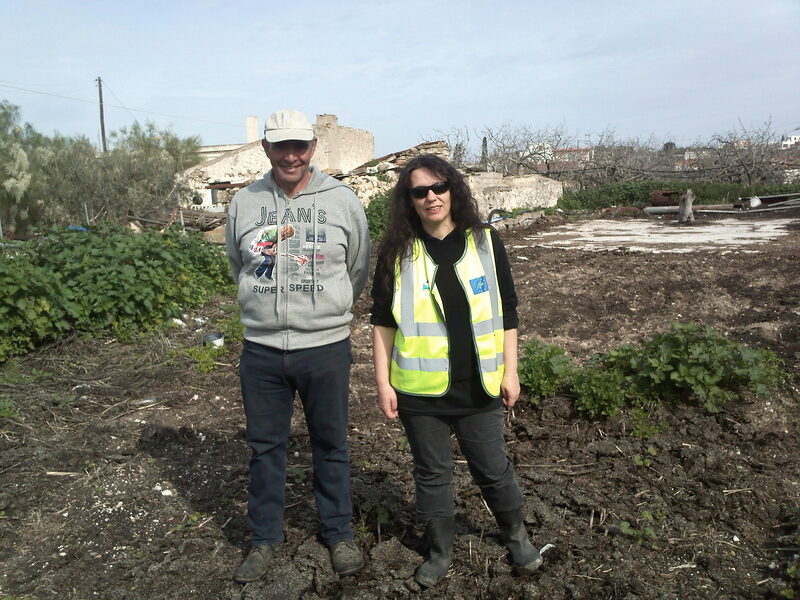 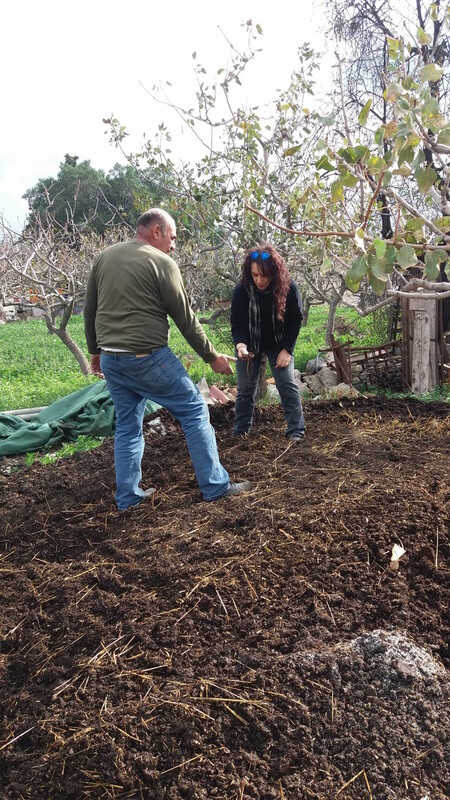 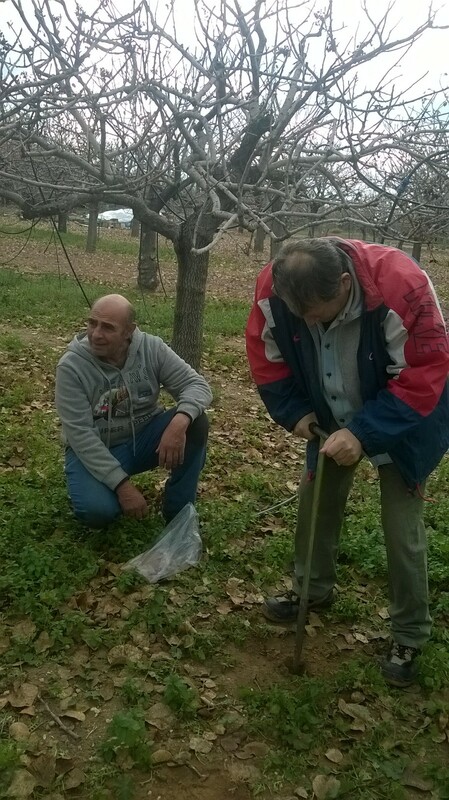 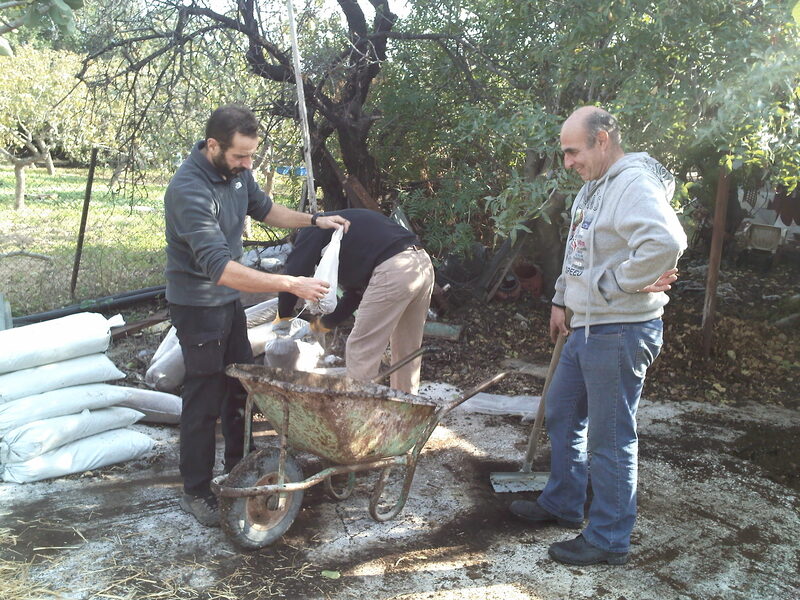 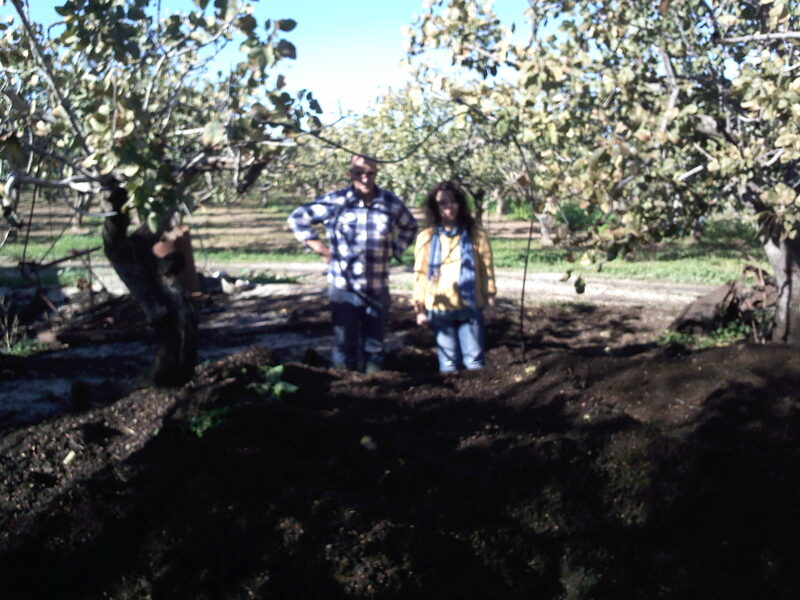 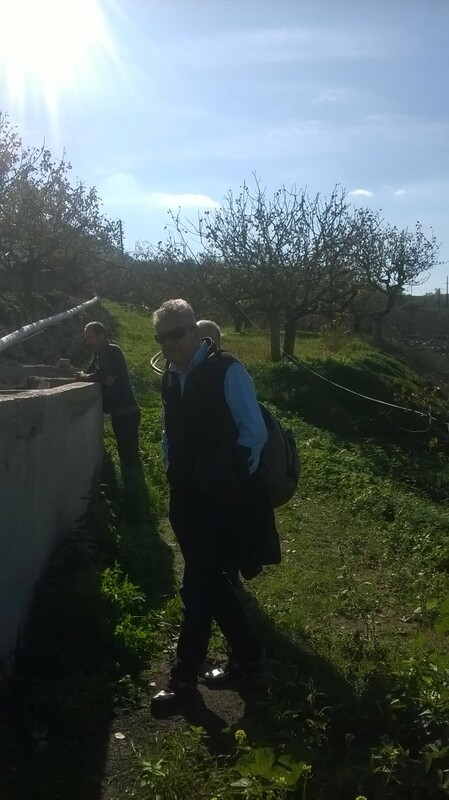 Prof. Kostas Komnitsas, the leader of TUC team, visited also Aegina and participated in sampling and composting. 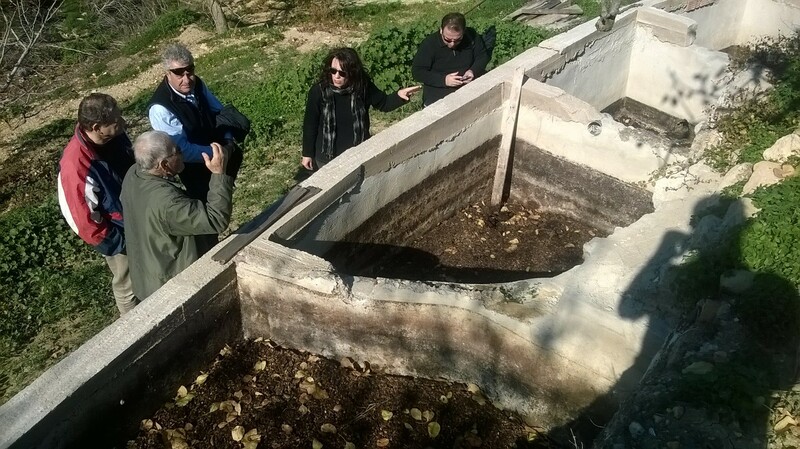 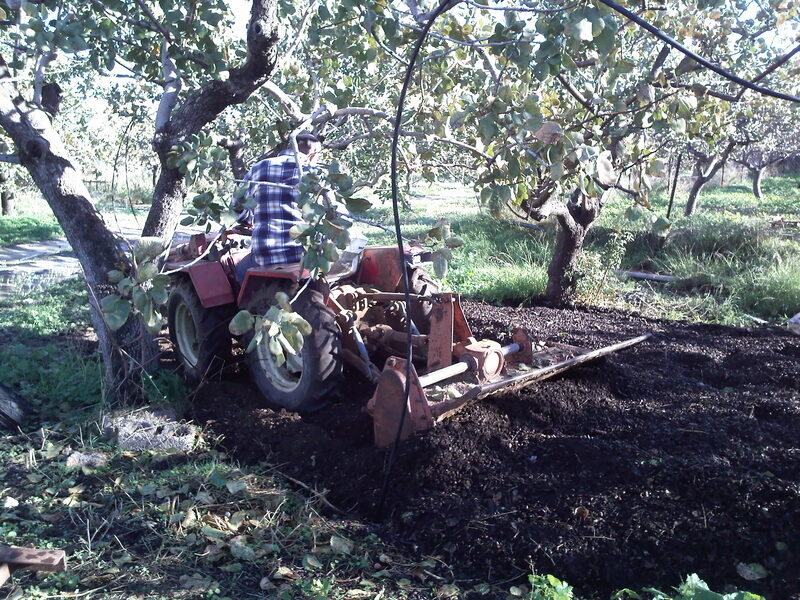 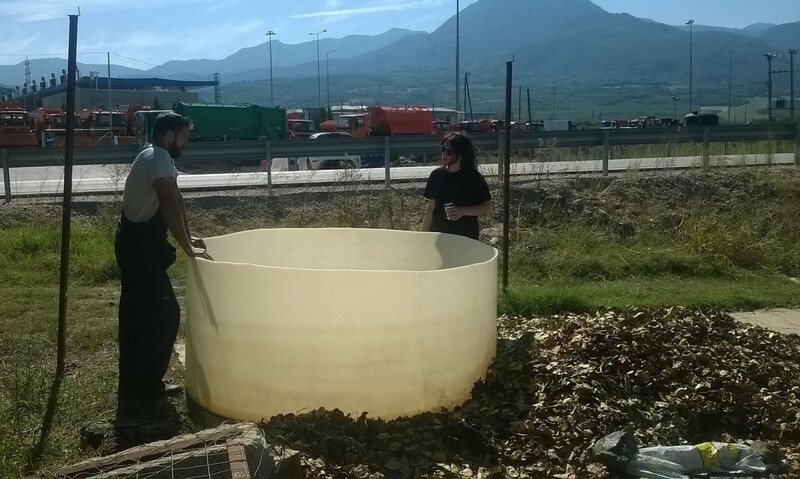 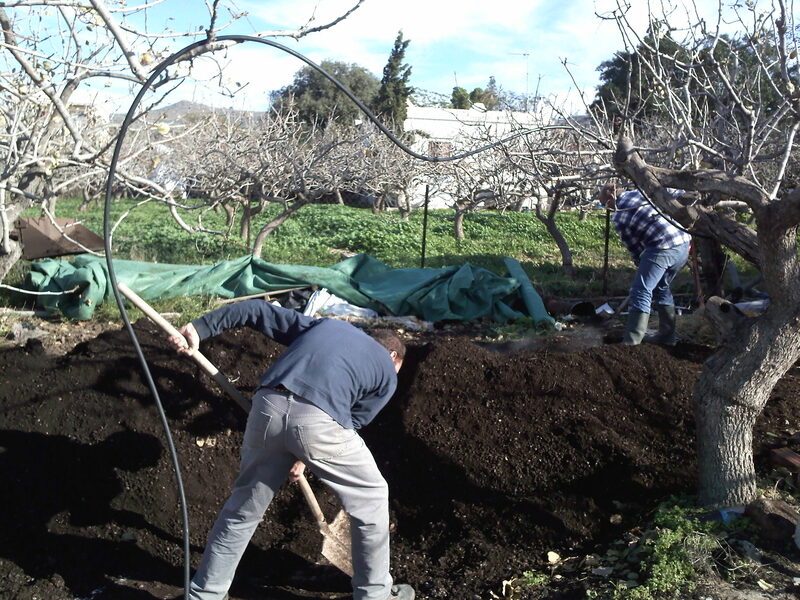 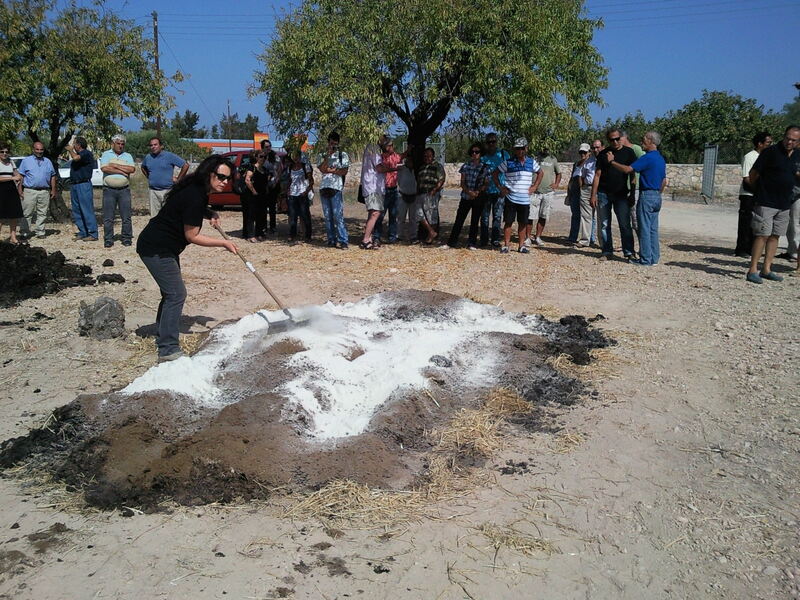 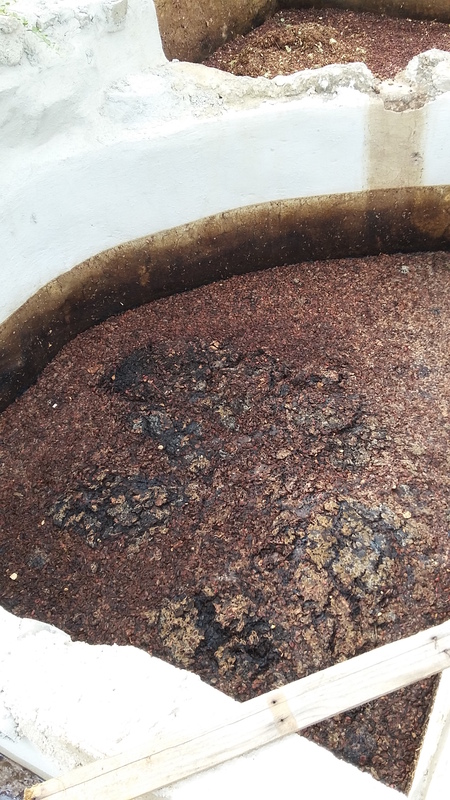 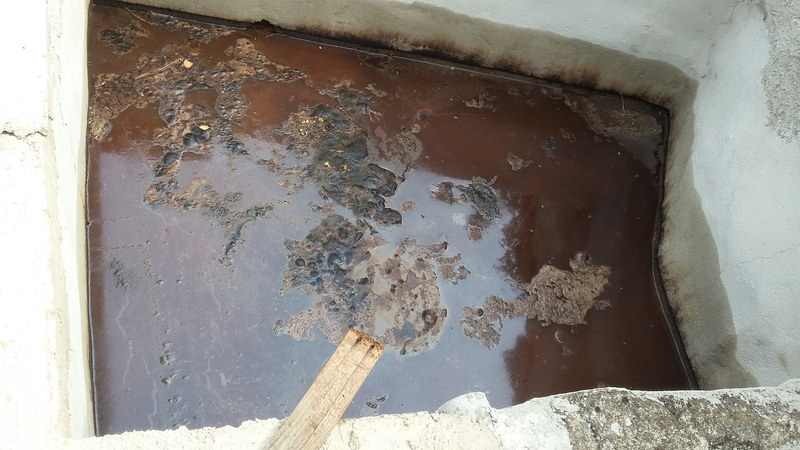 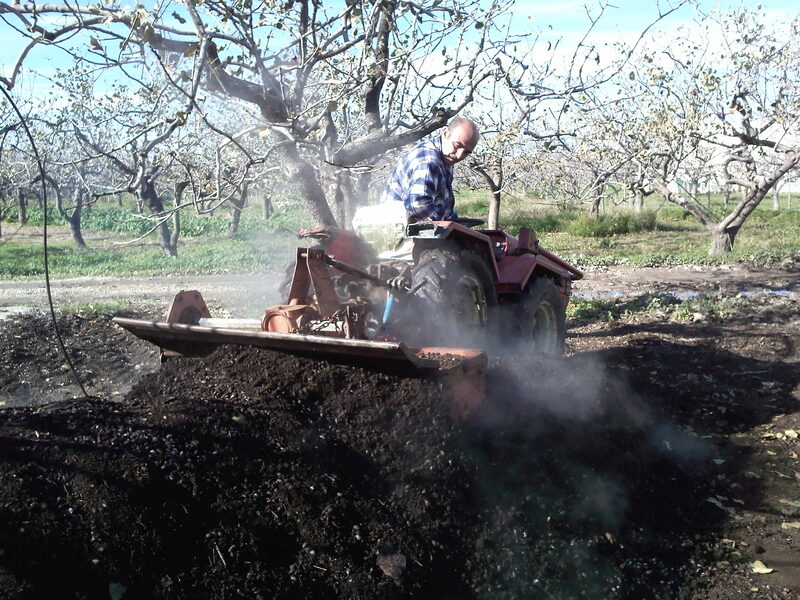 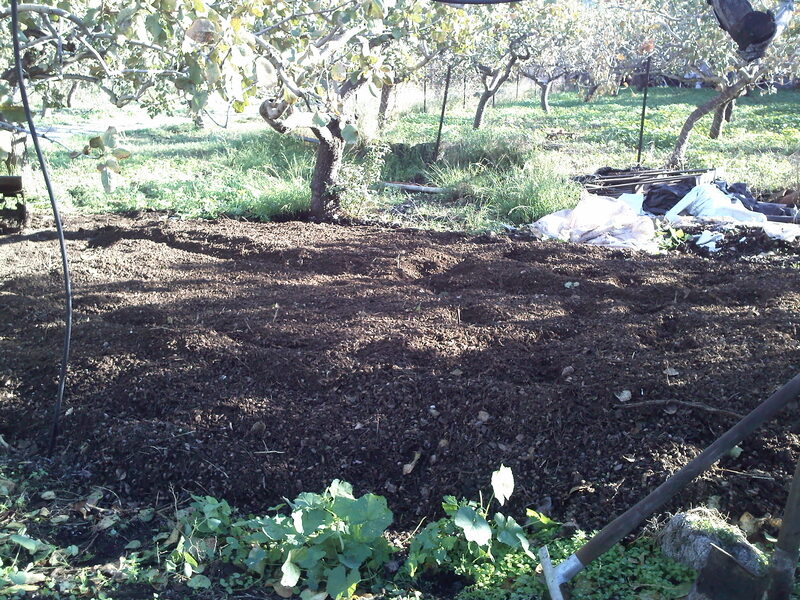 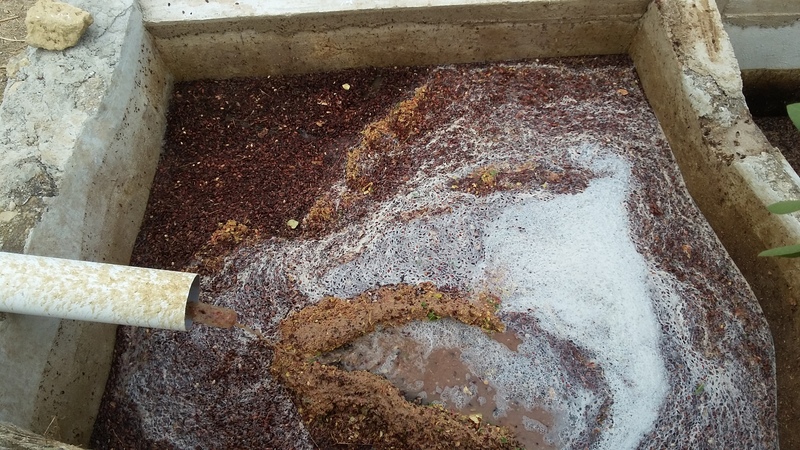 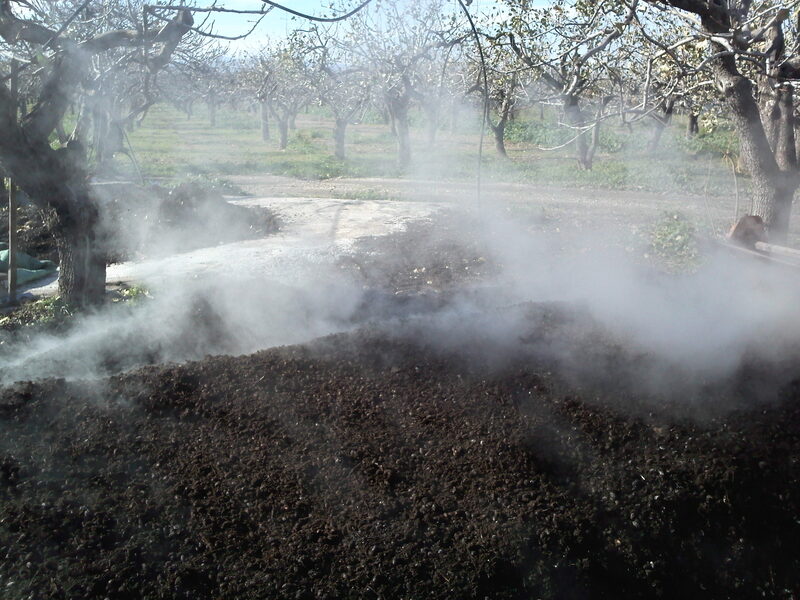 Following the foreseen activities of Action A3, pistachio wastes were composted with other raw materials (straw, manure, zeolite) at a pilot field in Aegina. 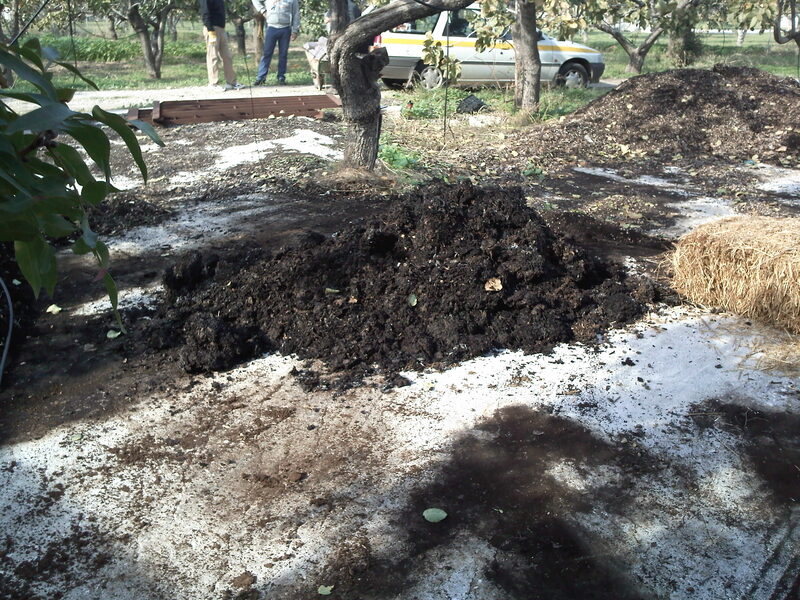 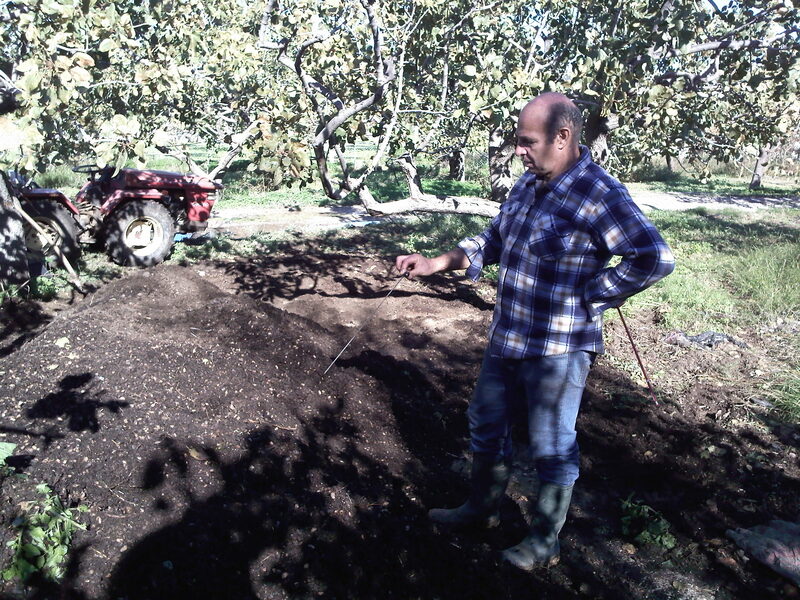 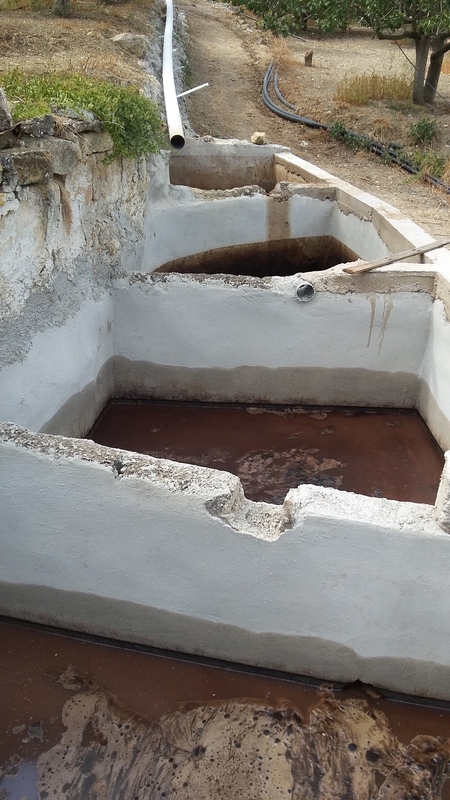 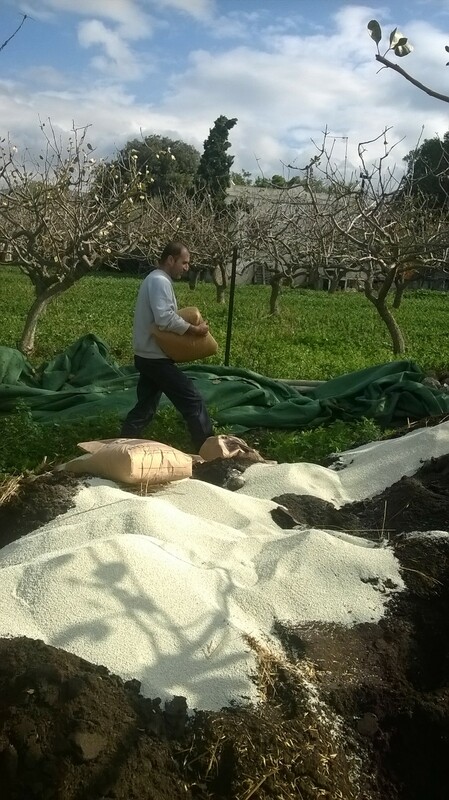 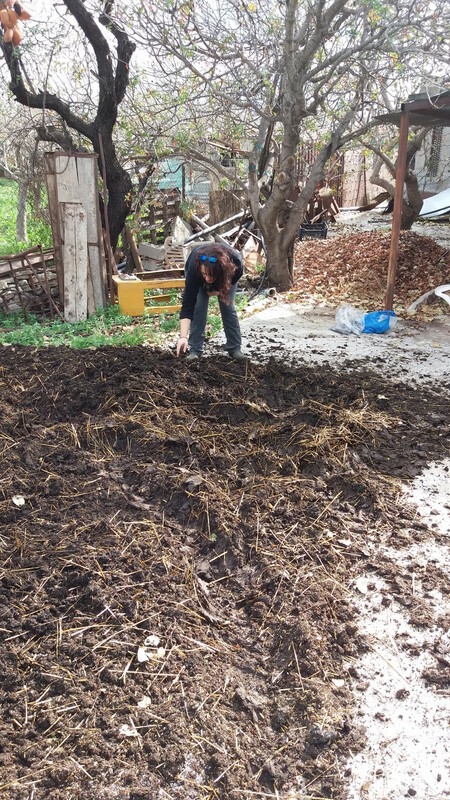 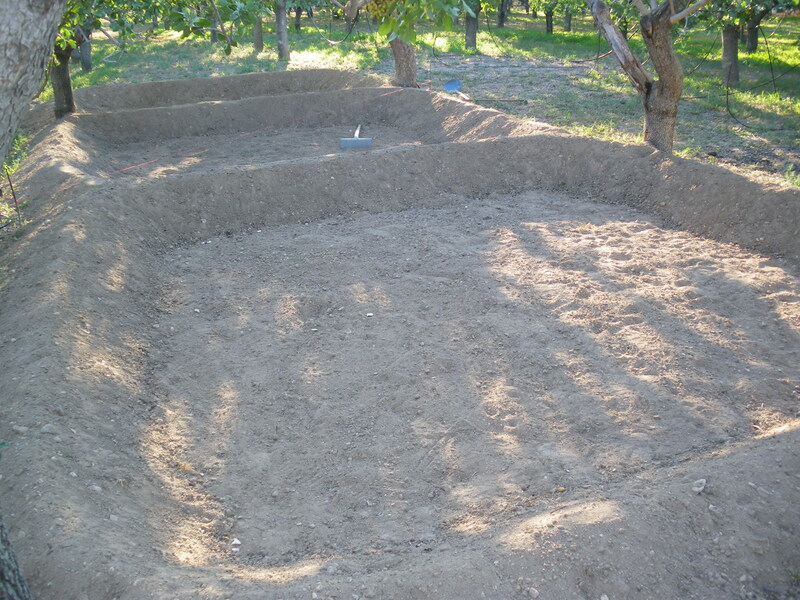 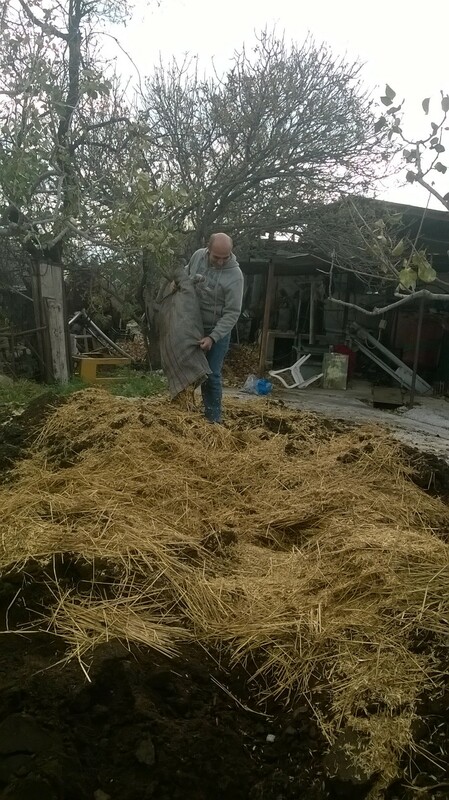 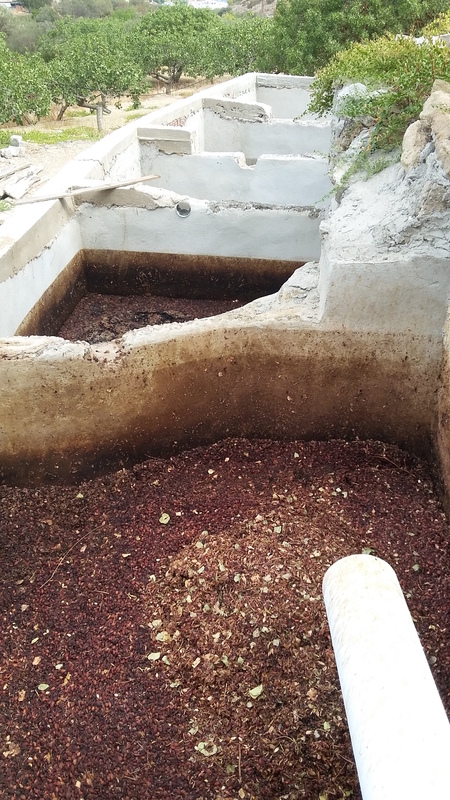 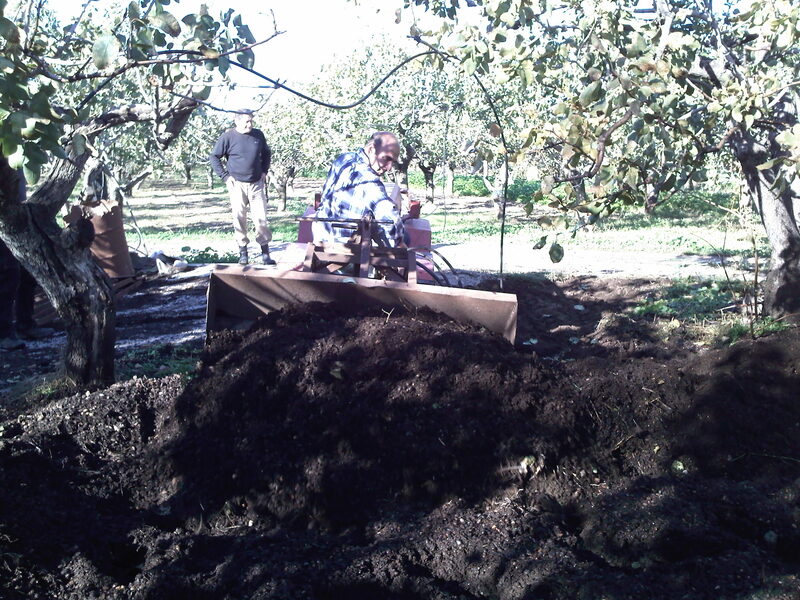 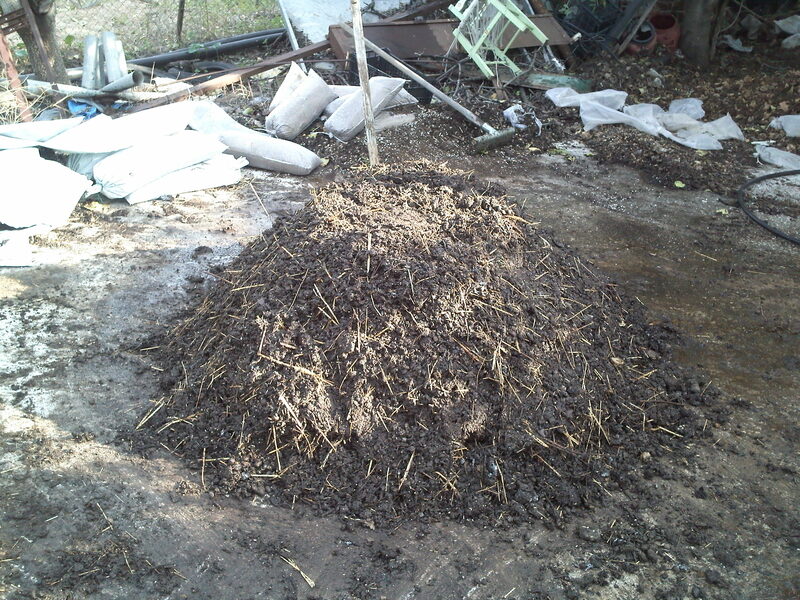 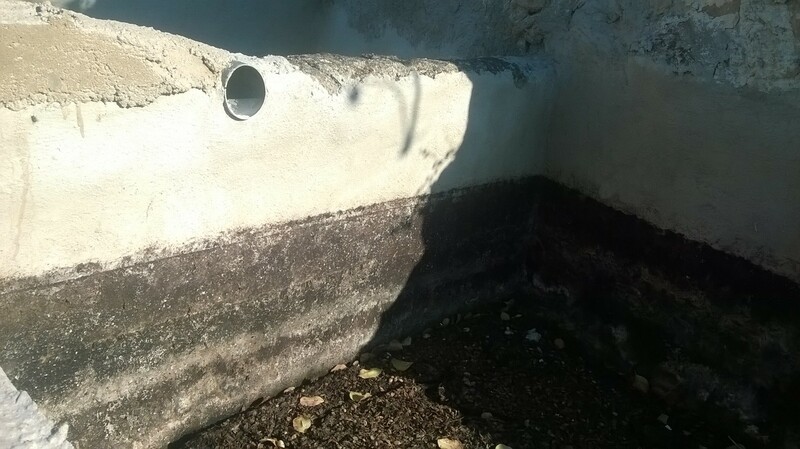 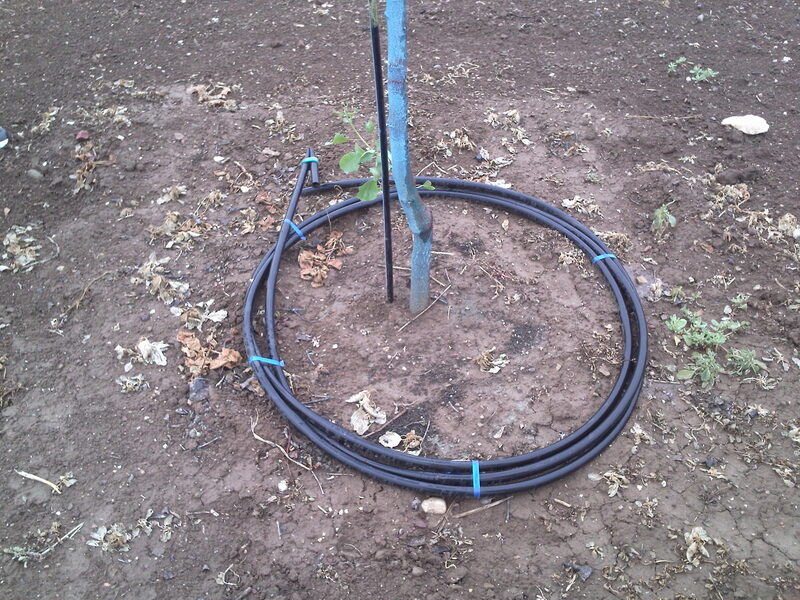 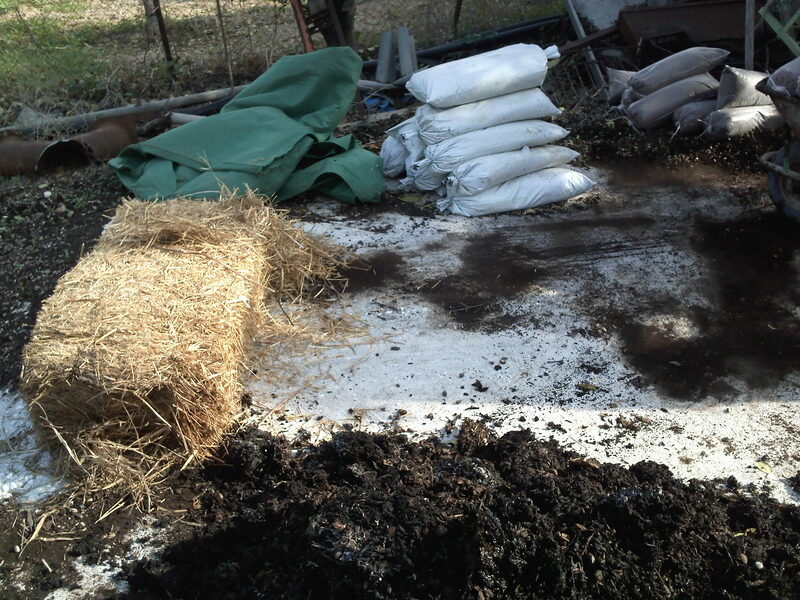 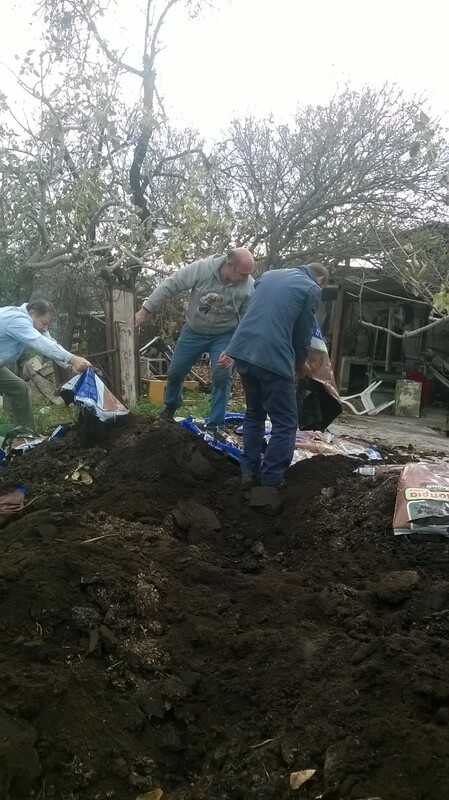 Three composts (two widrows and one pile) were prepared, two of them by using pistachio wastes, manures and straw while the third by using also clinoptilolite (natural zeolite). 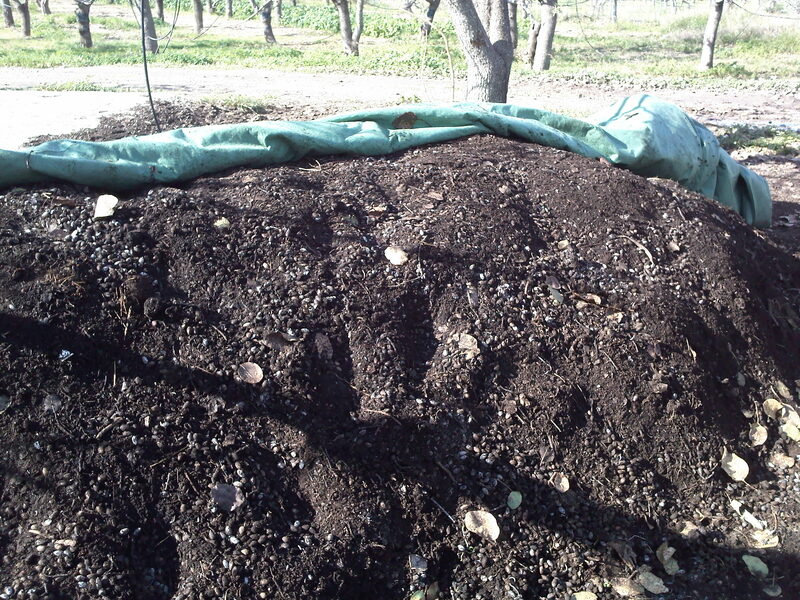 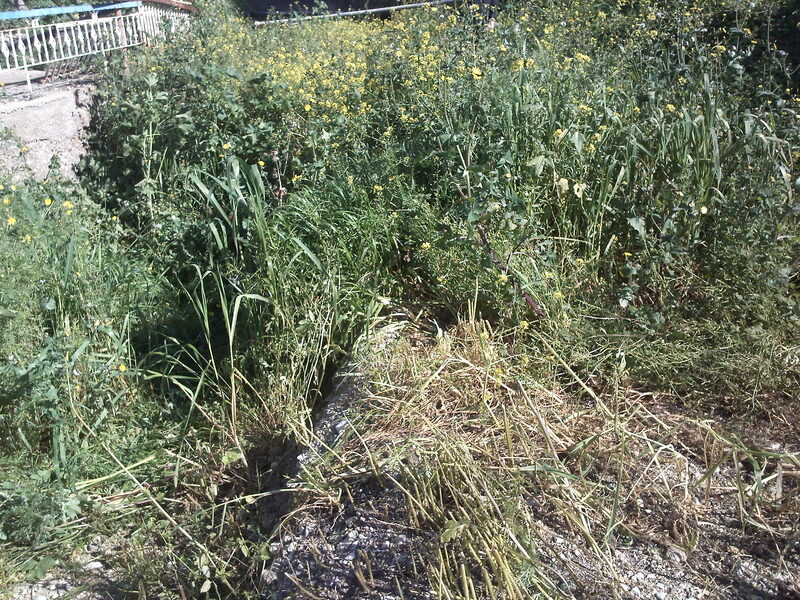 The composting experiments started in November 2013. 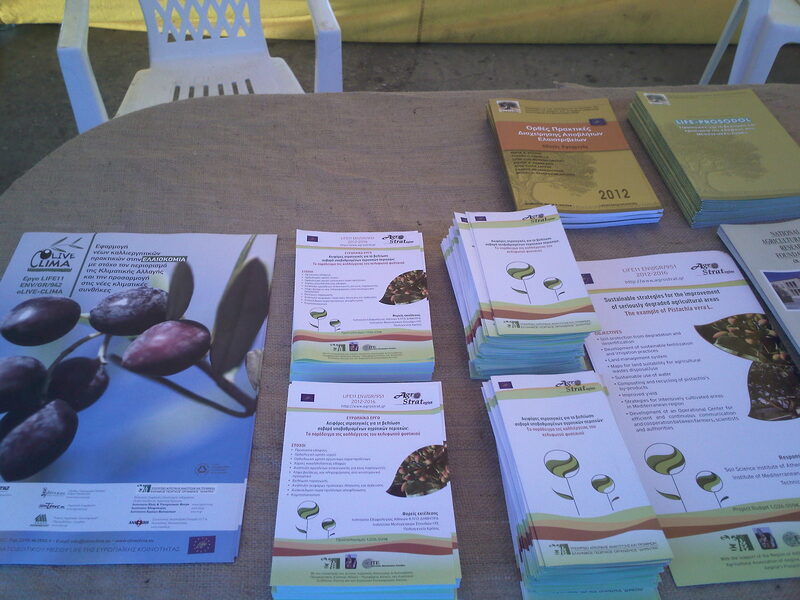 AgroStrat participated in the 5th Pistachio Fest. 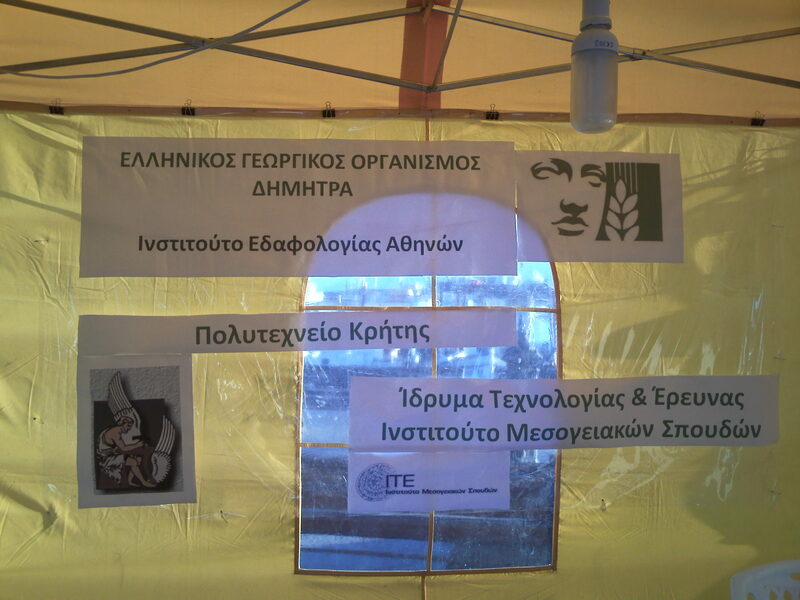 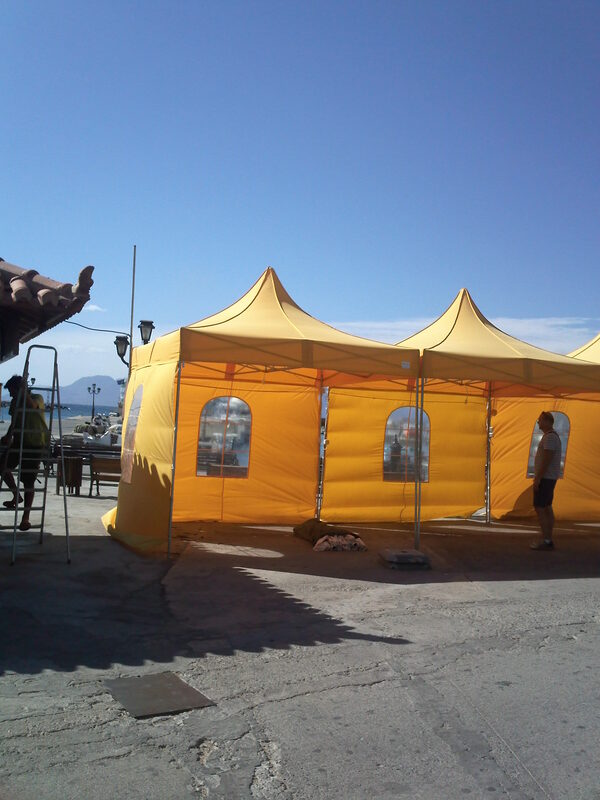 The event took place in Aegina between 19 and 22 September 2013. 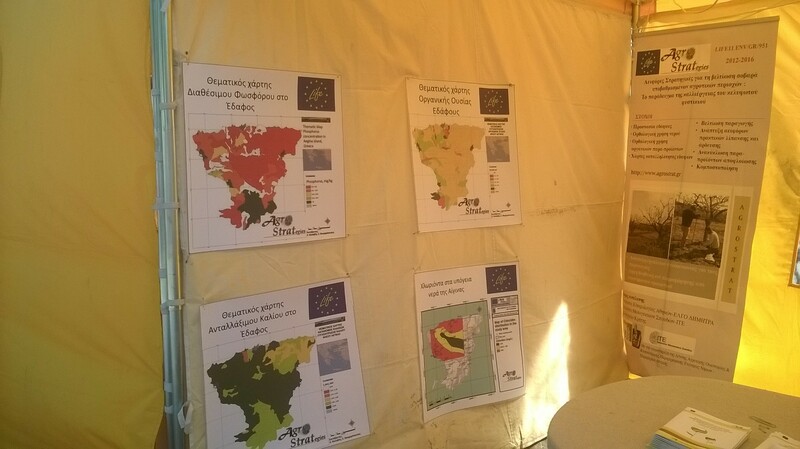 More than 2000 people visited the AgroStrat's kiosk. 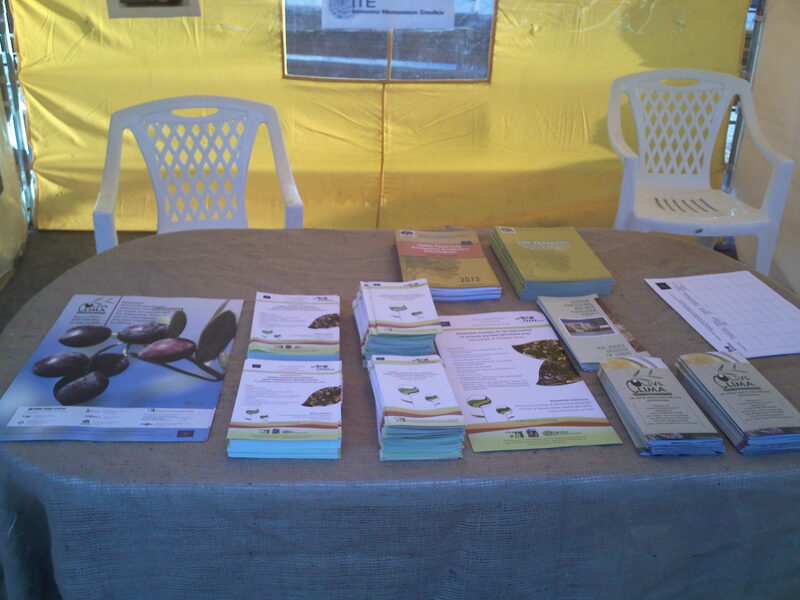 Dissemination and informative material was distributed. 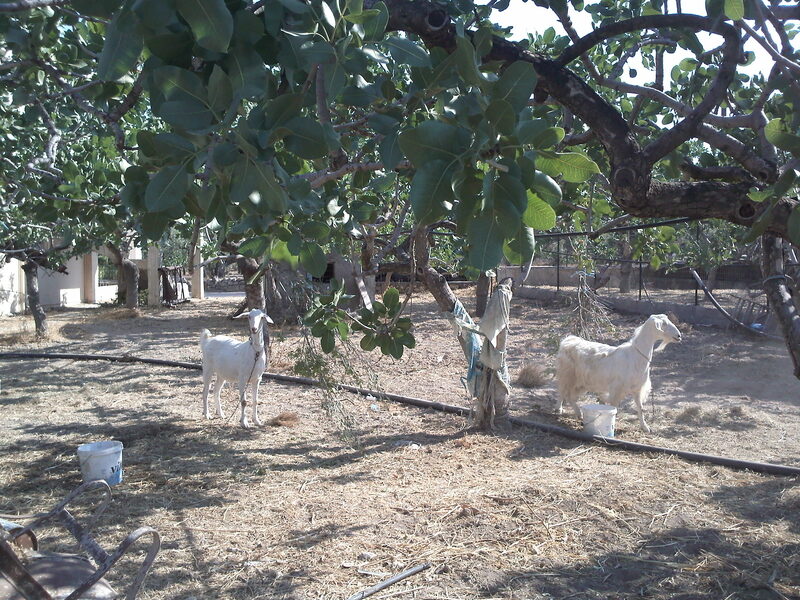 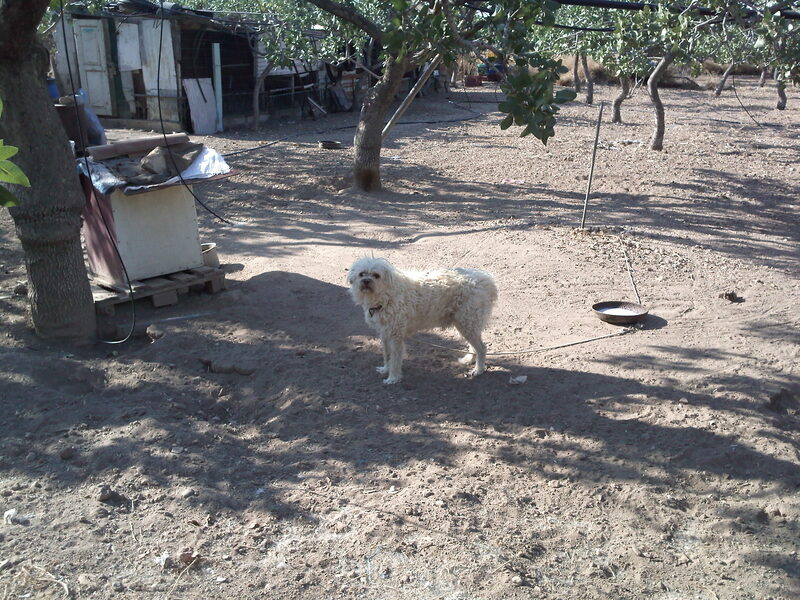 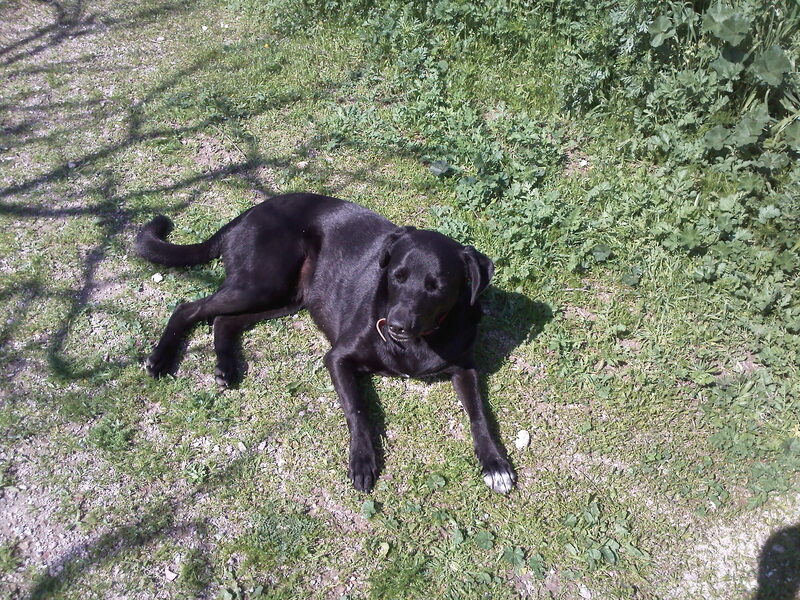 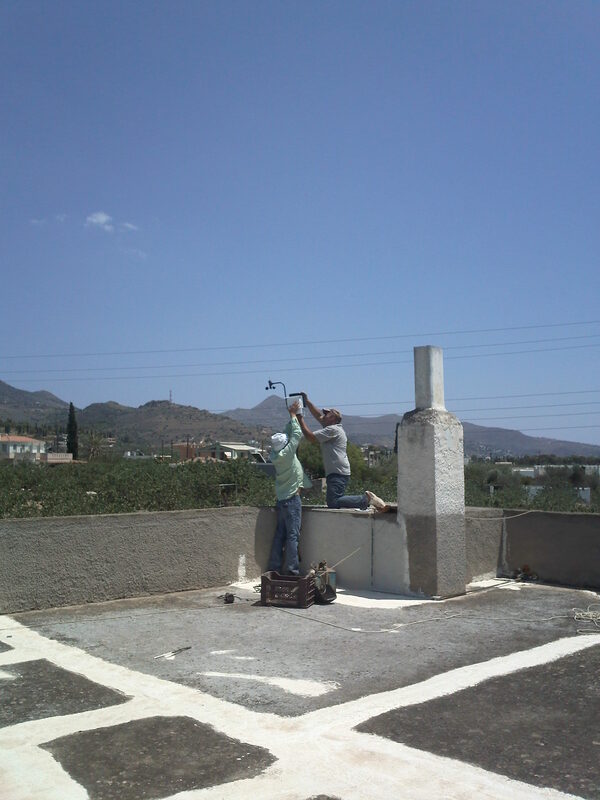 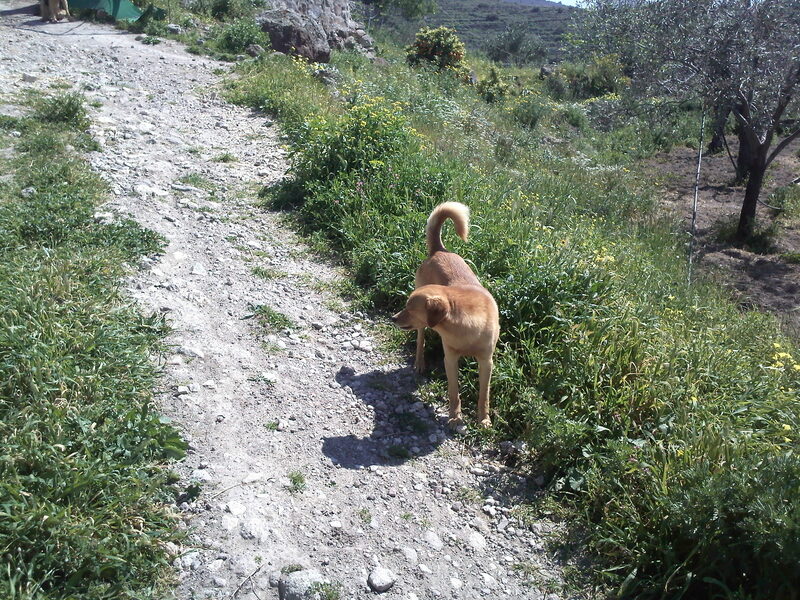 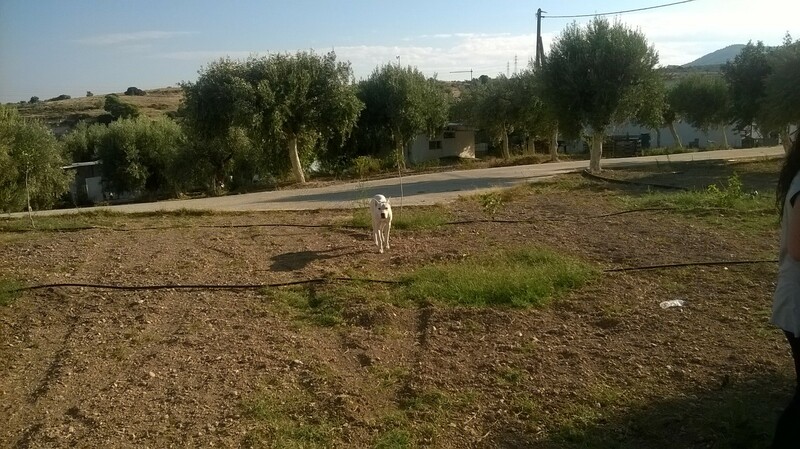 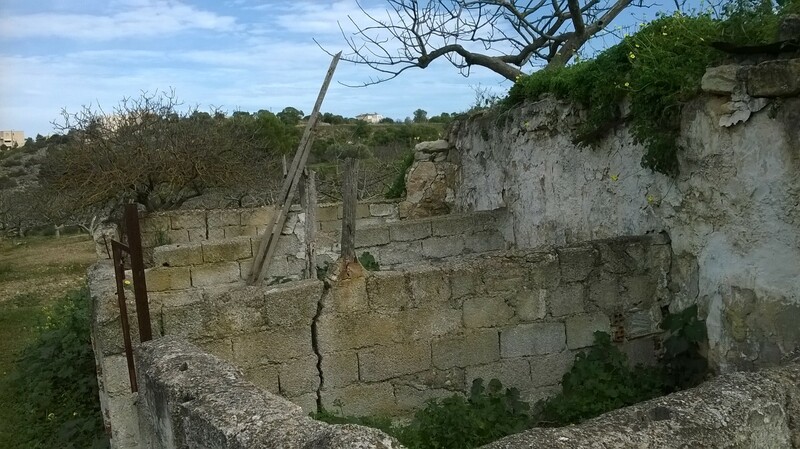 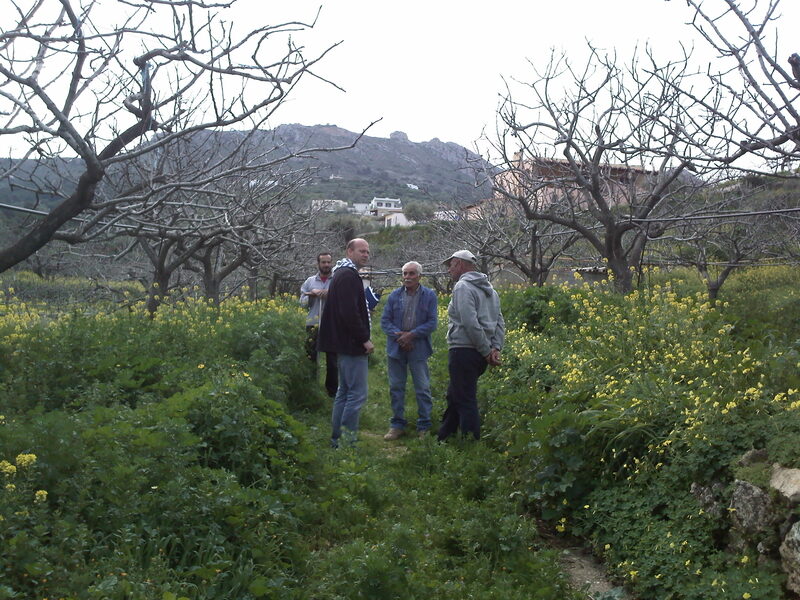 Apart from AgoStrat, two more LIFE projects (OLIVE-CLIMA και PROSODOL) in which SSIA also participates were disseminated. 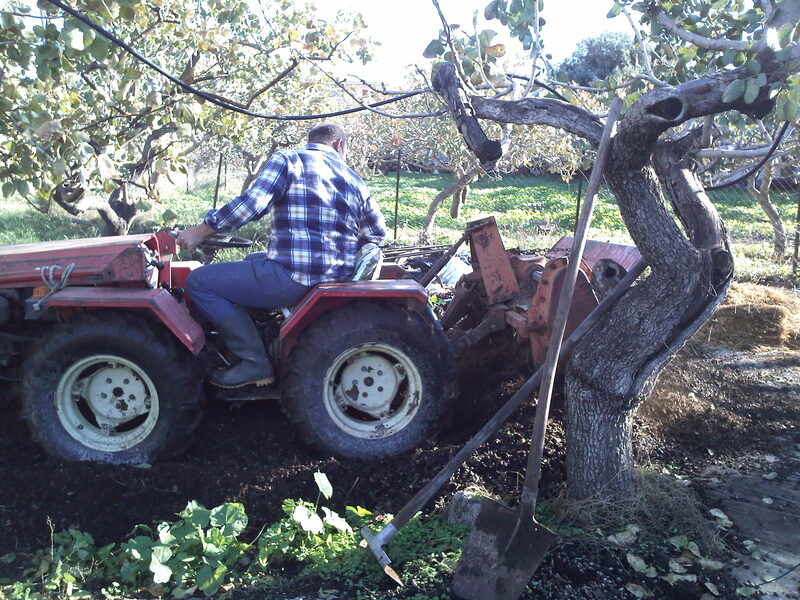 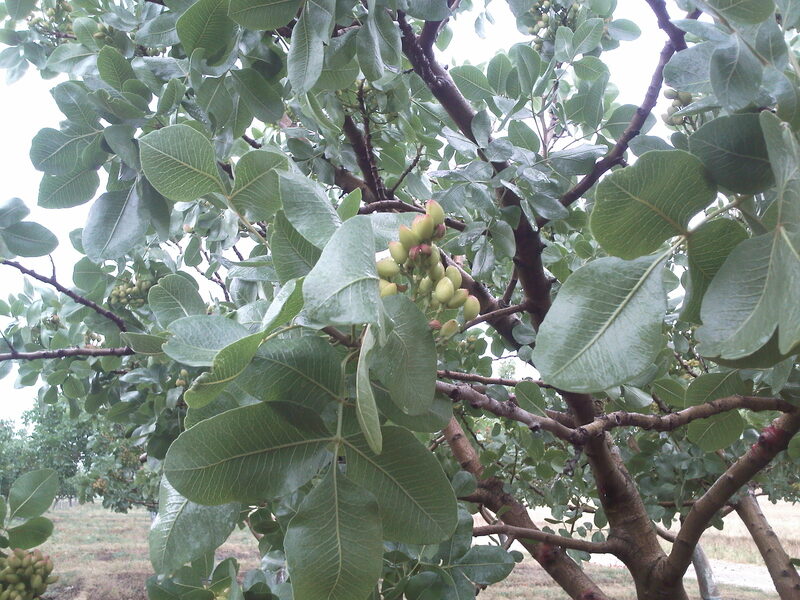 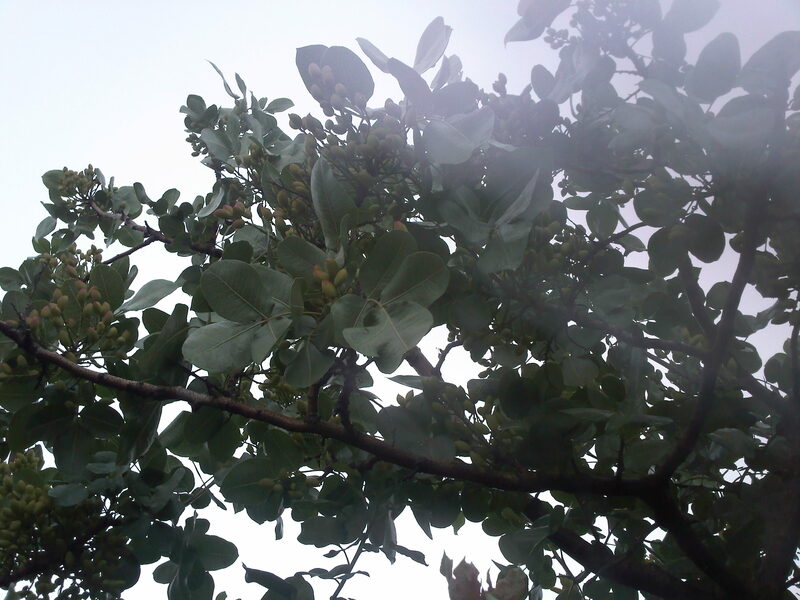 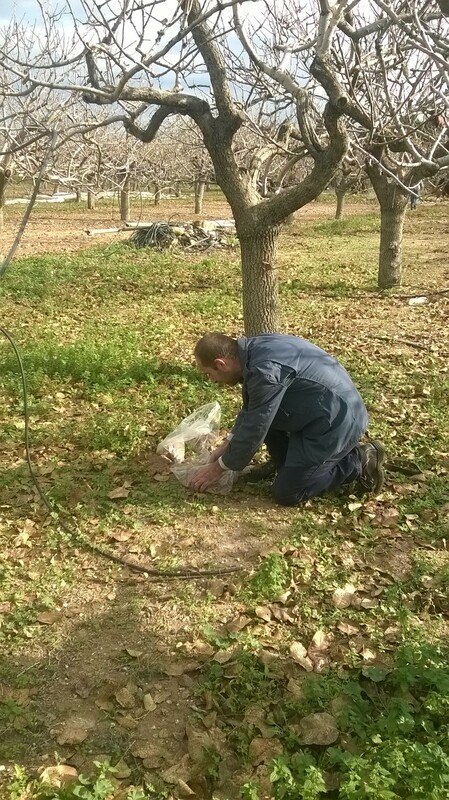 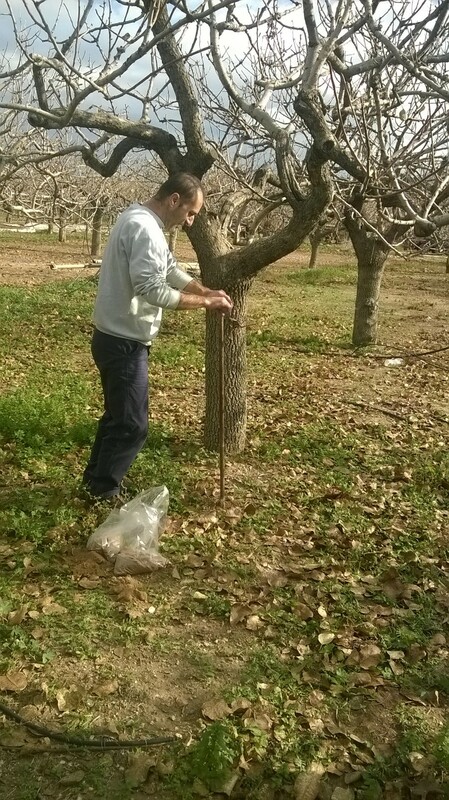 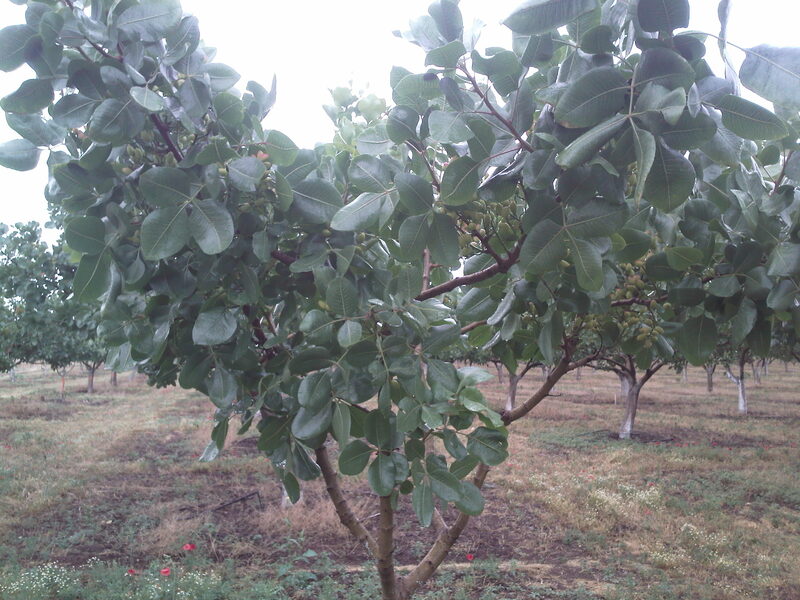 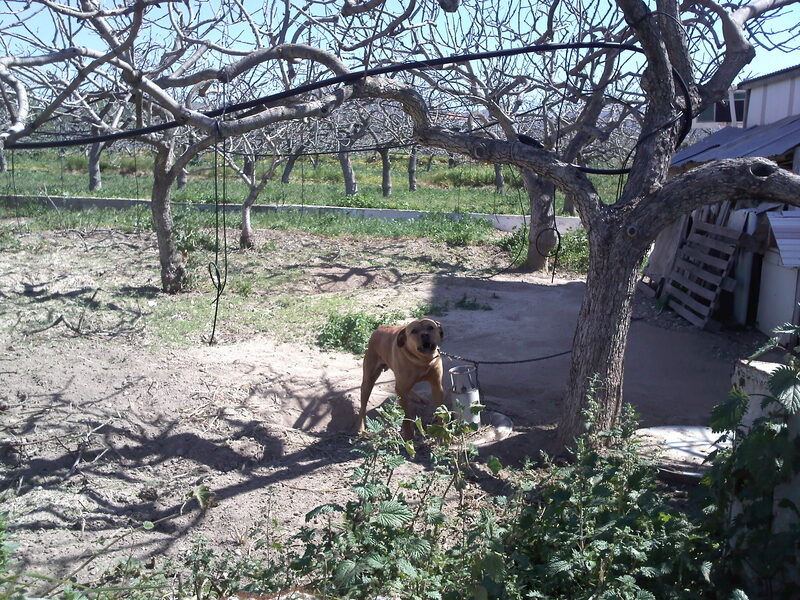 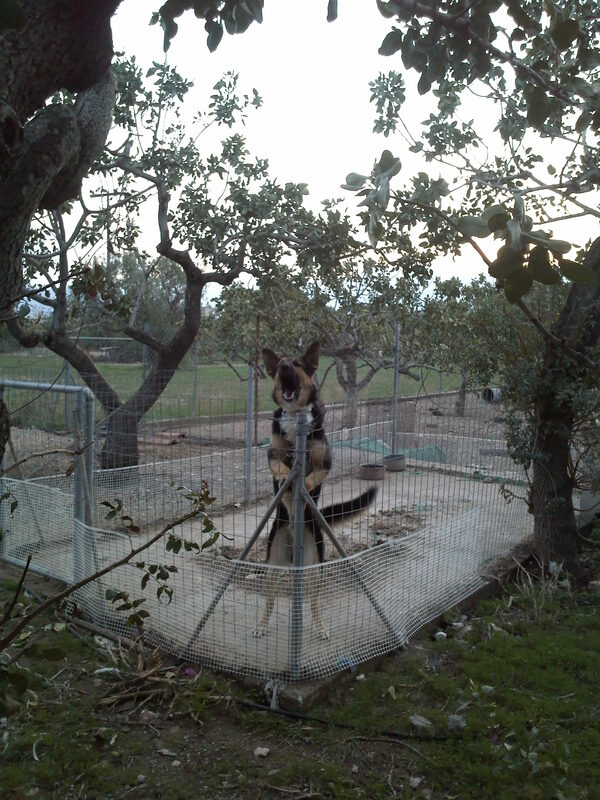 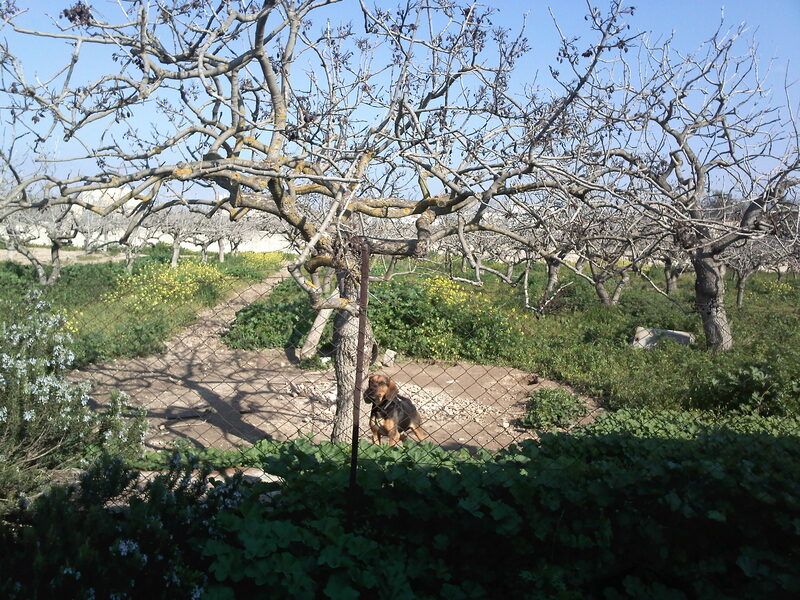 Leaves were collected from pistachio trees (Pistachia vera L) from different cultivated field in Aegina. 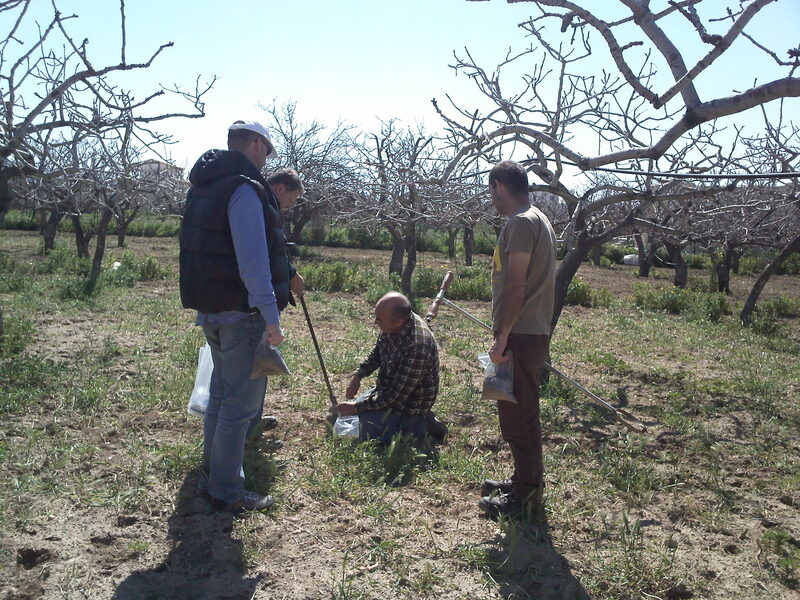 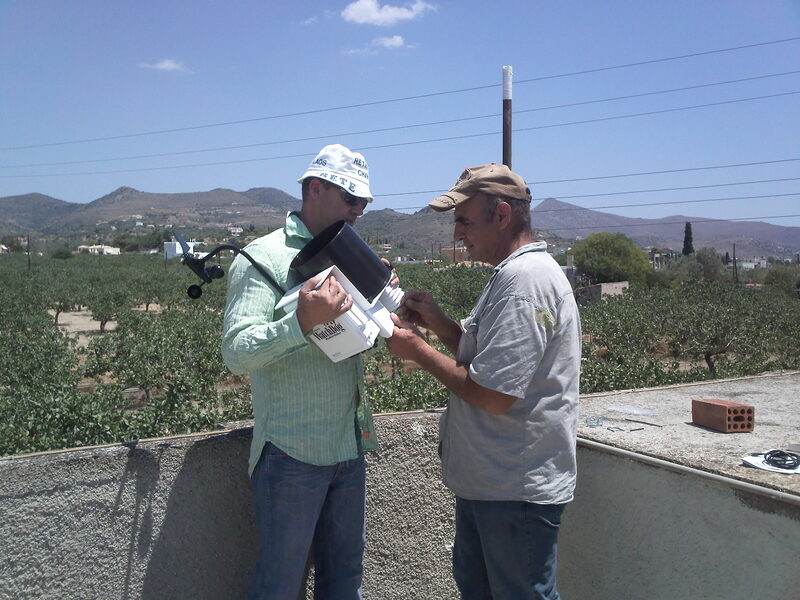 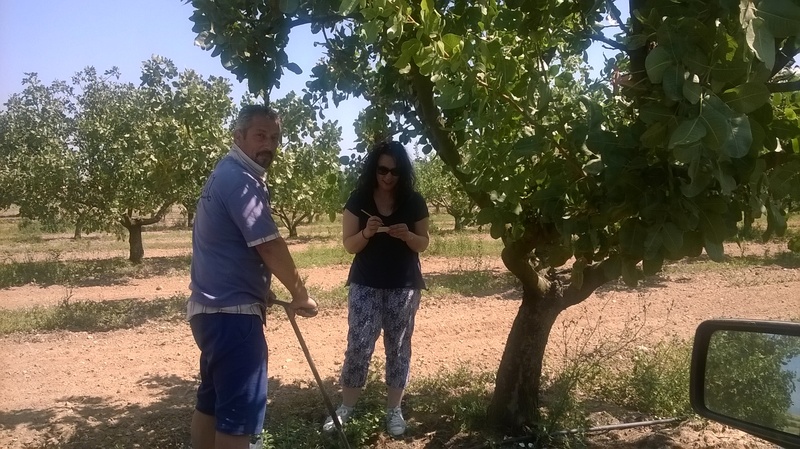 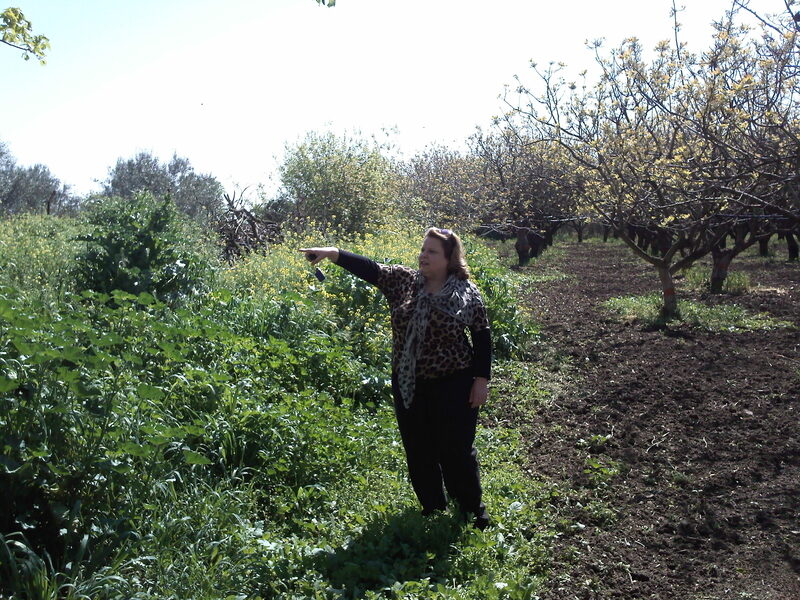 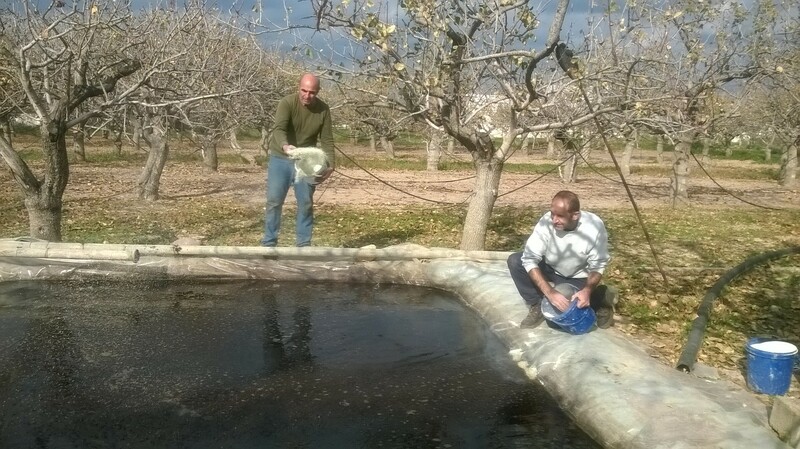 in August 2013, Dr. V. Kavvadias and Prof. A. Assimakopoulou visited many fields in Aegina, discussed with farmers and collected many leaves samples. 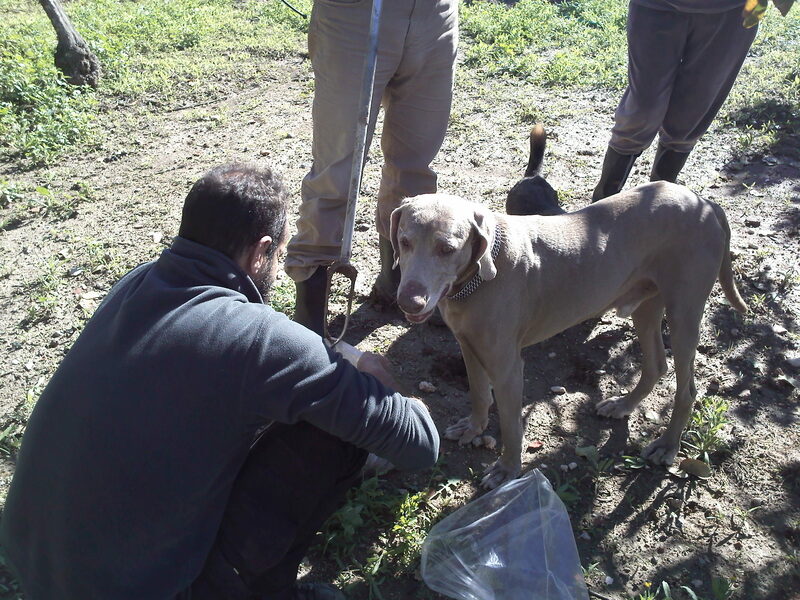 From the samples collected, it was obvious that different causes result in different types of toxicity. 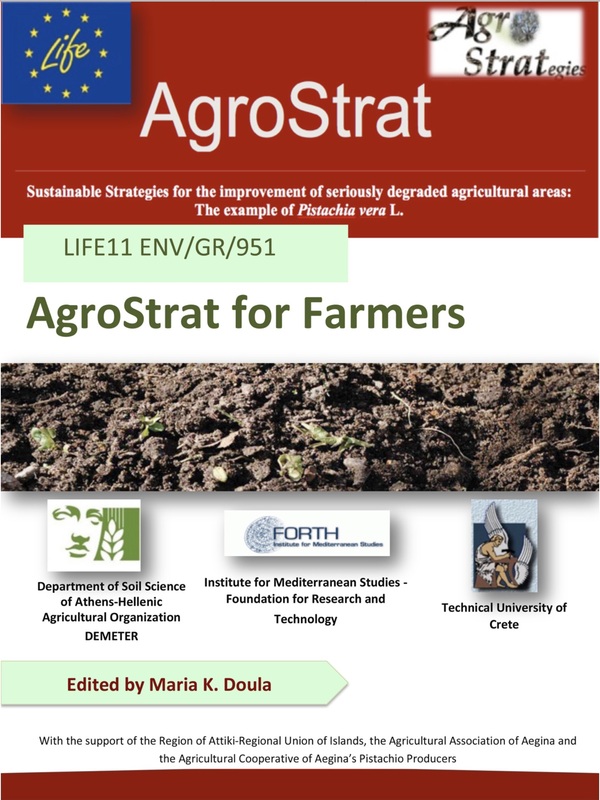 AgroStrat thanks prof. Assimakopoulou for her contribution. 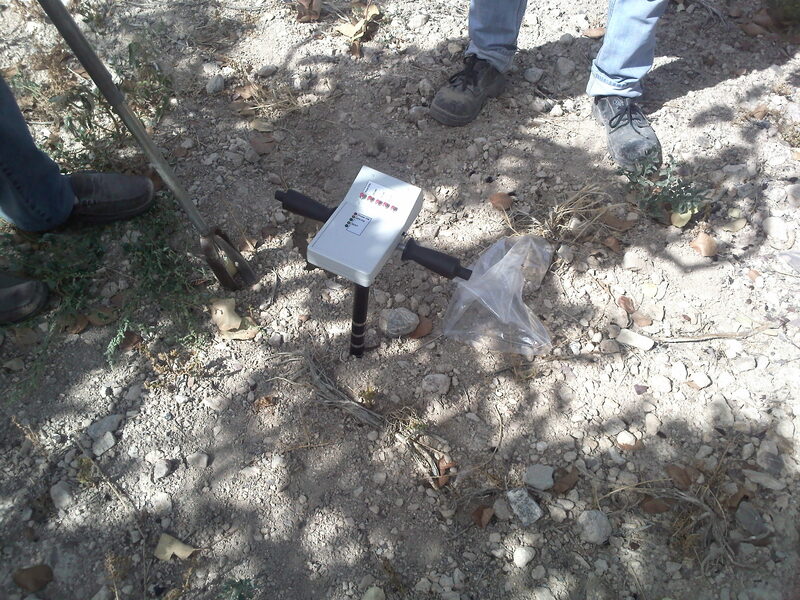 The second soil and water sampling campaign took place in July 2013 by the scientific team of SSIA. 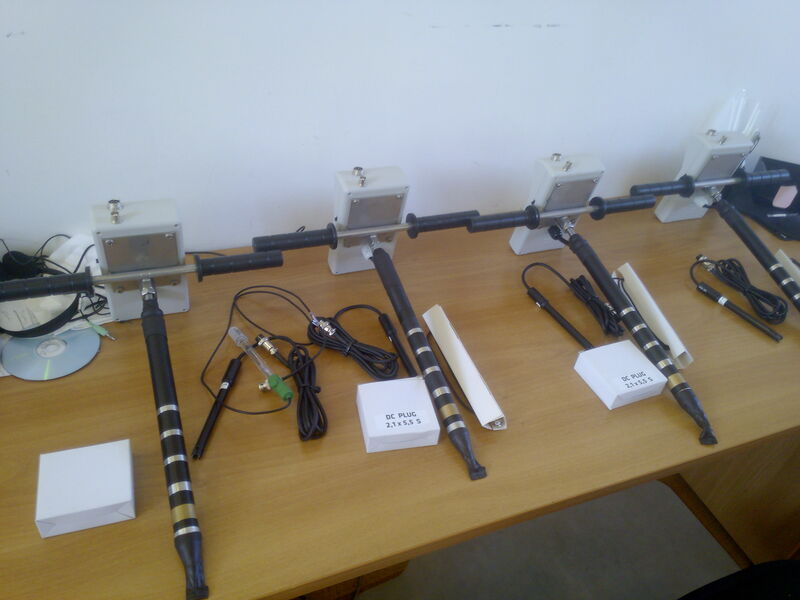 A meteorological station was installed at a pilot field. 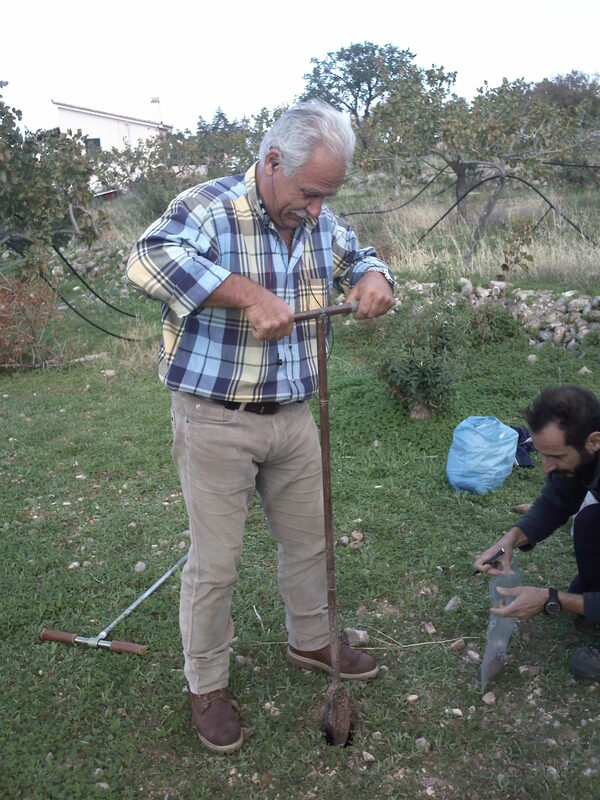 Photos during soil mapping of the Aigina Land: the main soil types were described through profiles. 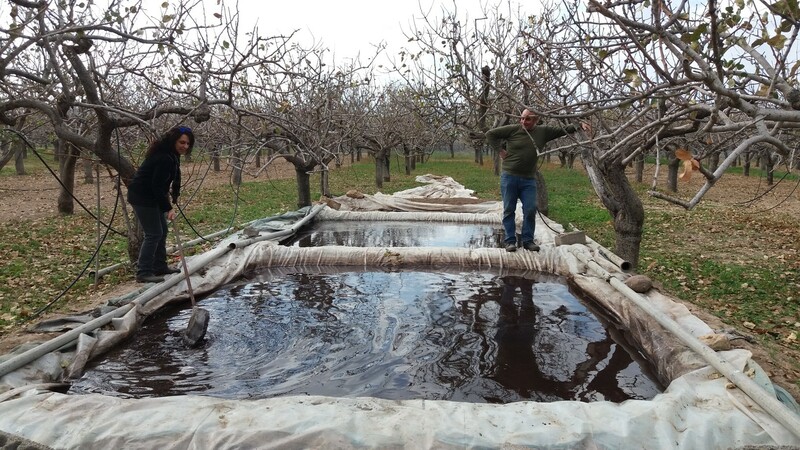 Water permeability was determined, as well. 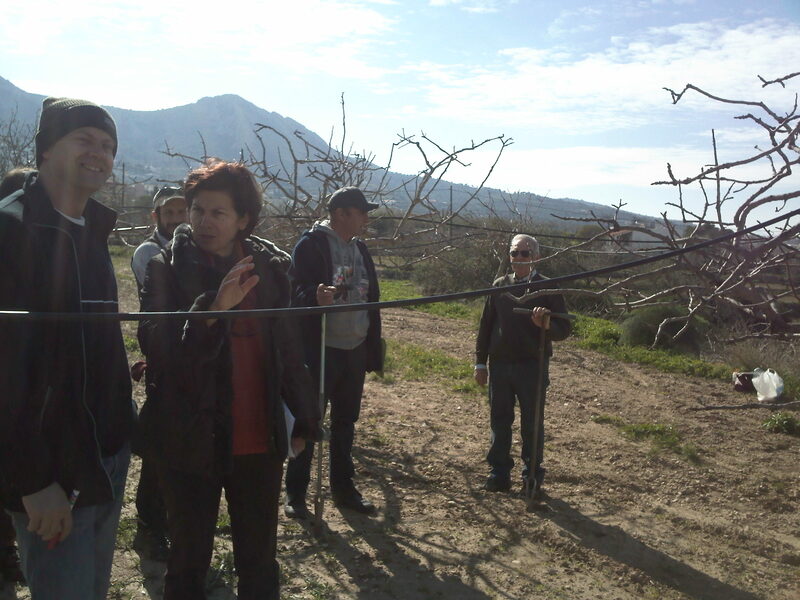 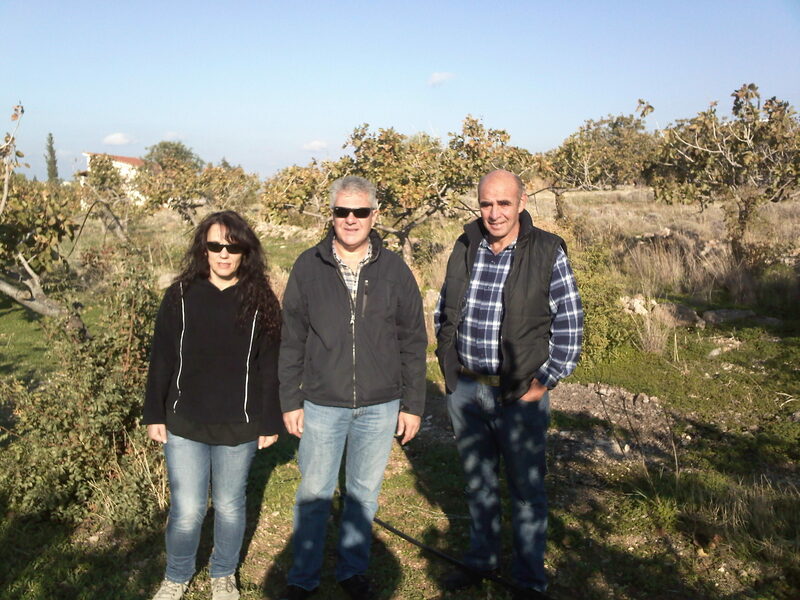 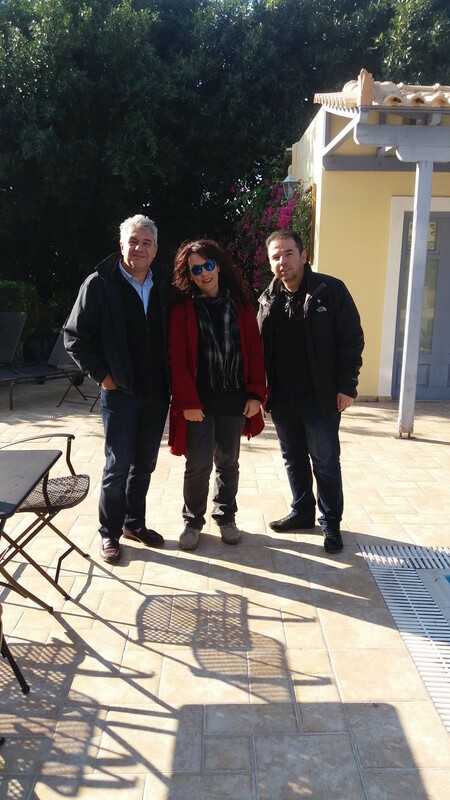 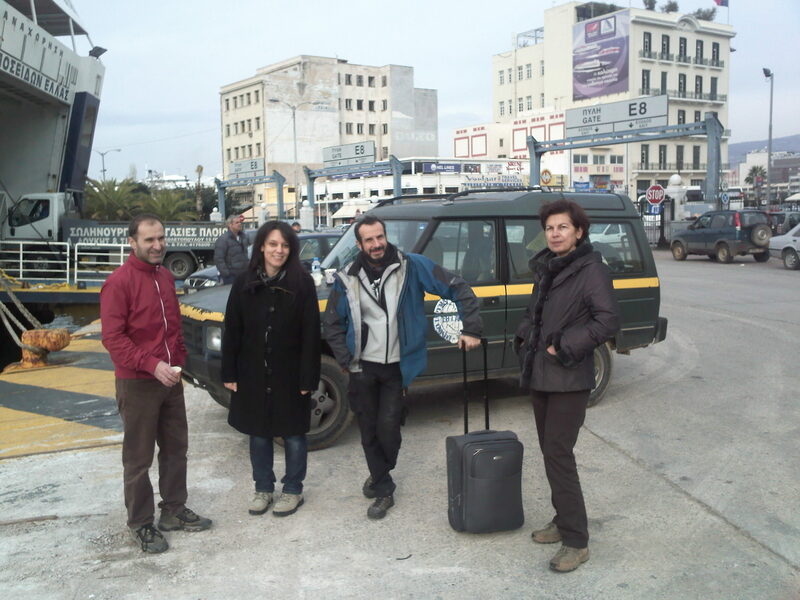 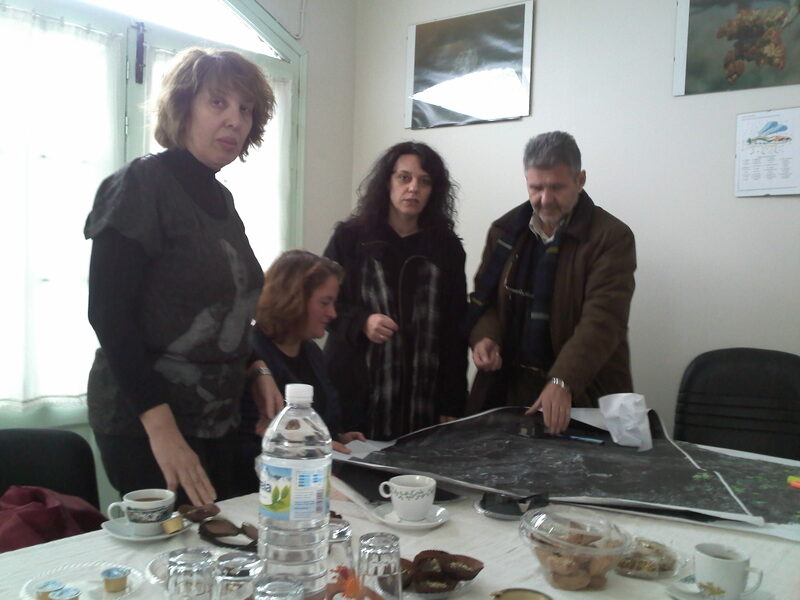 The sampling team of SSIA (Dr. M. Doula, Dr. V. Kavvadias, P. Tountas and A. Tsoutsikos) visited Aegina in March 2013. 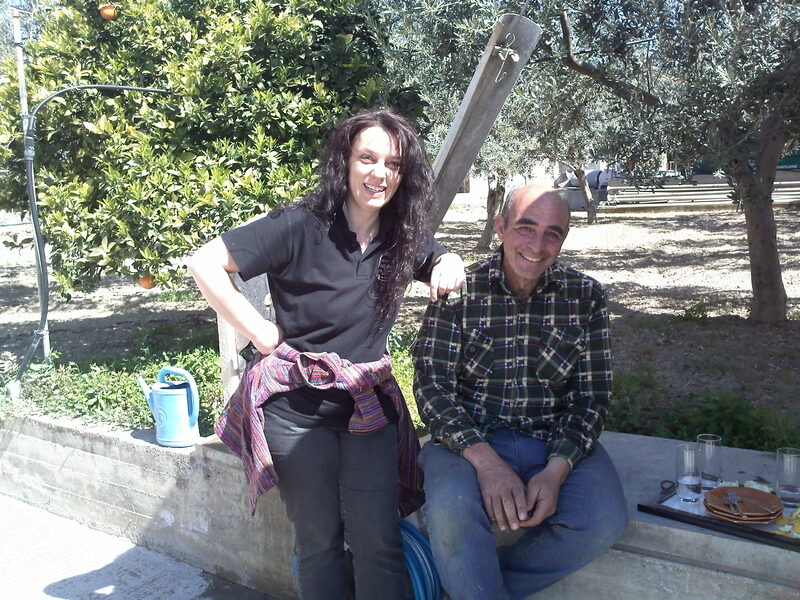 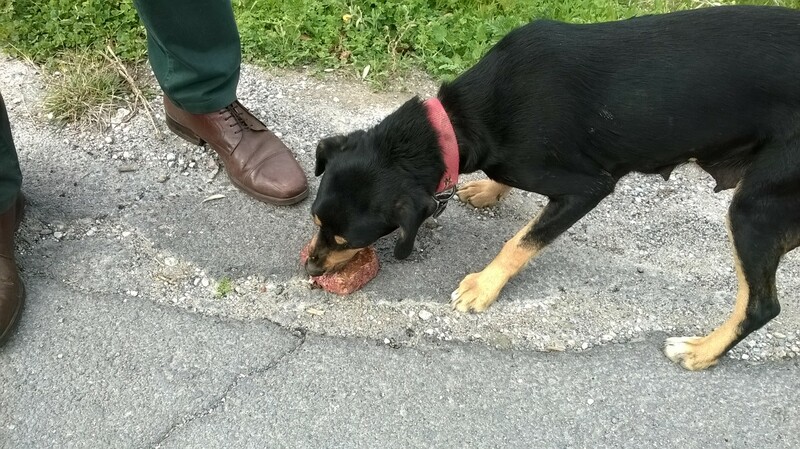 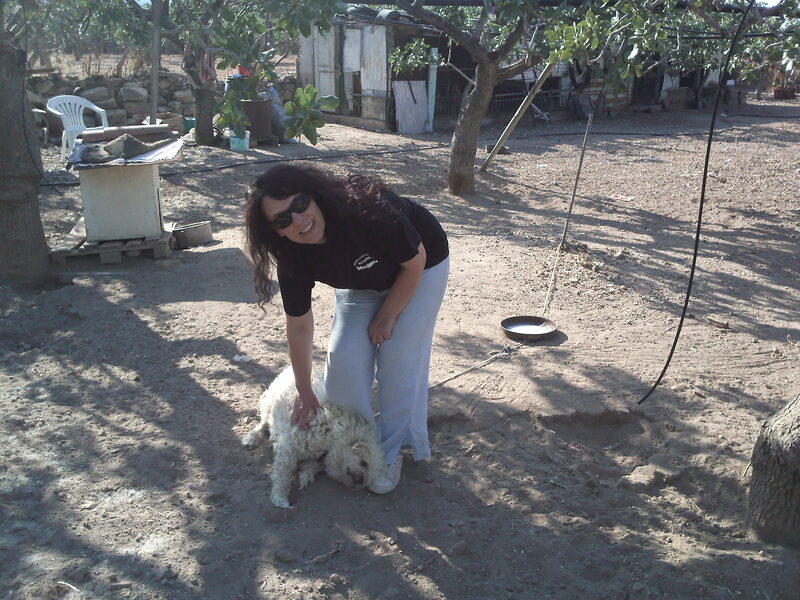 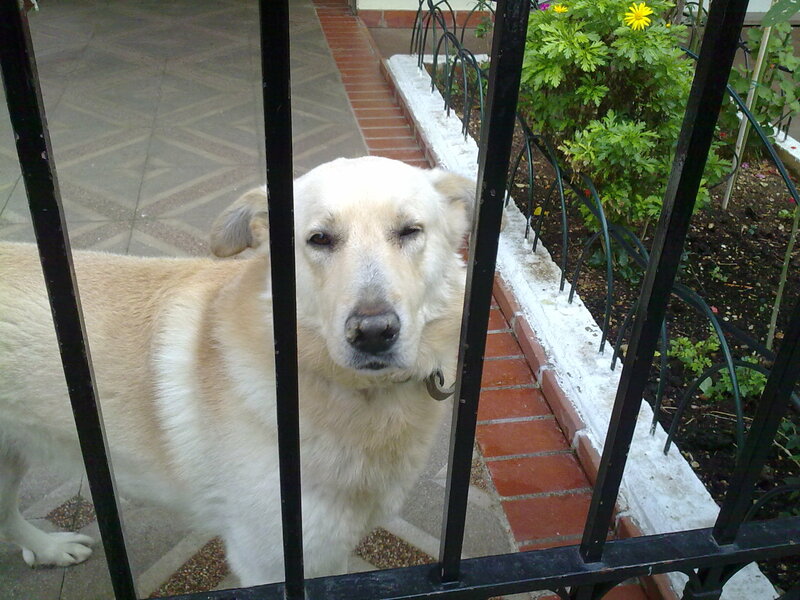 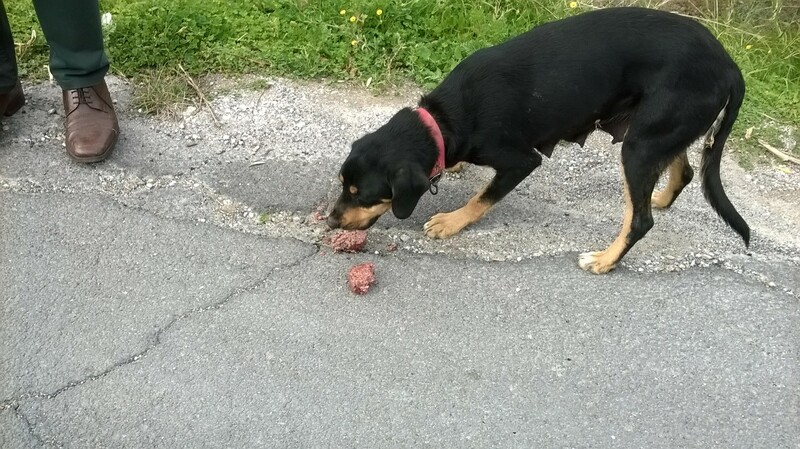 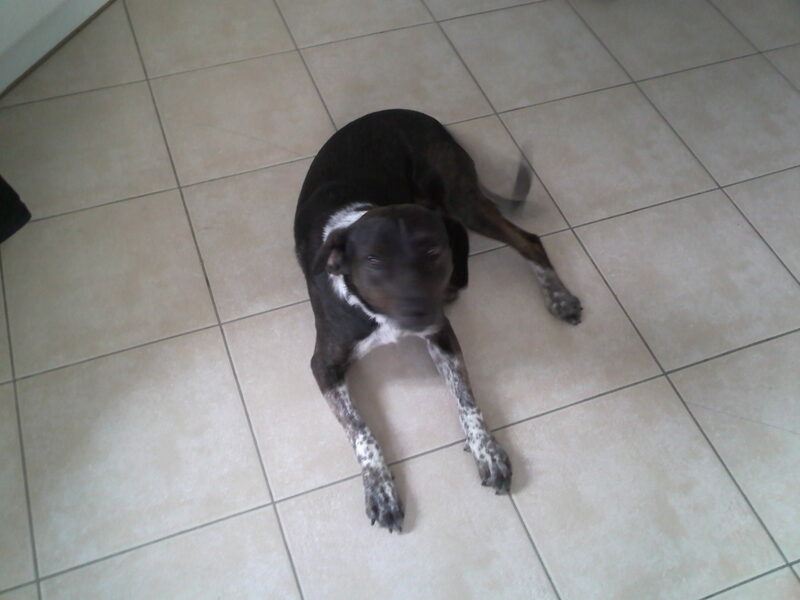 Prof. Assimakopoulou participated also in the sampling campaign. 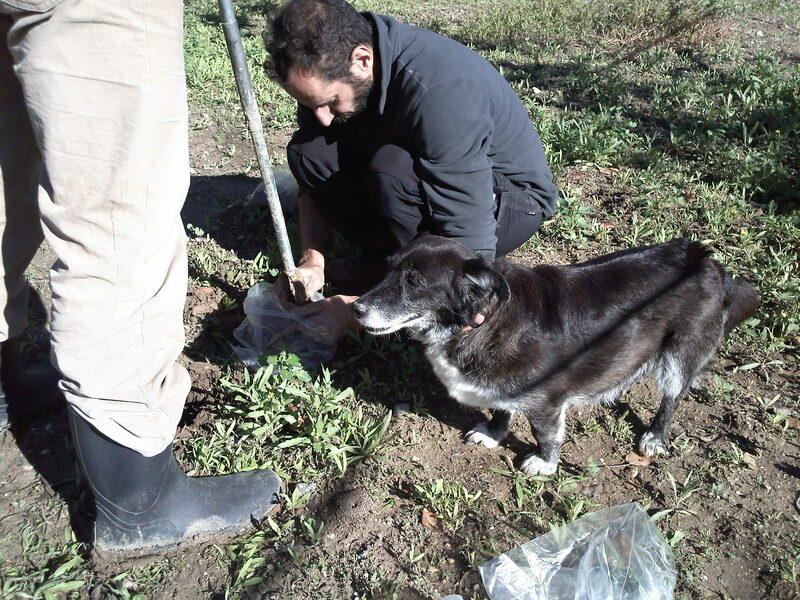 During the sampling, more that 280 soil samples and 15 water samples were collected. 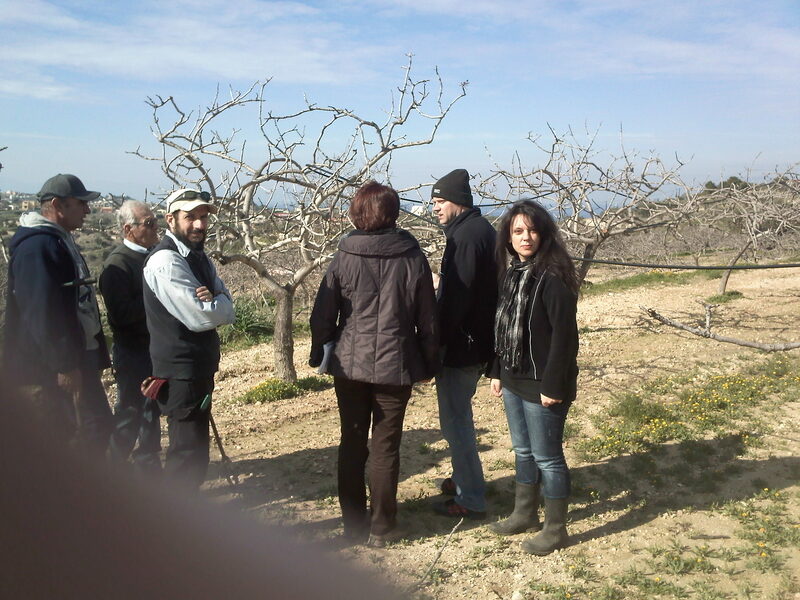 Meetings were organised in Aegina on 5-7 December 2012 between representatives of the SSIA team (Doula, Kavvadias, Theocharopoulos), two representatives of the Region of Attiki (Ms. Rafti, and Ms. Chatziperi), pistachio producers and also Mr Alifantis (the president of the Agricultural Association of Aegina). 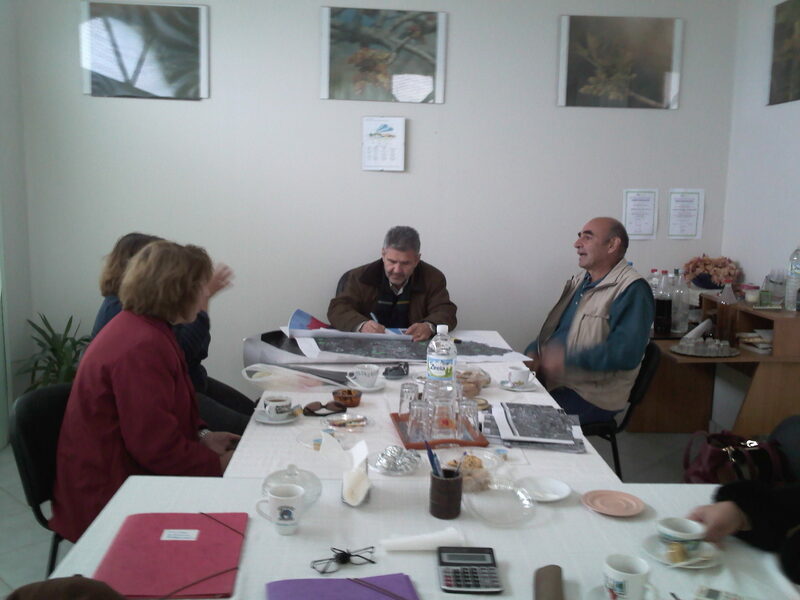 During the meetings several issues were discussed regarding soil/water sampling. 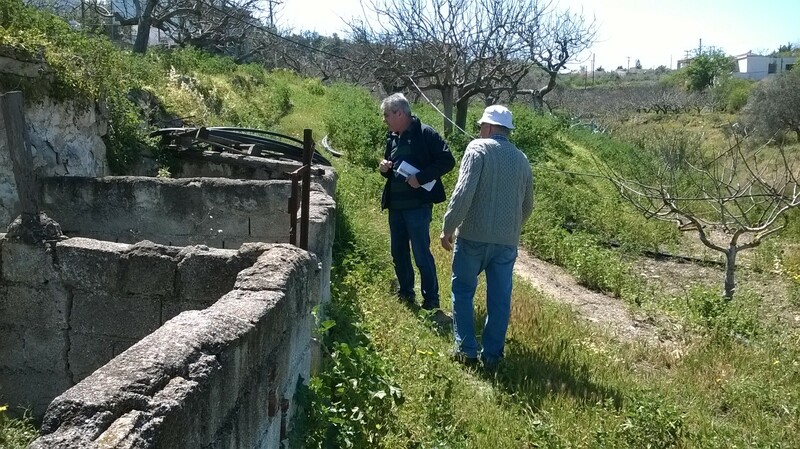 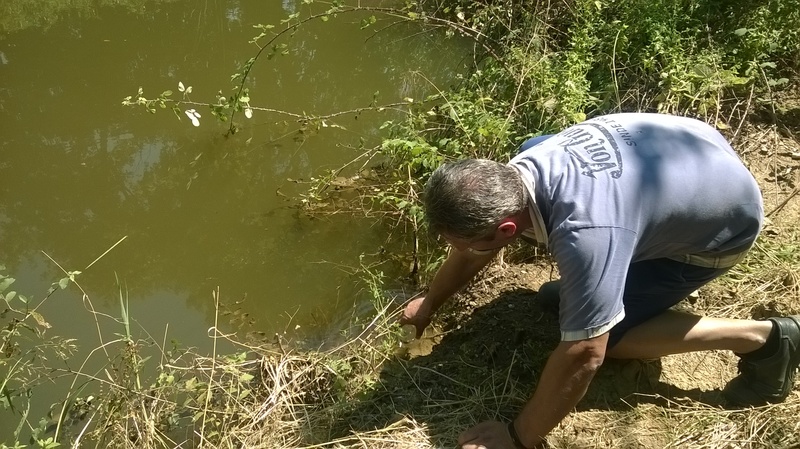 The scientists visited many fields and also other areas of interest (water bodies, wastes disposal areas) and performed preliminary a geomorphological assessment of the area. 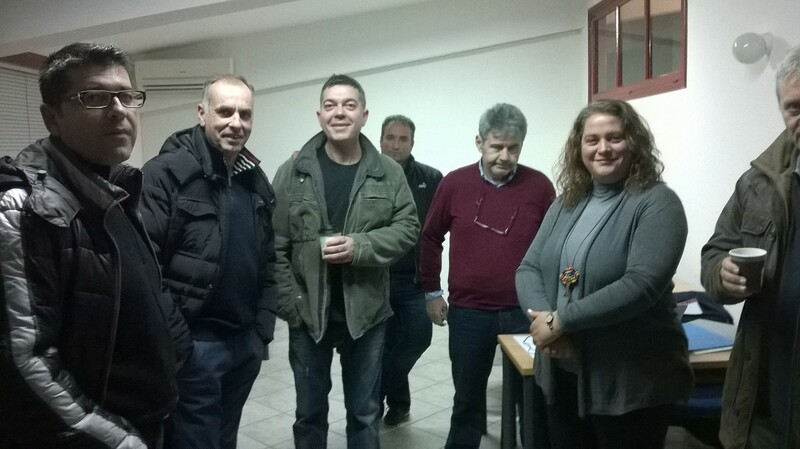 On 6 December, 2012, the team visited the Mayor of Aegina, Mr Sakkiotis. 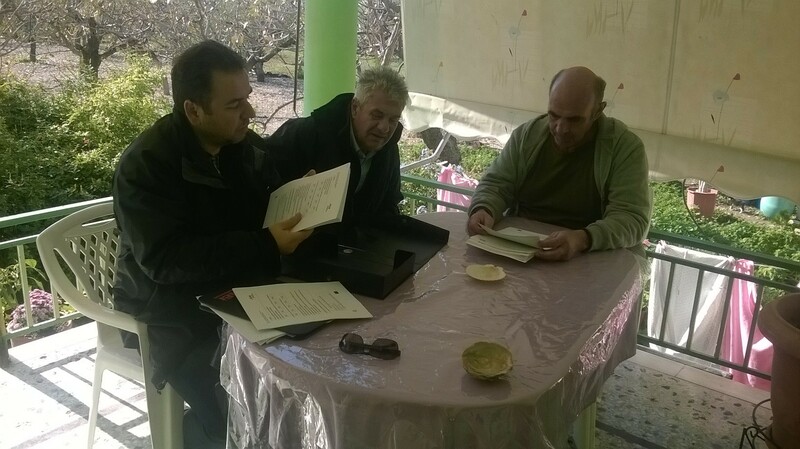 Contacts and discussions with local societal groups took also place.